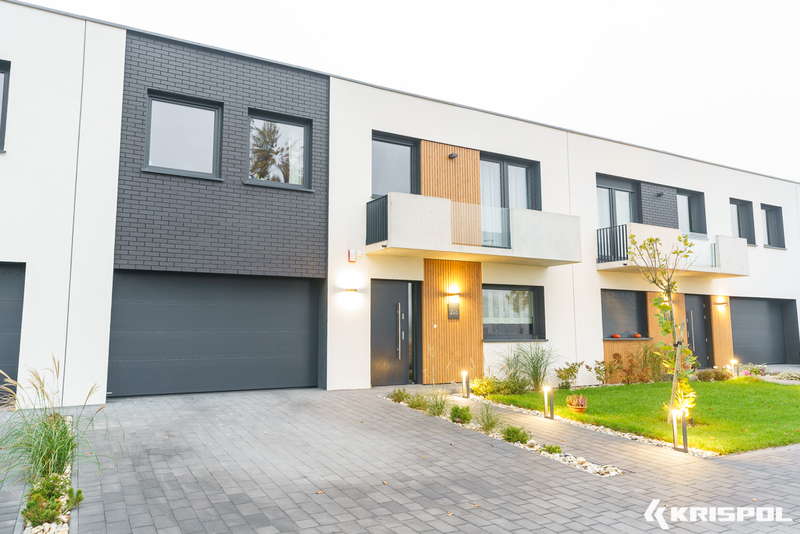 appearance matches the façade of the building. 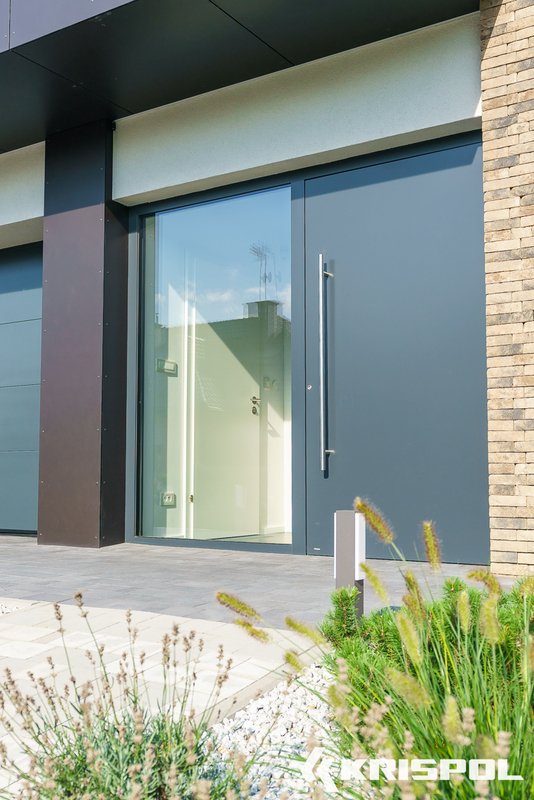 A door is one of the most important element of finishing the building. 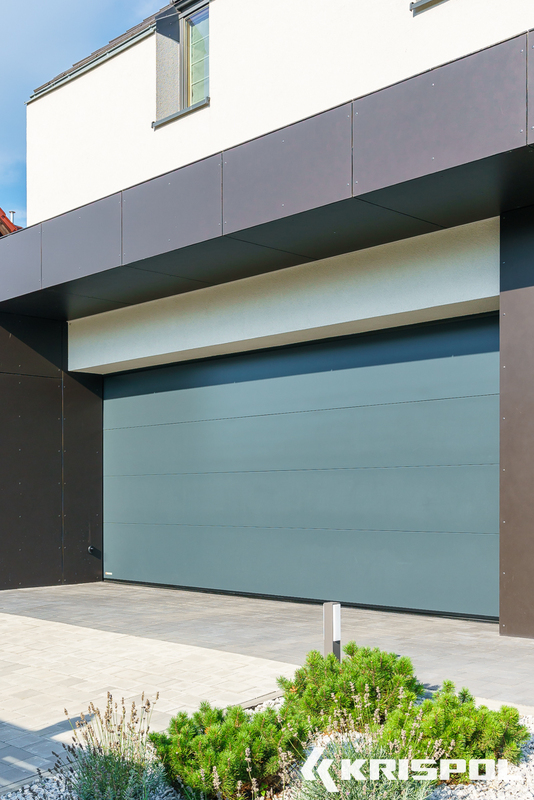 It should be functional, solid, safe and its appearance should match the façade of the building. 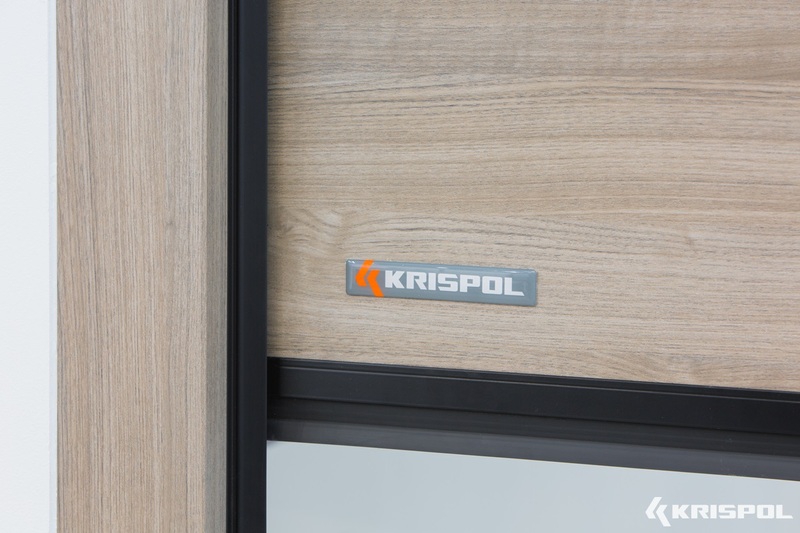 KRISPOL doors meets all these conditions. 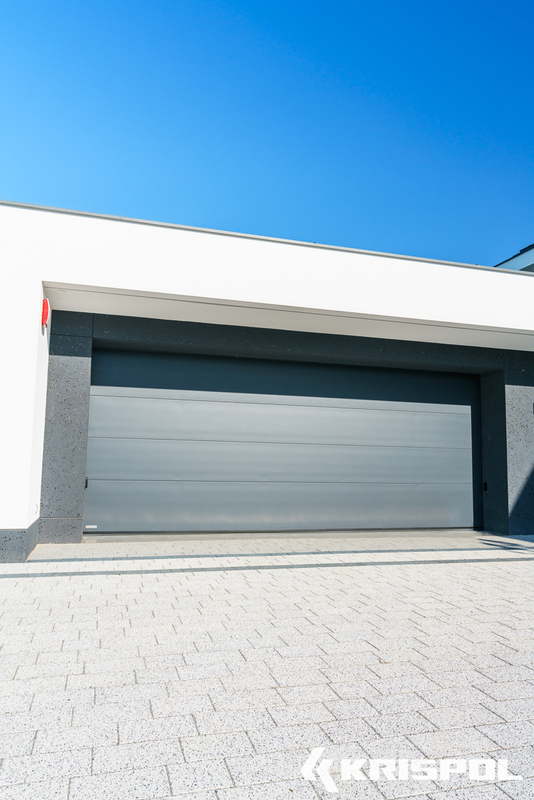 The company’s offer includes: sectional doors, rolling doors and side entrance doors. 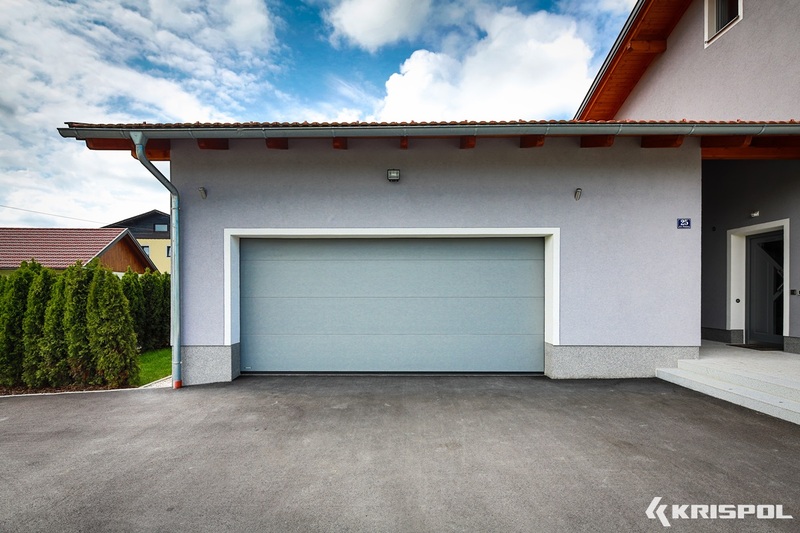 The functioning of the door allows to obtain maximum space for parking the car in the garage and on the drive. 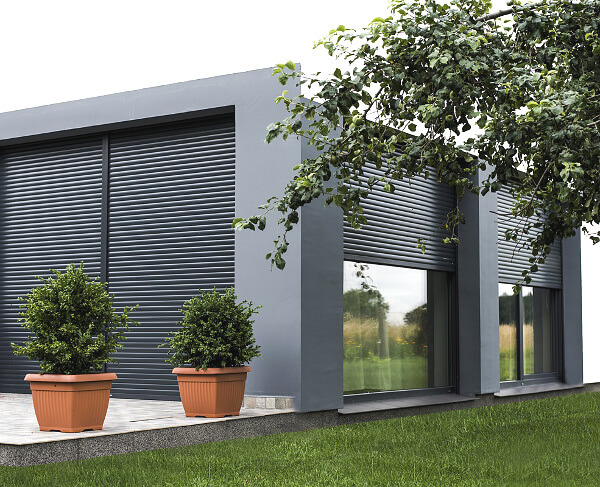 Almost unlimited possibilities of finishing allow to create innovative and original solutions. 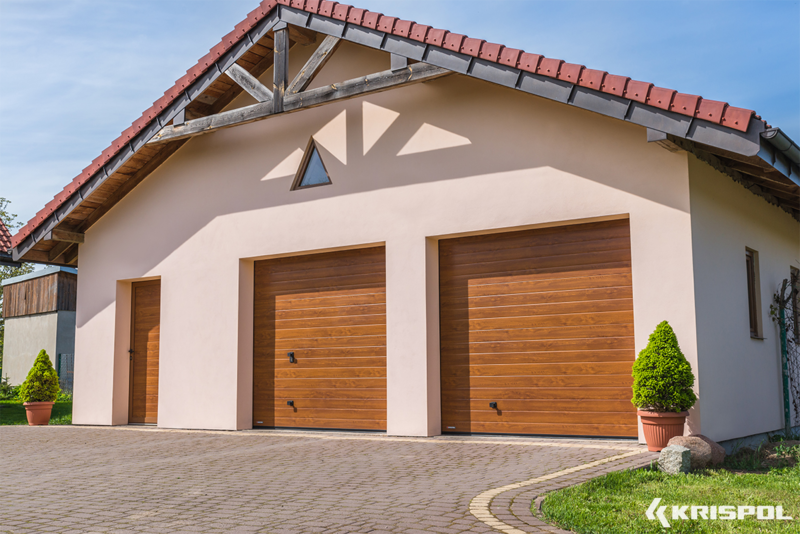 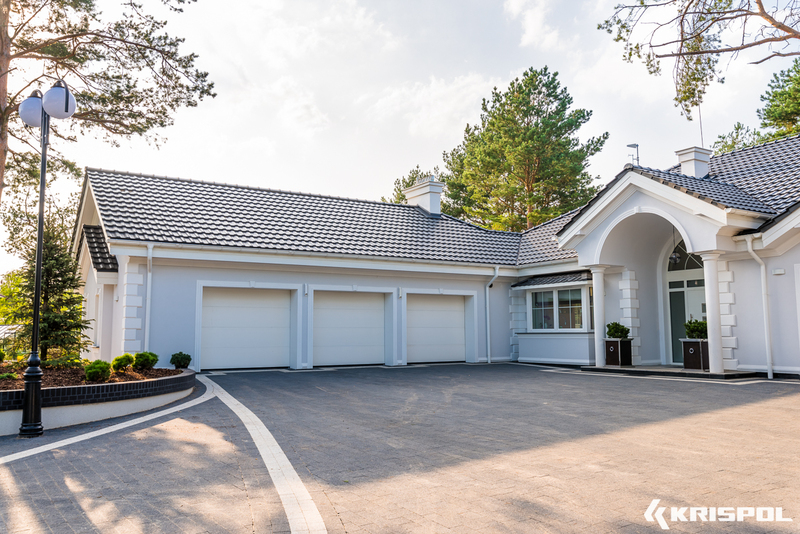 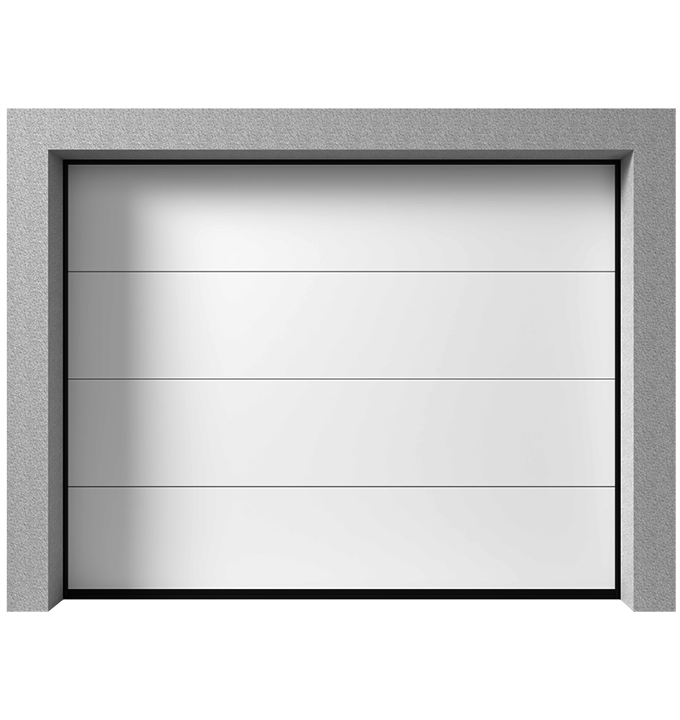 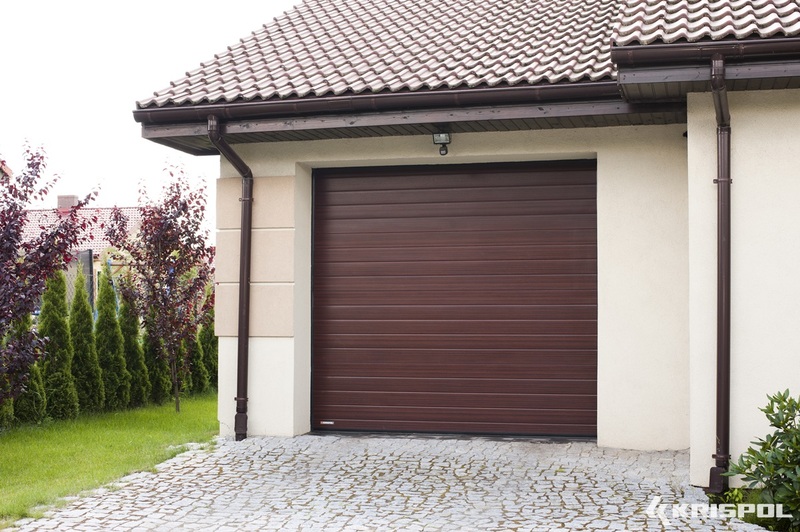 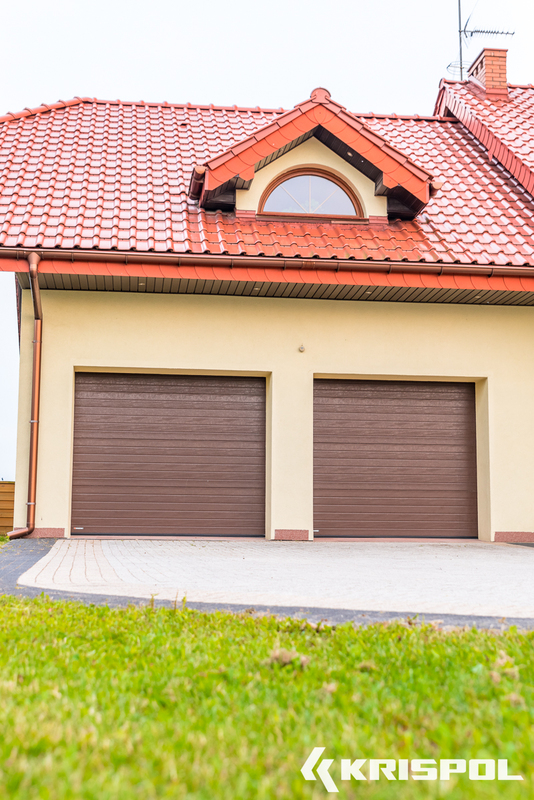 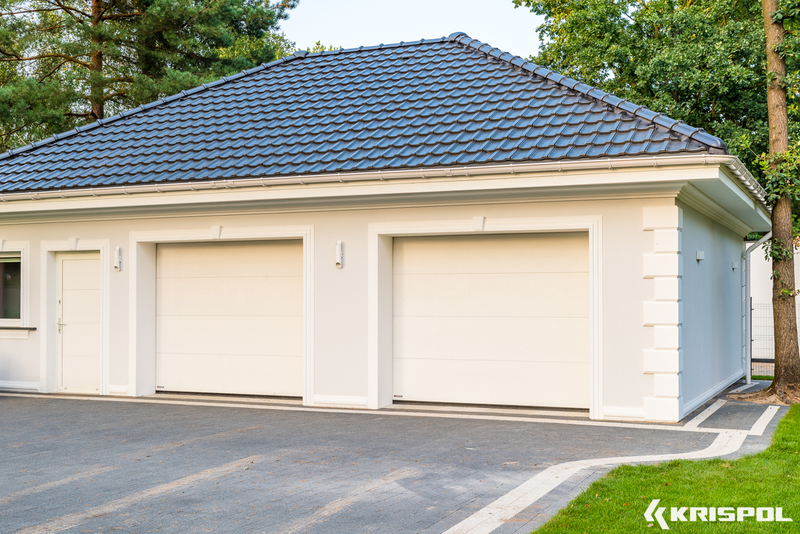 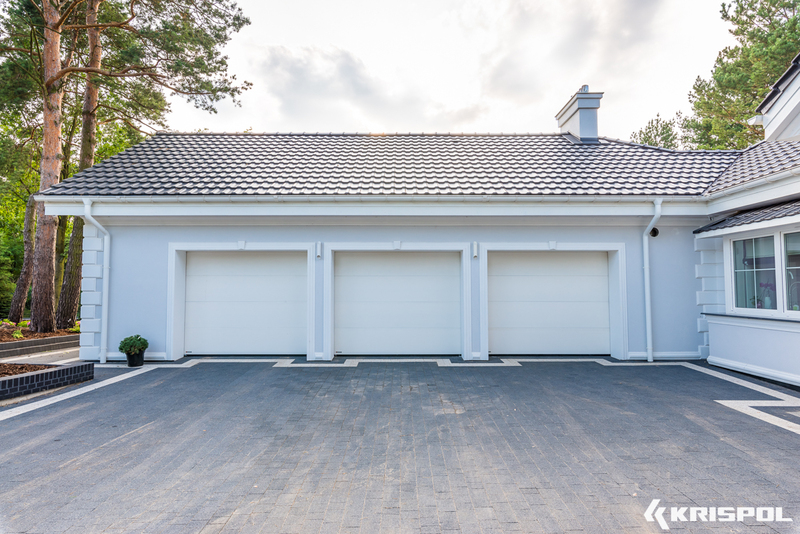 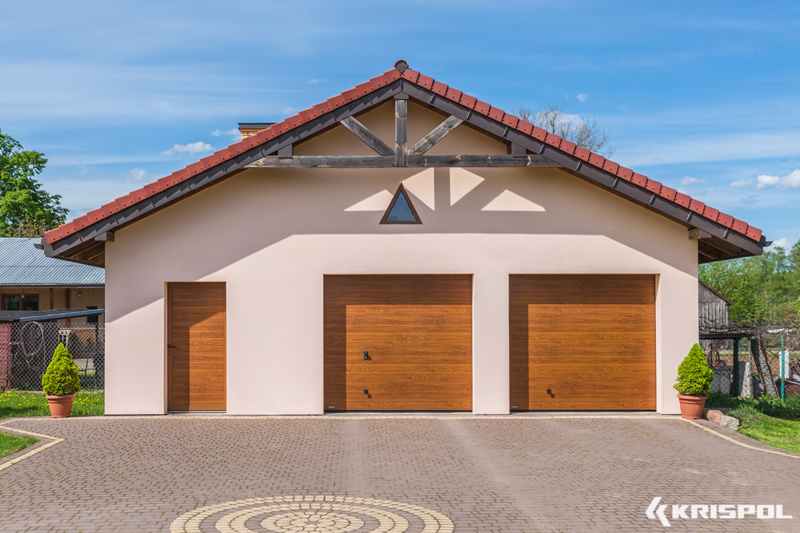 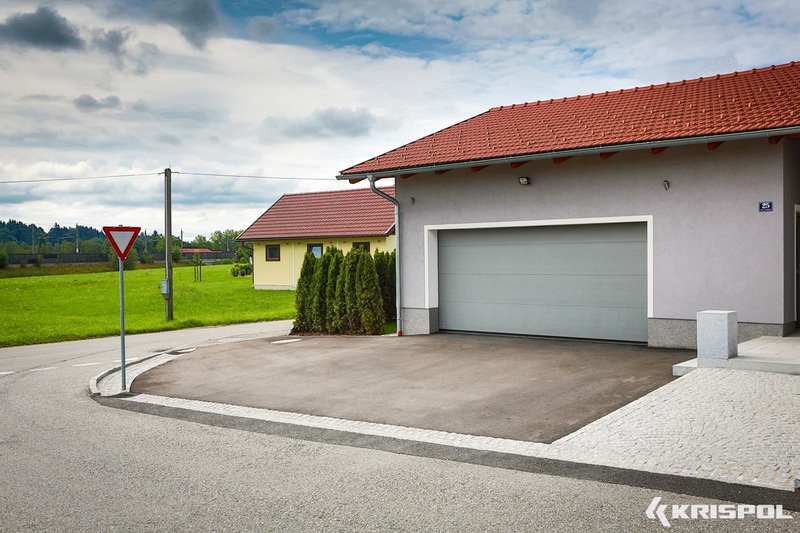 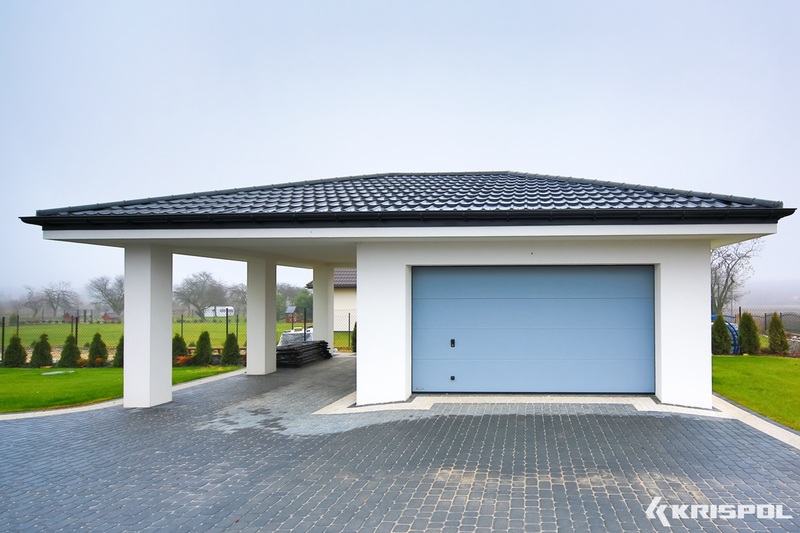 Sectional doors fit different types of garages and entrance width also for double garages. 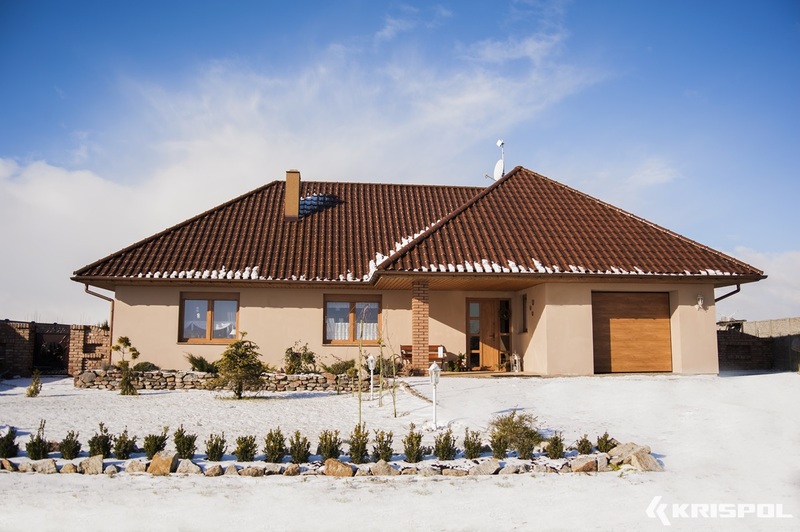 High manufacturing standard guarantees comfort of use and safety as well as perfect thermal insulation. 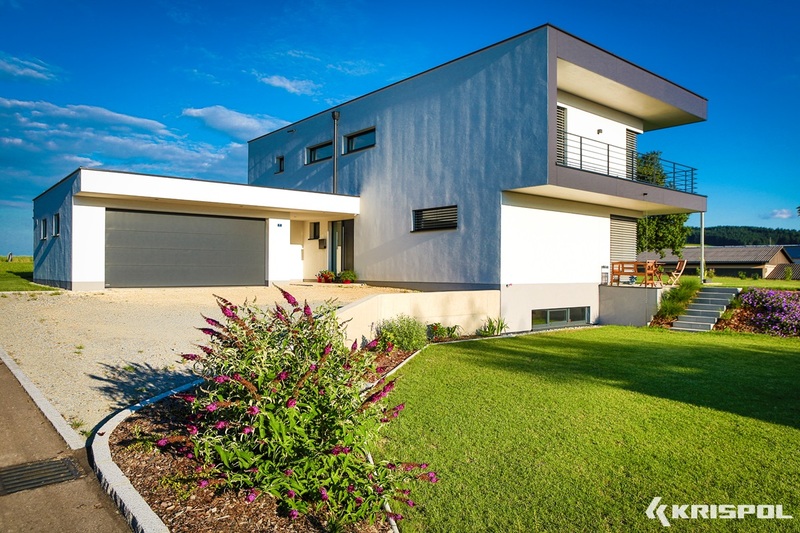 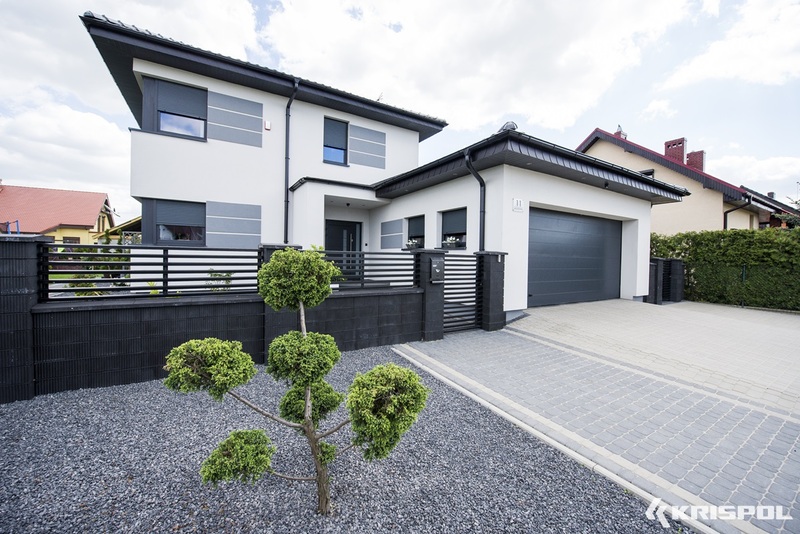 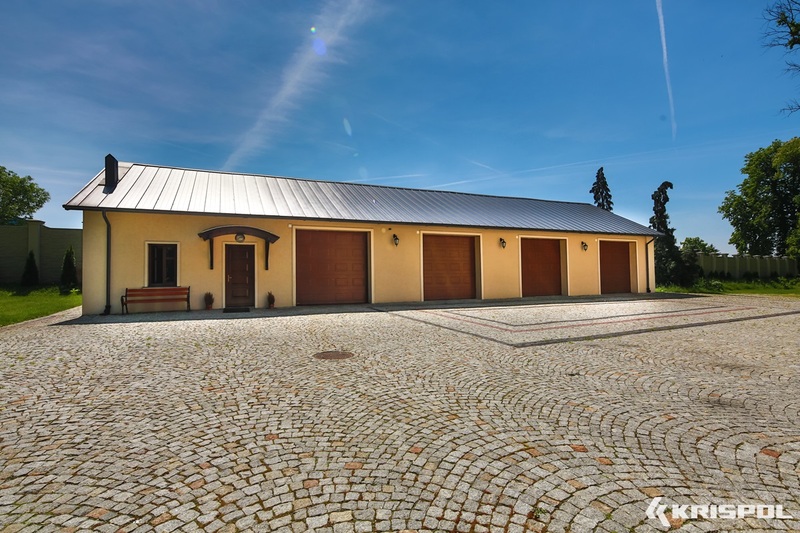 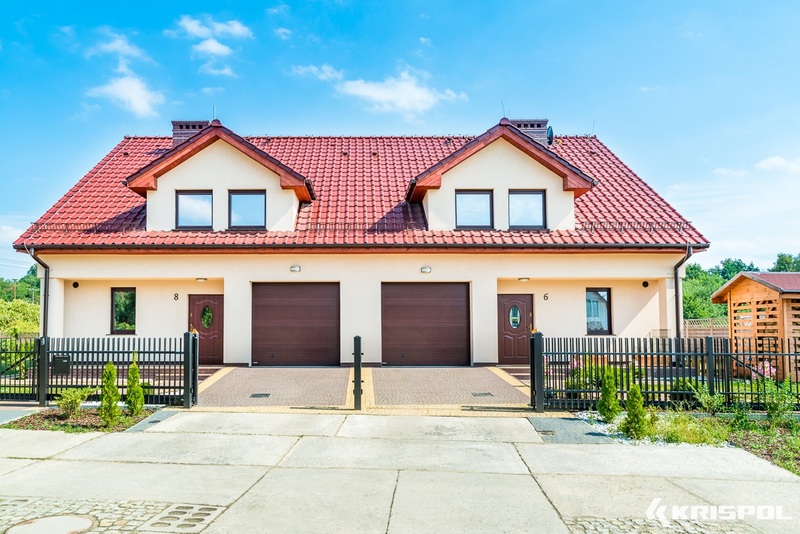 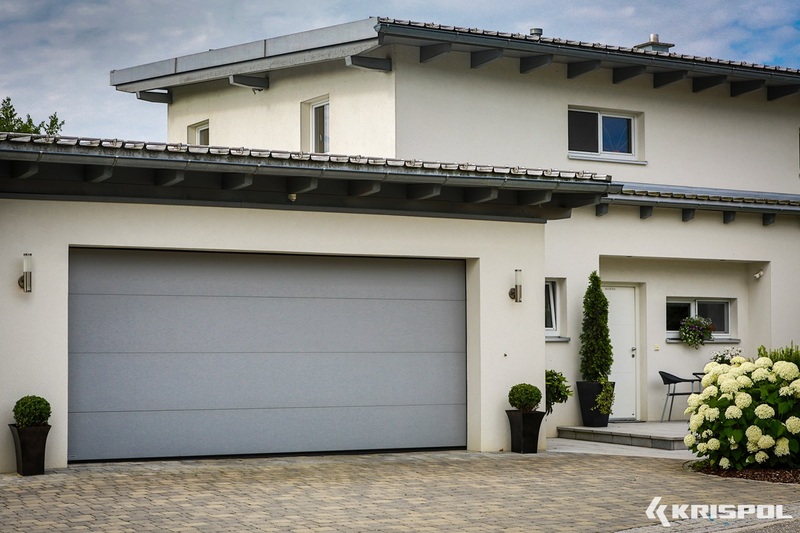 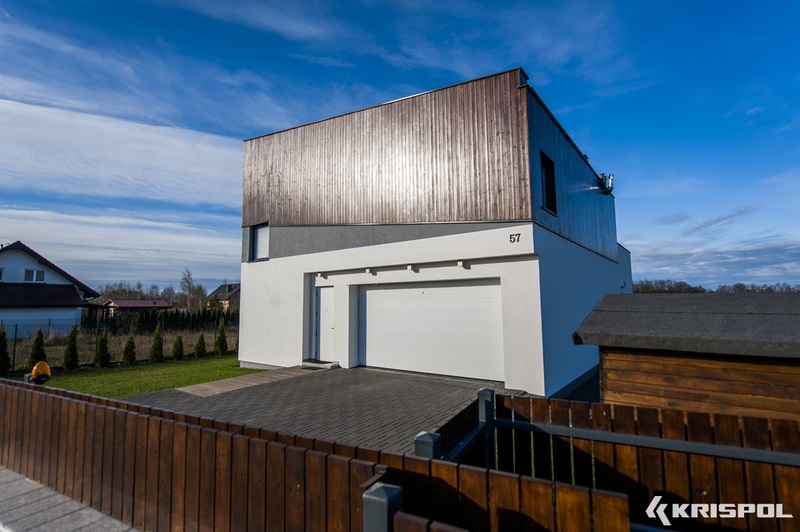 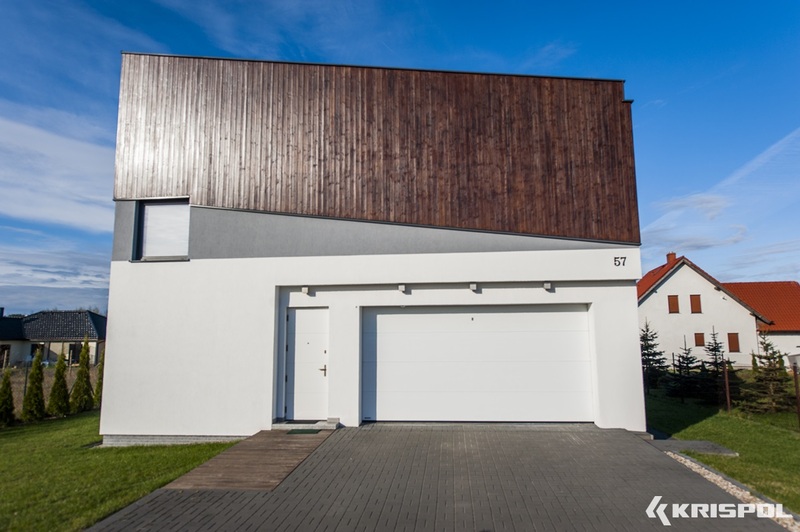 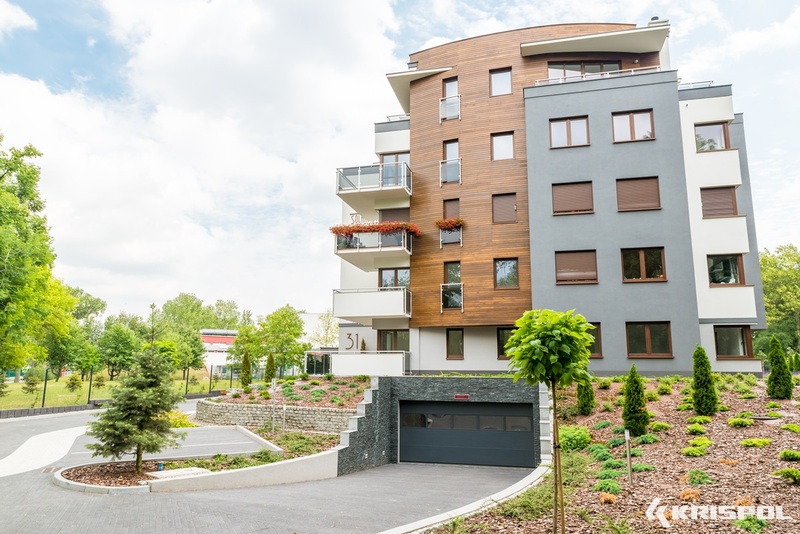 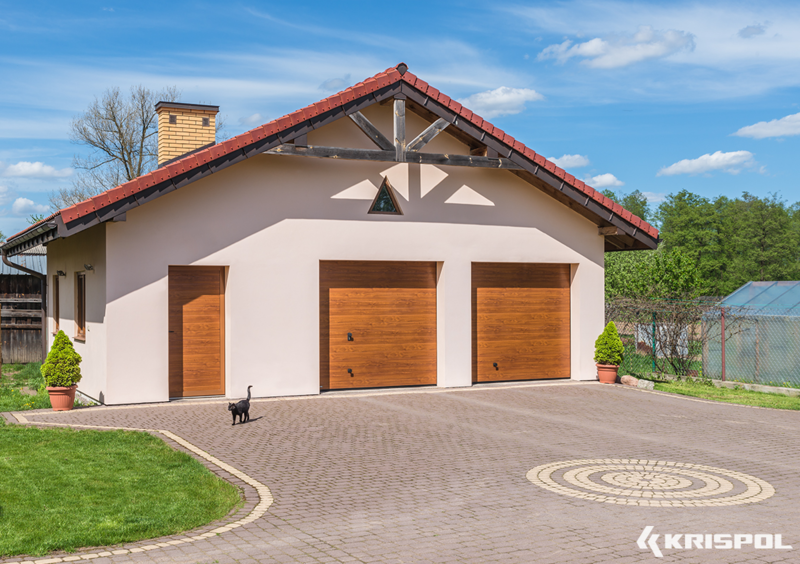 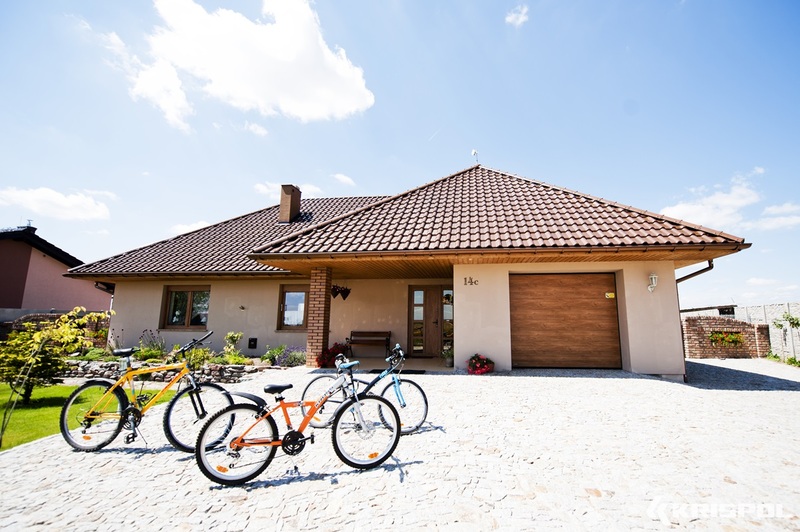 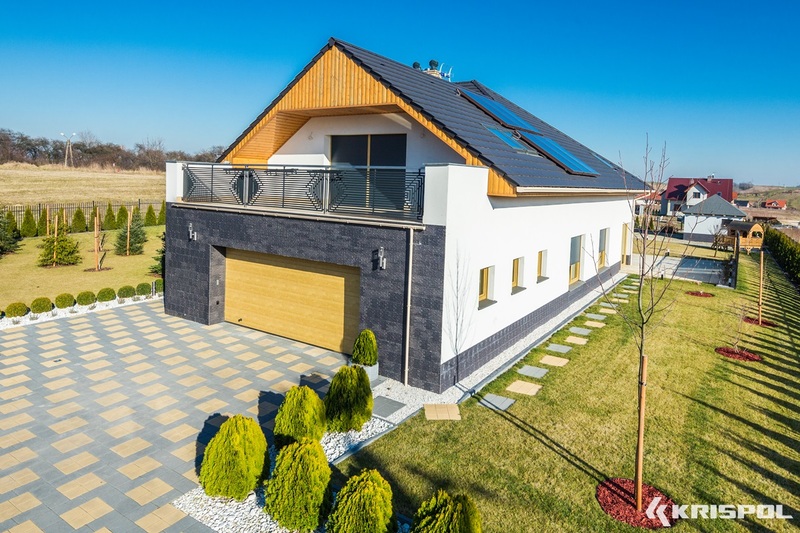 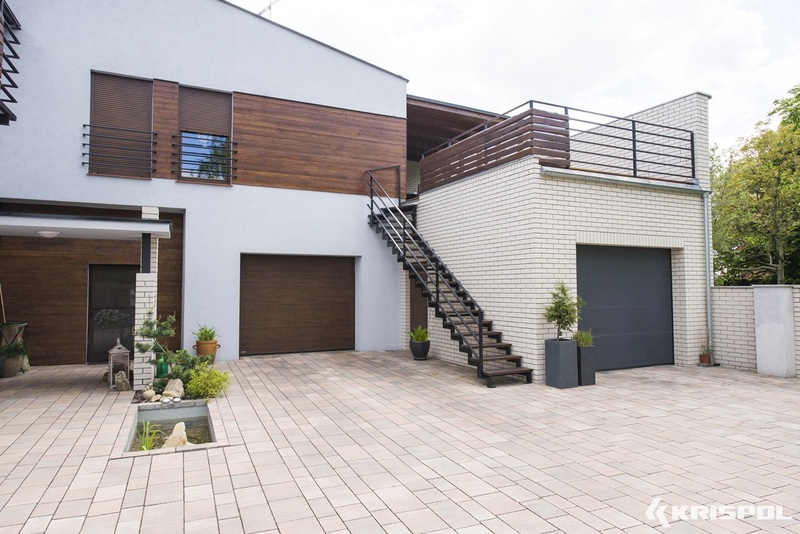 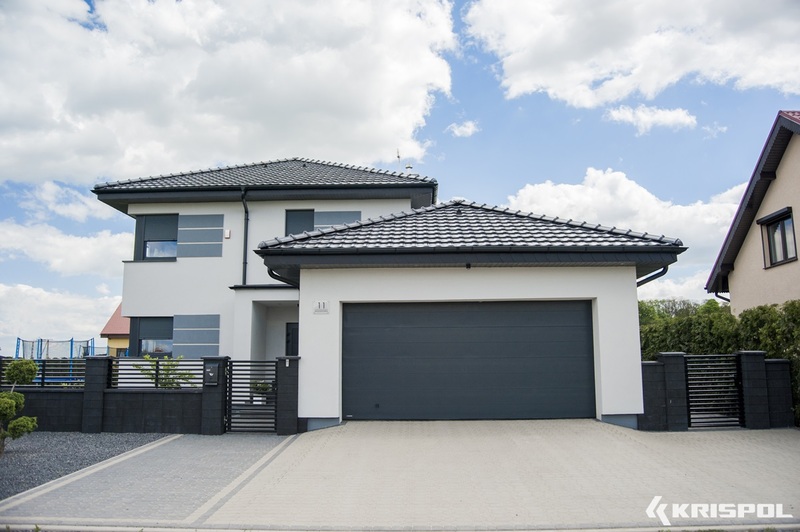 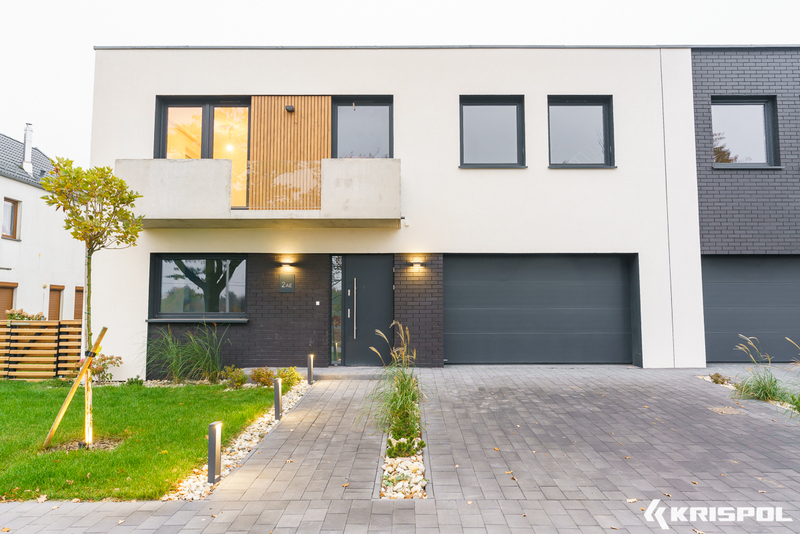 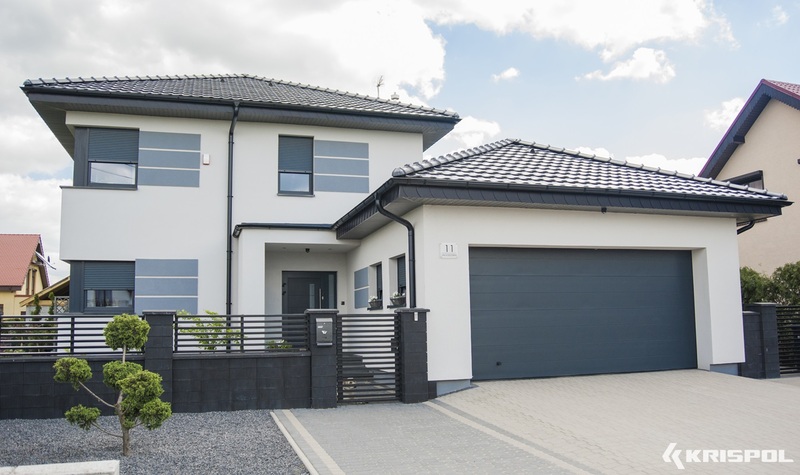 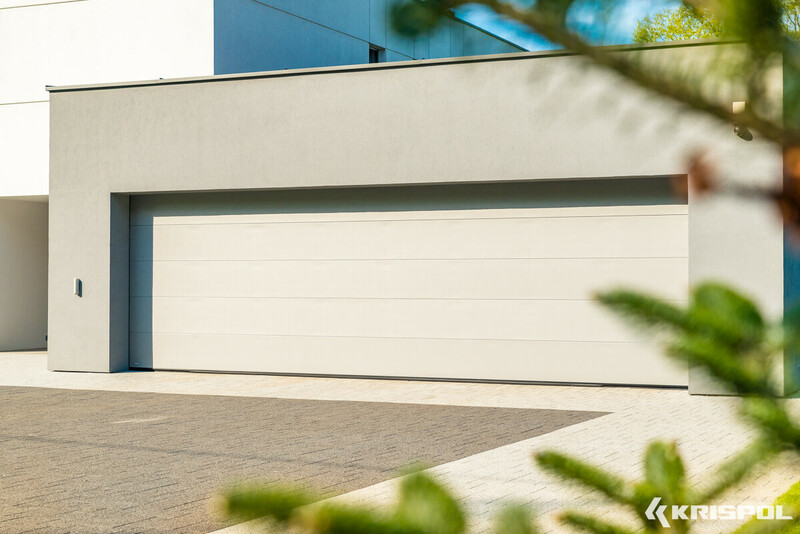 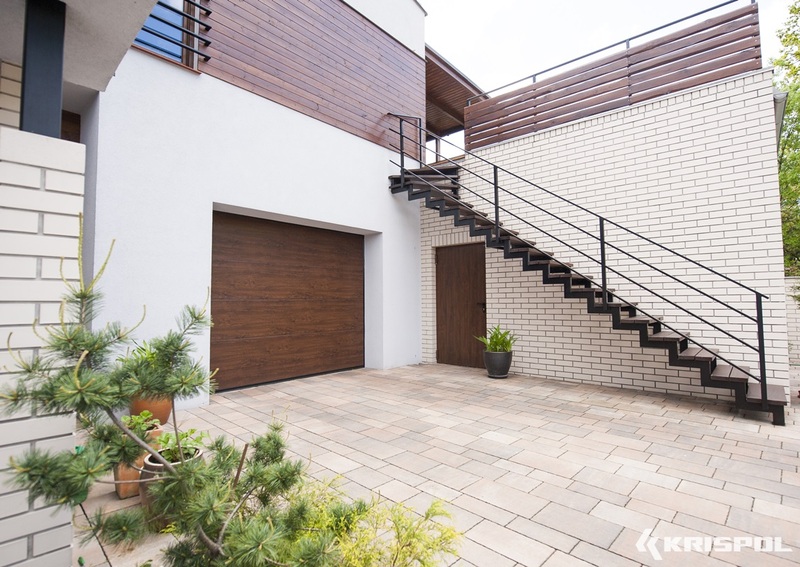 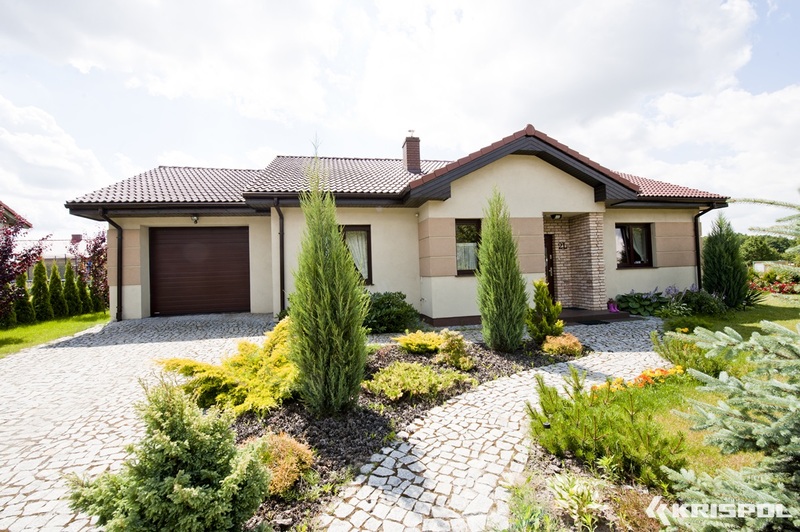 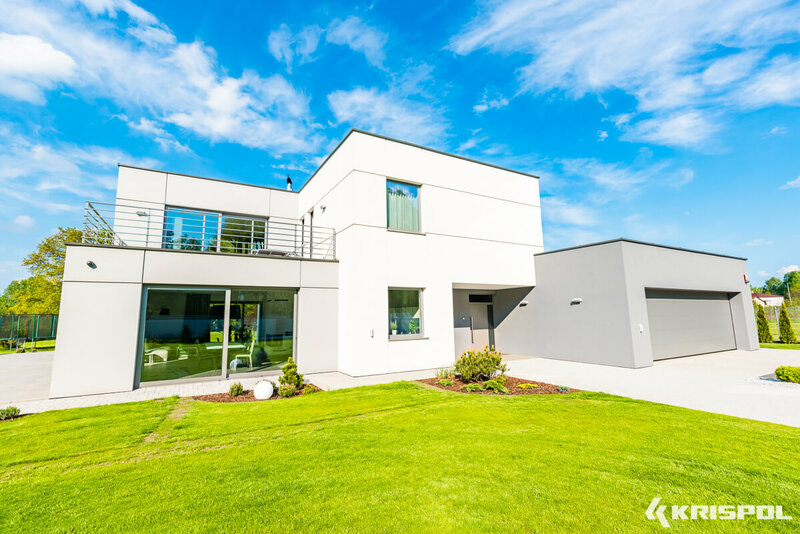 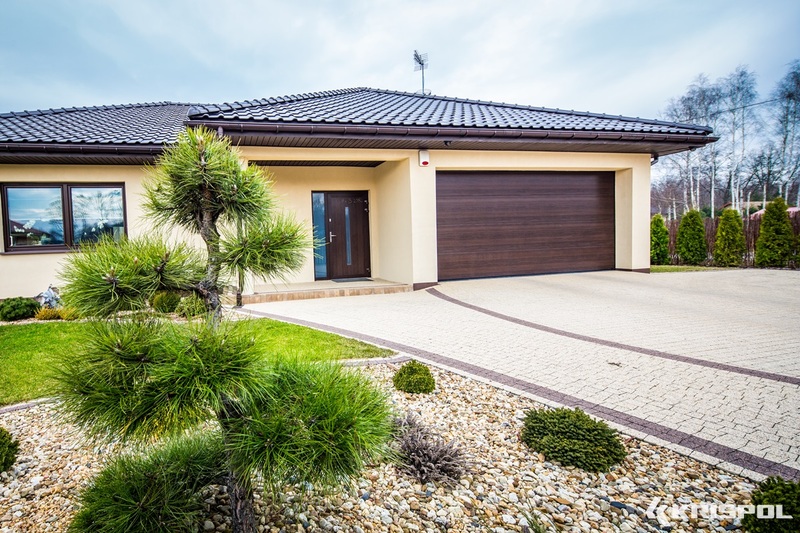 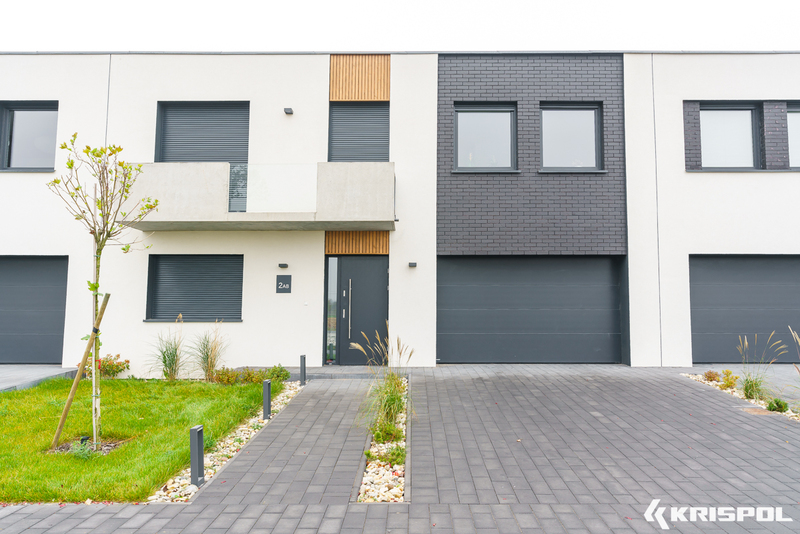 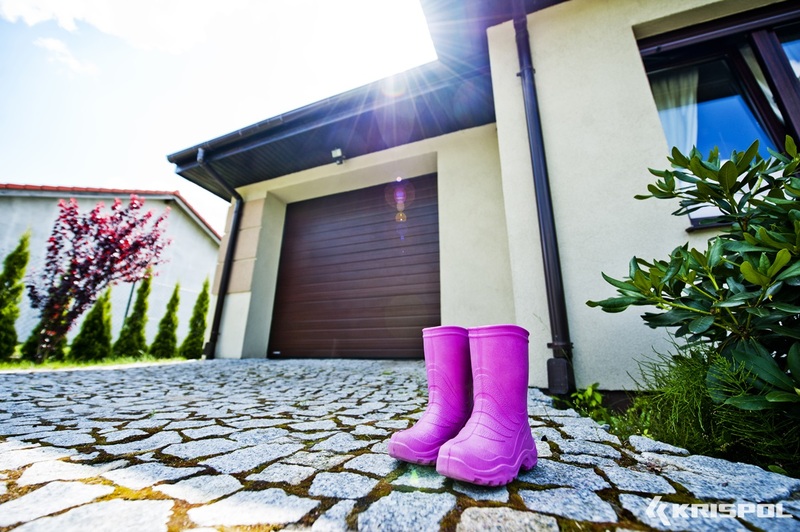 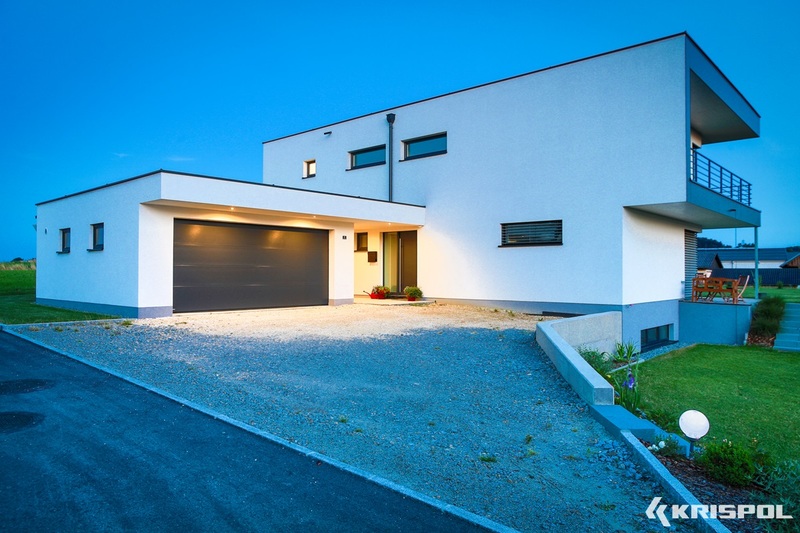 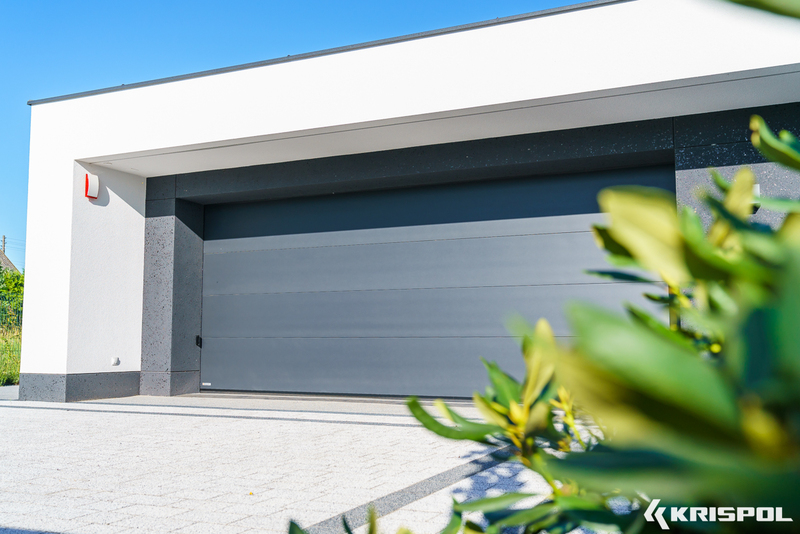 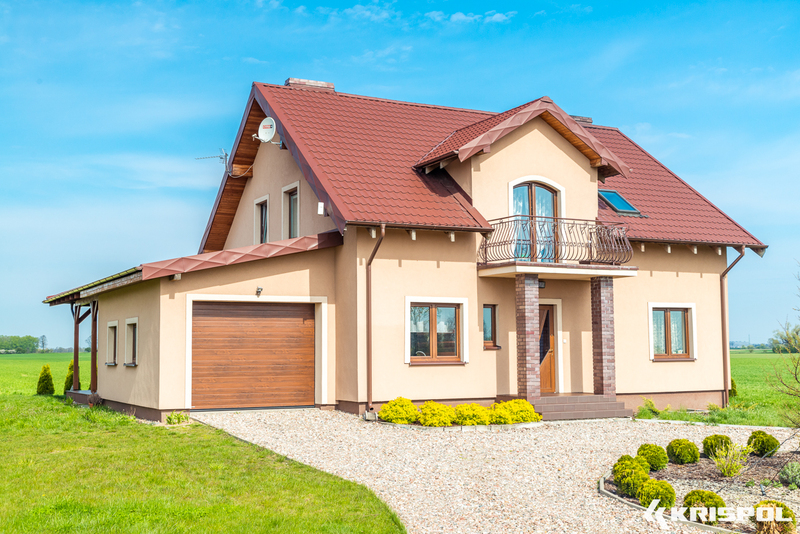 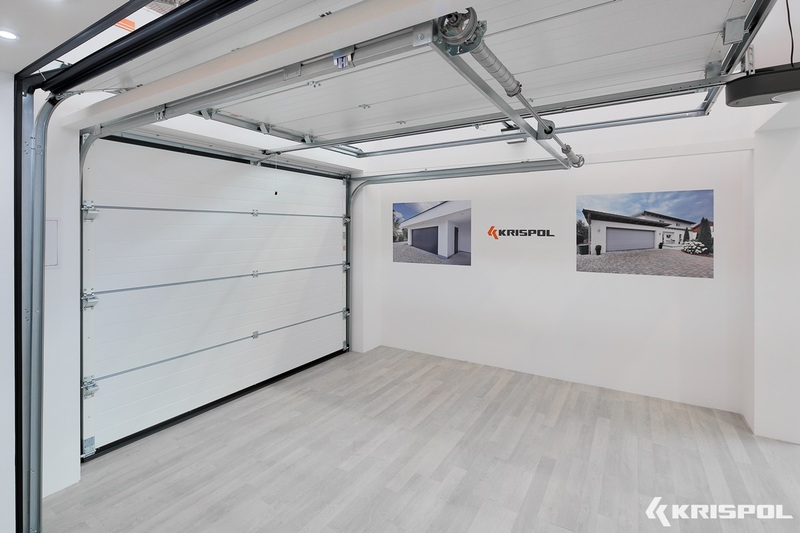 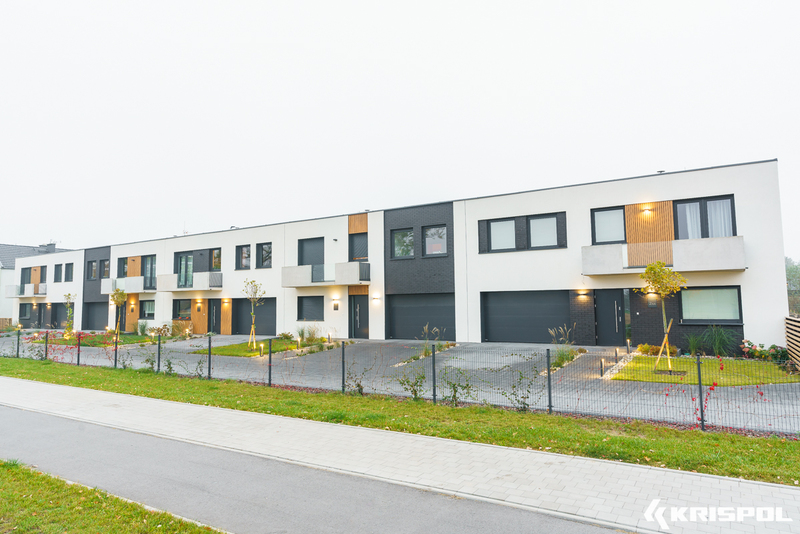 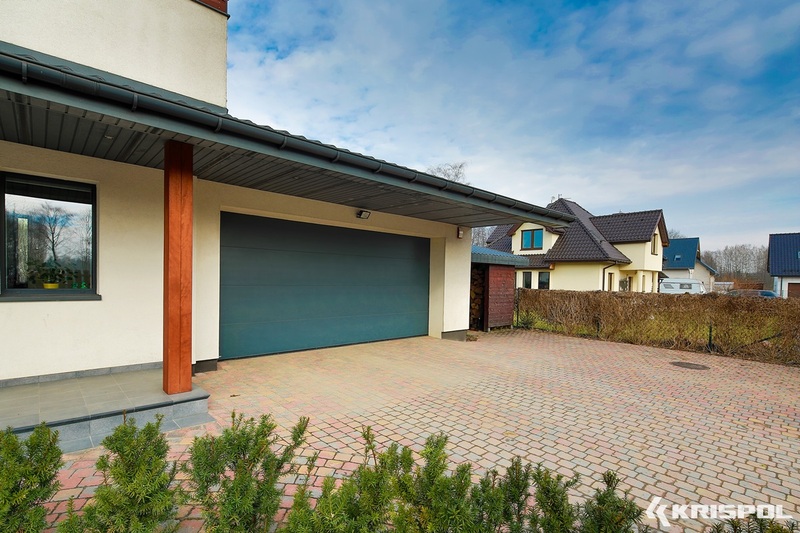 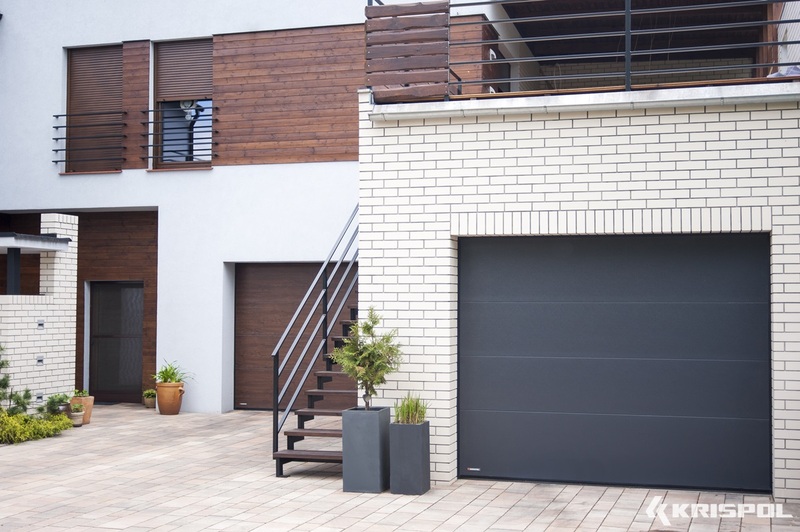 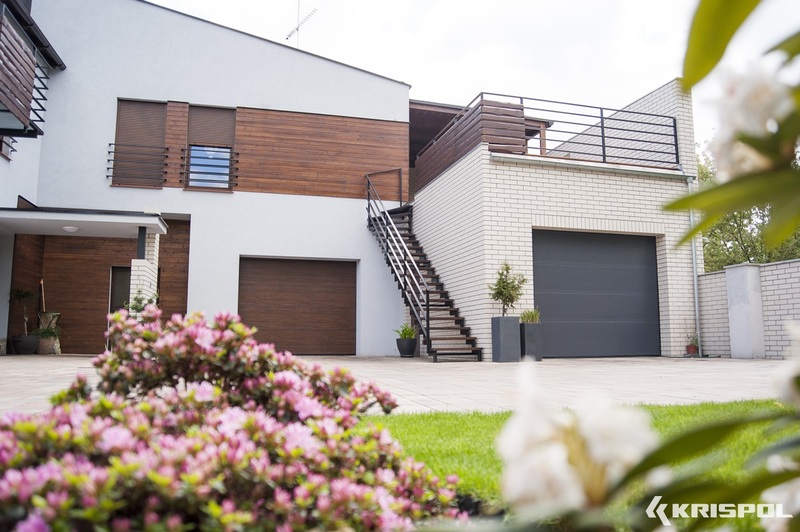 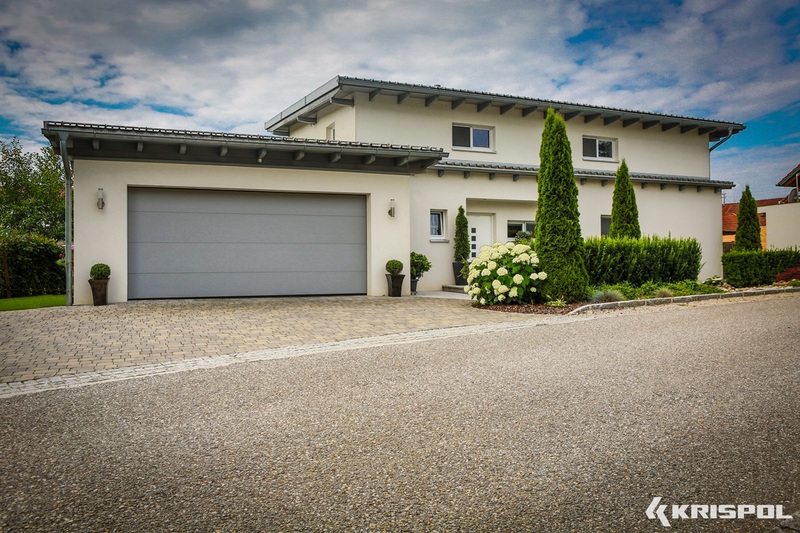 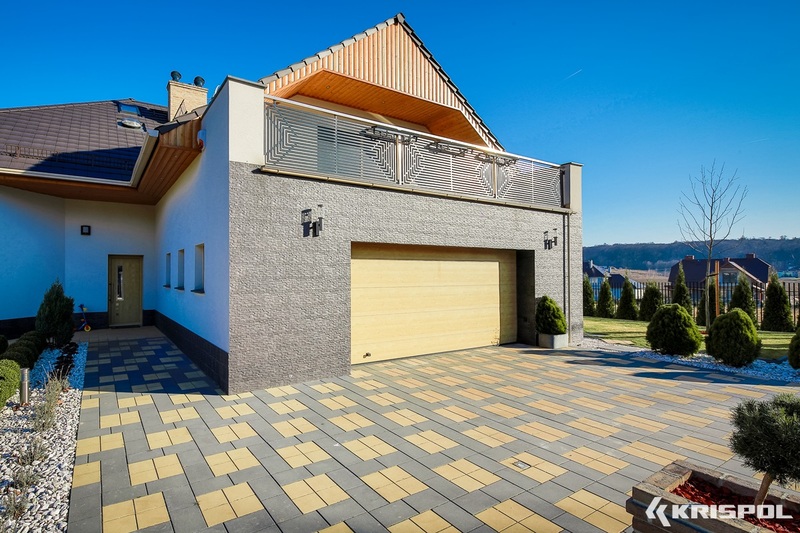 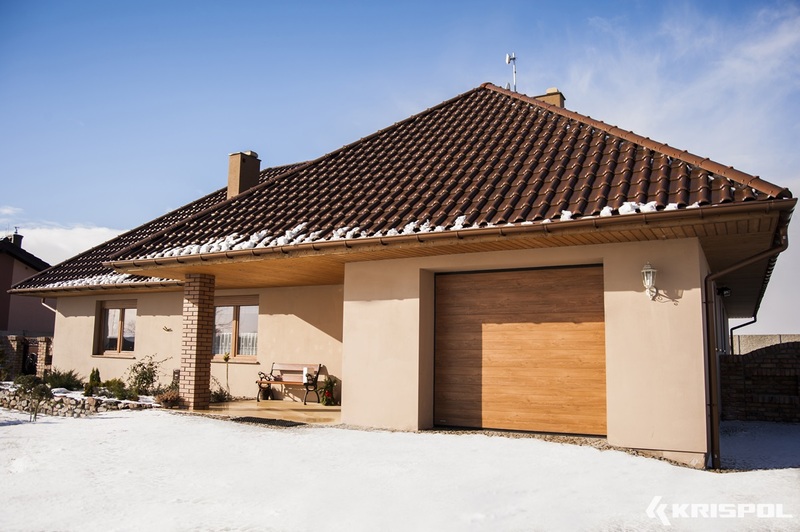 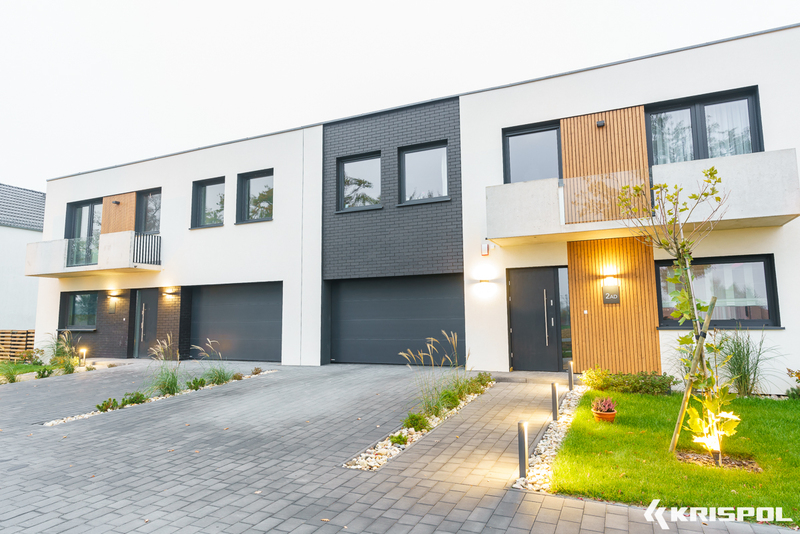 The warmest KRISPOL garage door – created with consideration of the growing energy efficiency of our houses. 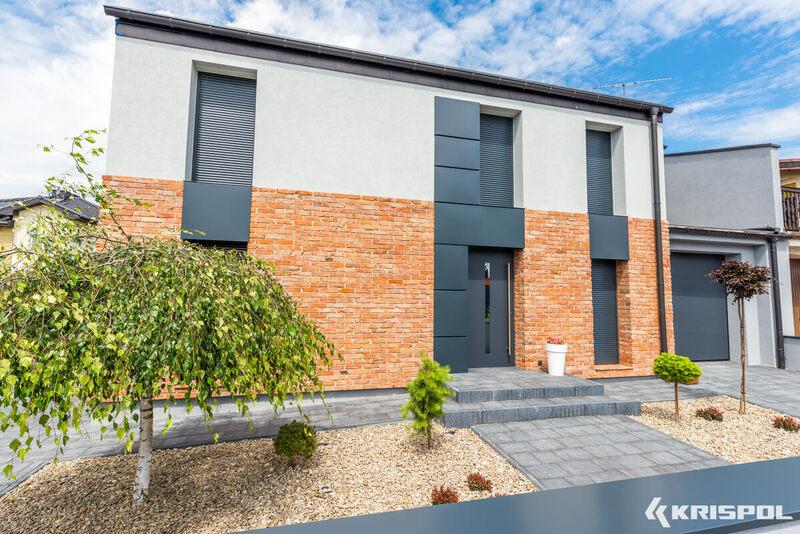 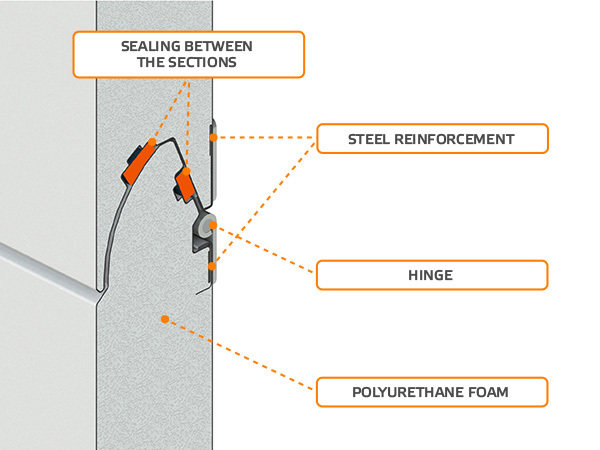 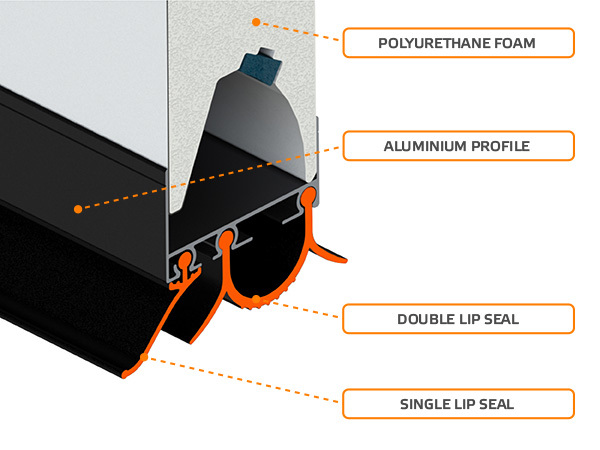 An exceptionally high insulation level is guaranteed by insulated panels of the thickness increased to 60 mm along the whole height, reinforced system of sealing and the construction which has been developed in the finest details. 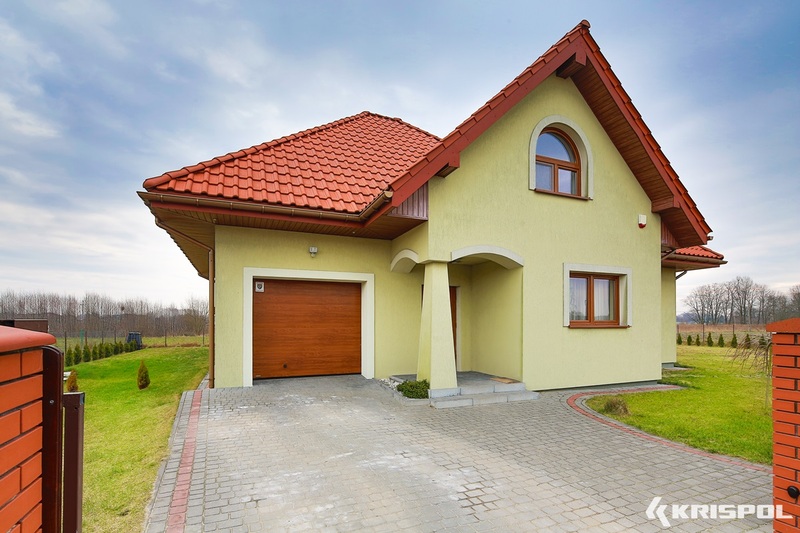 Narrow embossment is an universal, popular design, matching houses of various styles. 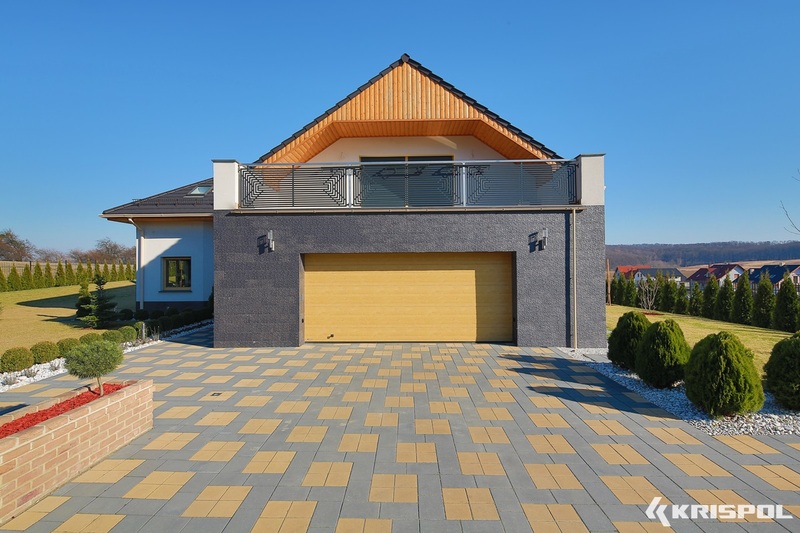 One of the advantages of such an embossment is the good value for money. 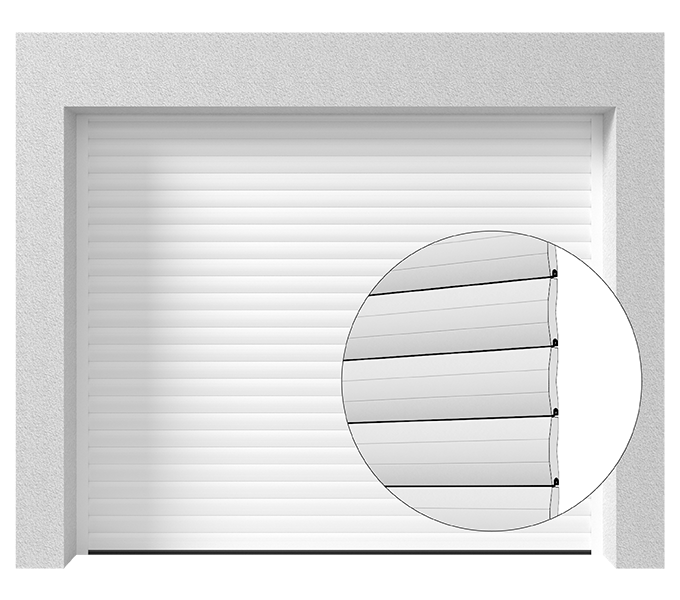 Wide embossment is a design that will well match both classic and modern looking houses. 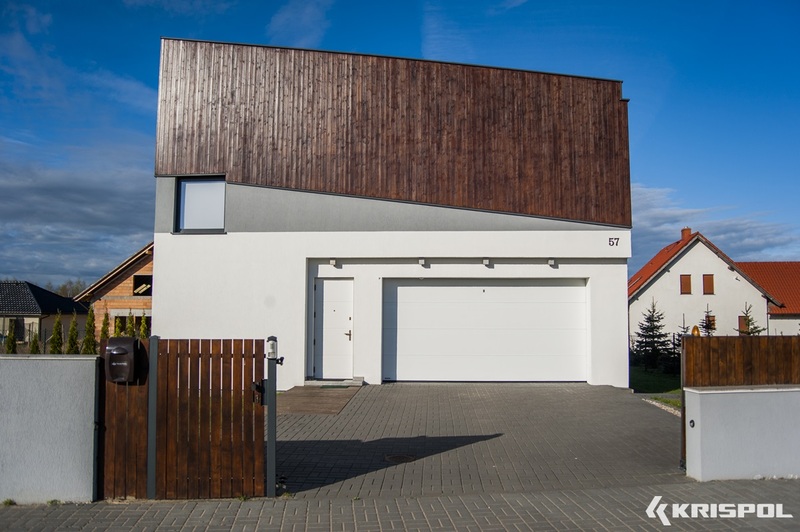 An interesting alternative to narrow embossments. 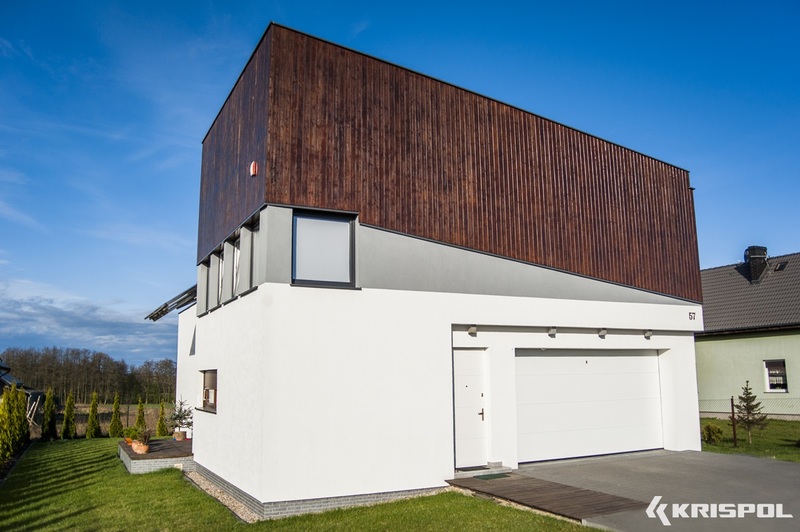 An elegant and simple form – matches well various architectural solutions. 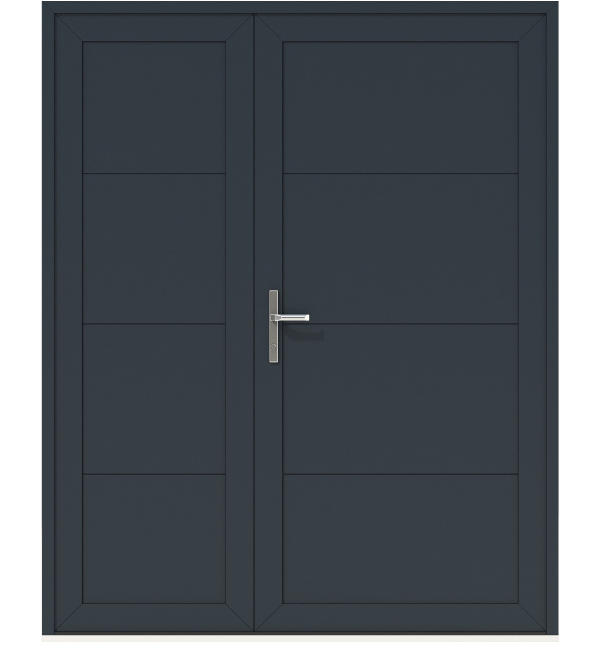 The style of this door can be enhanced by additional original decorative detail. 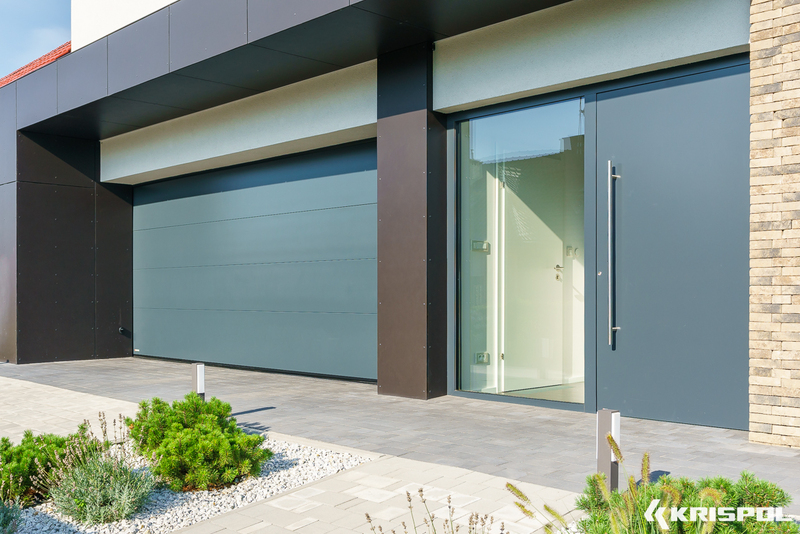 V-profiling ensures an exceptional, modern appearance of doors. 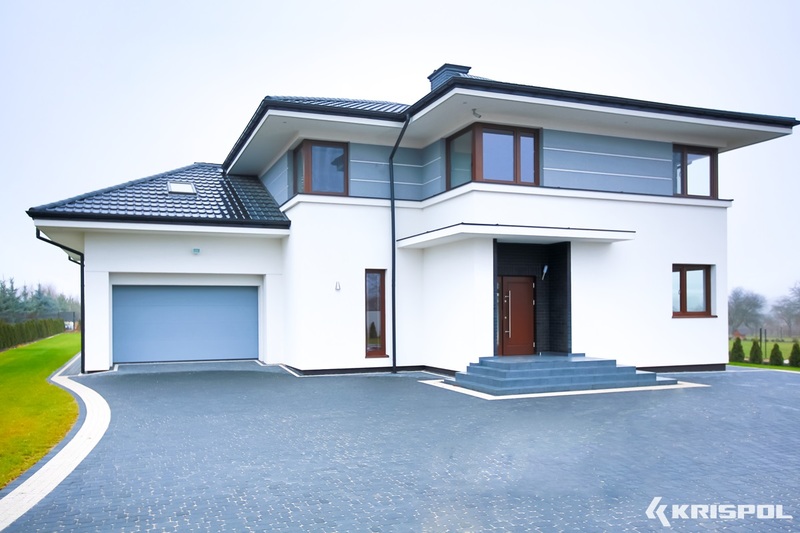 An innovative form which ideally matches state-of-the-art architectural trends. 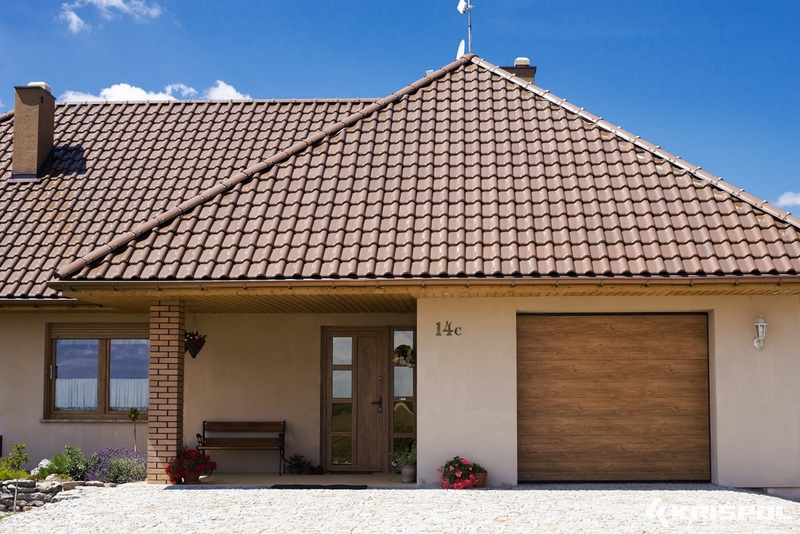 A model recommended to persons who value charm and warmth of traditional or rustic-style houses. 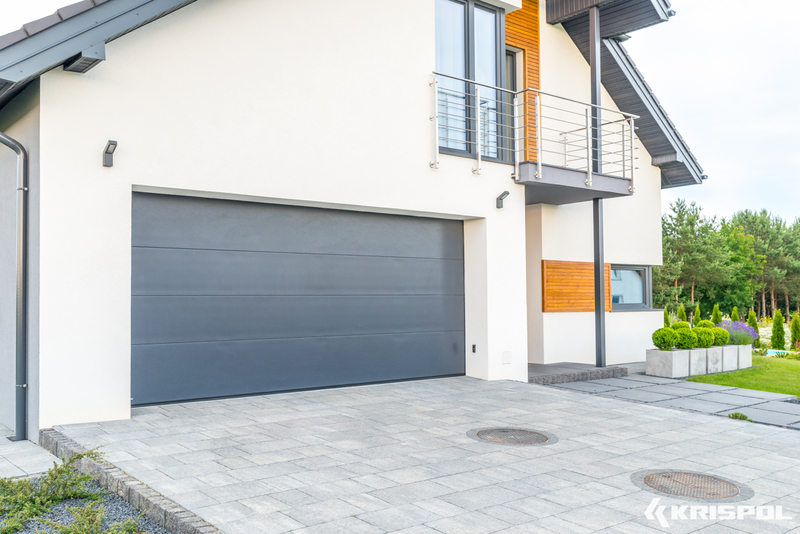 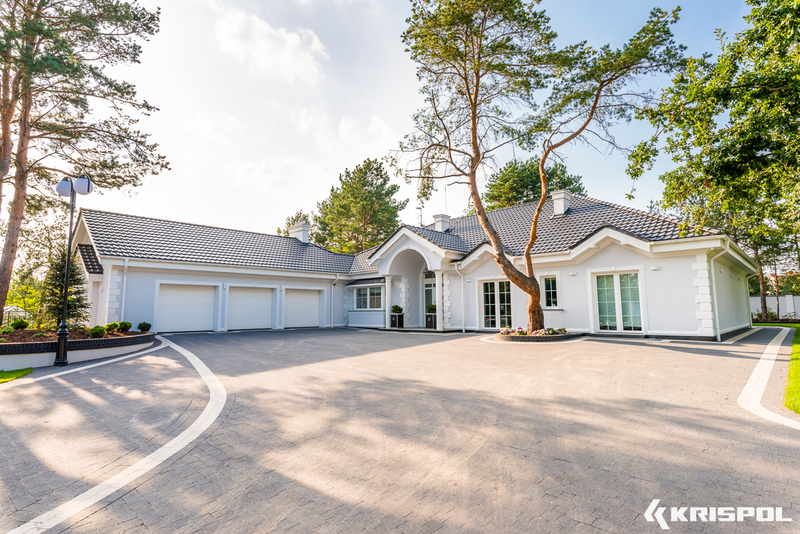 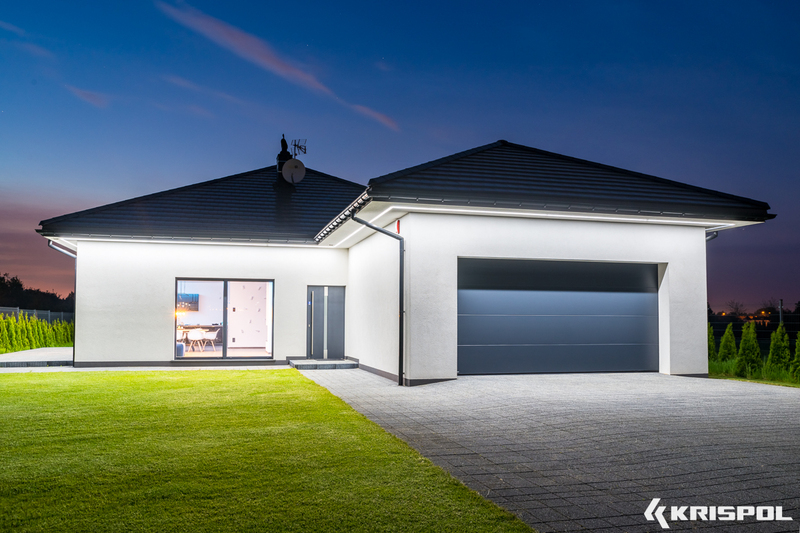 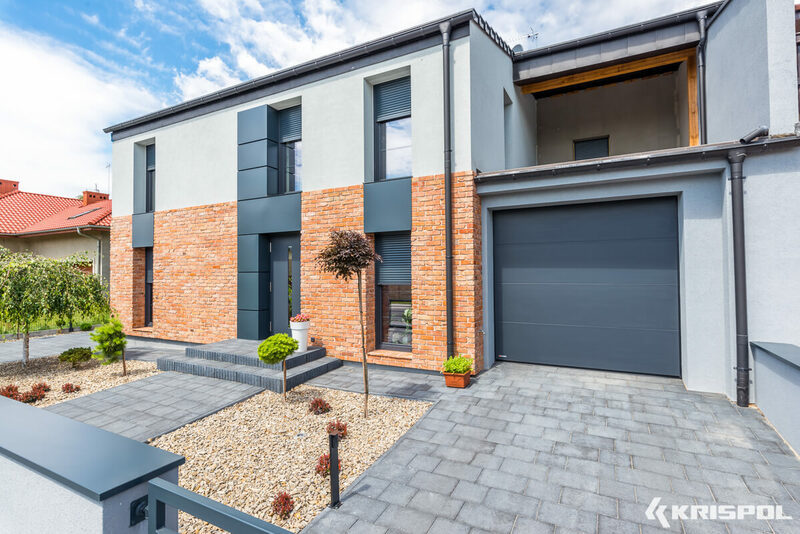 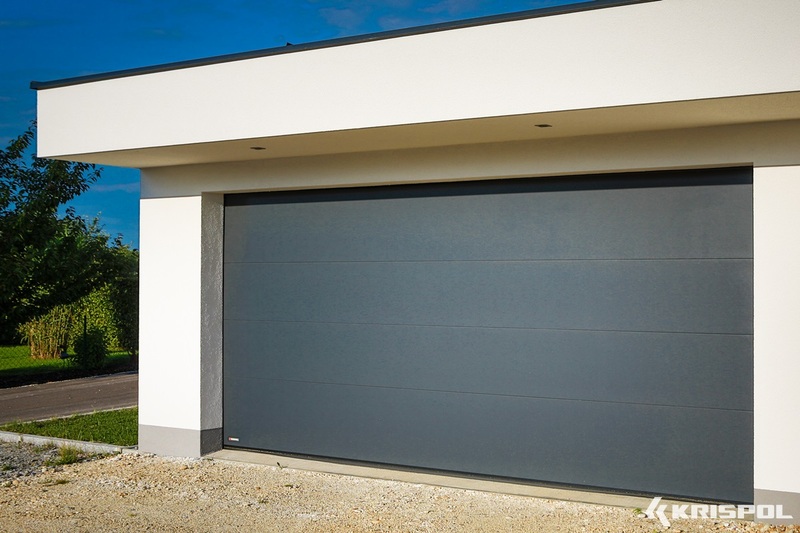 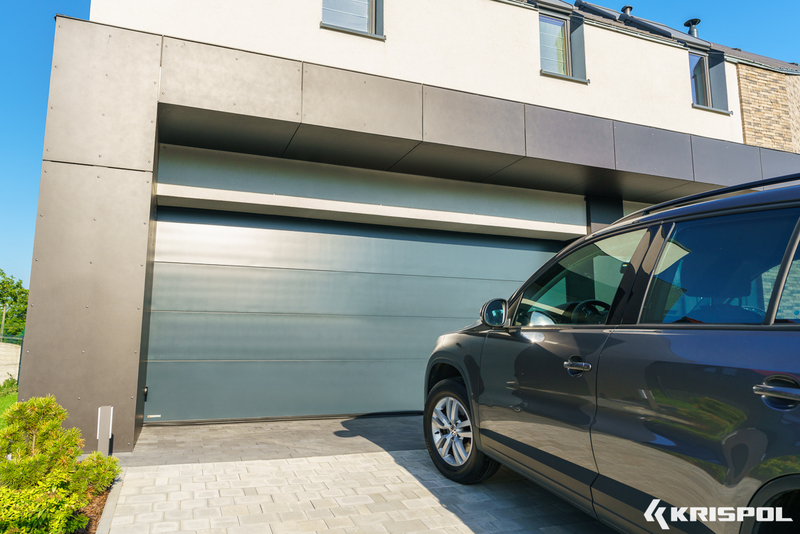 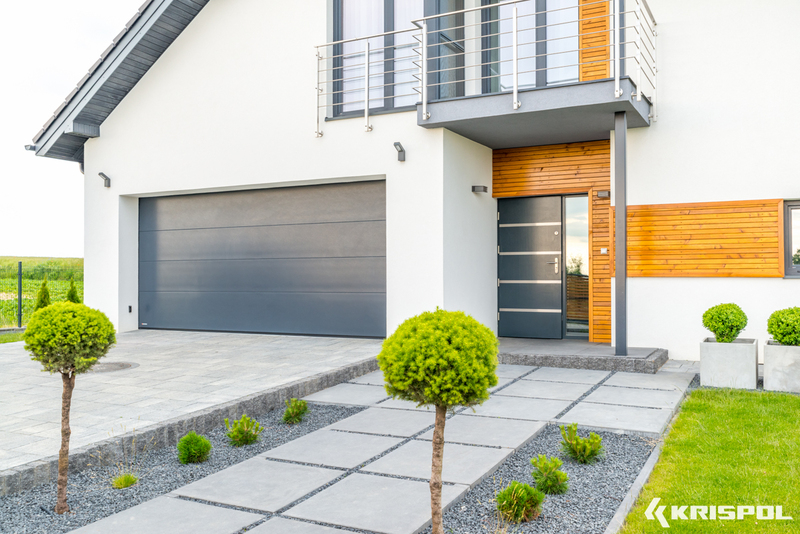 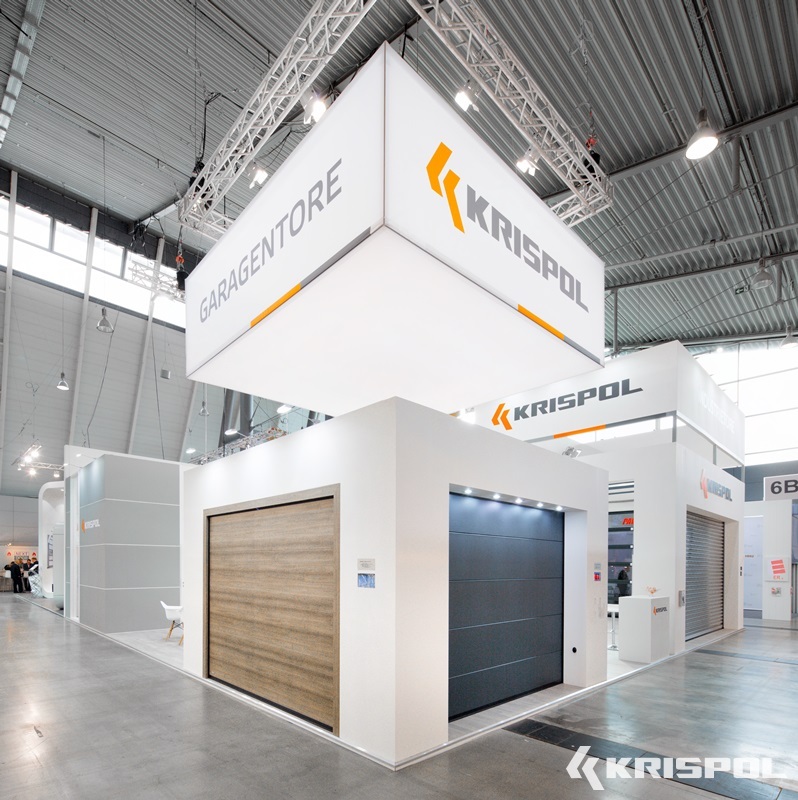 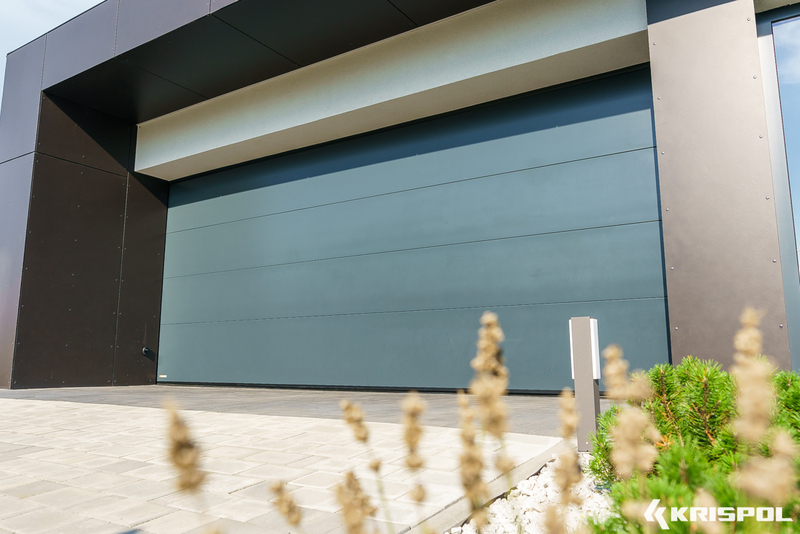 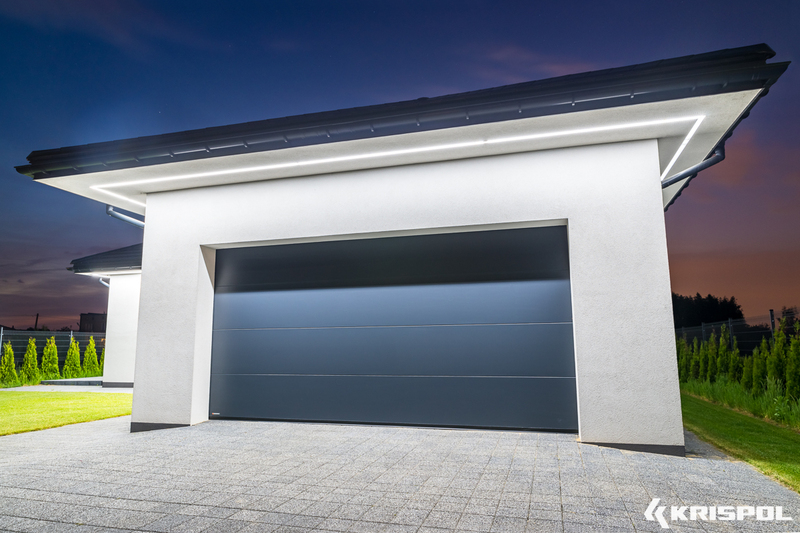 KRISPOL sectional doors are built of 40mm thick panels filled in with polyurethane foam and they are sealed along the whole perimeter and between the sections. 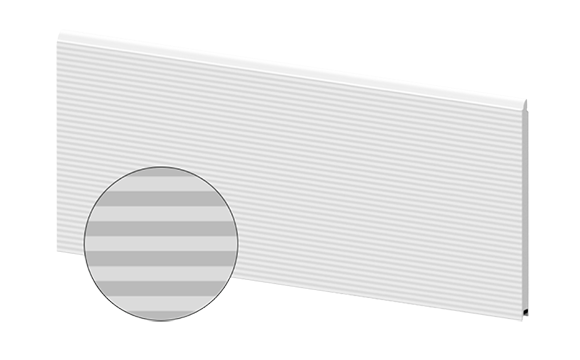 The shape of the upper arc was designed to optimally press the upper panel of the door to the lintel. 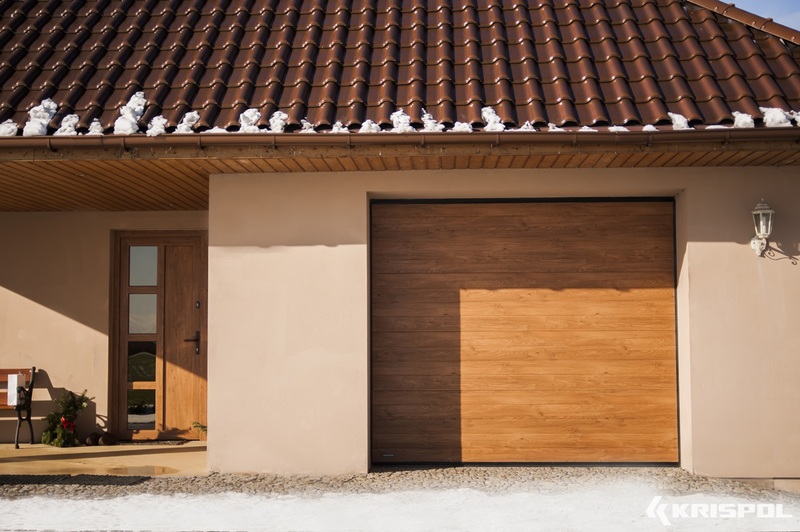 Because of that solution the doors have one of the best thermal insulation properties in the market: U= 1,12 [W/m2K] . 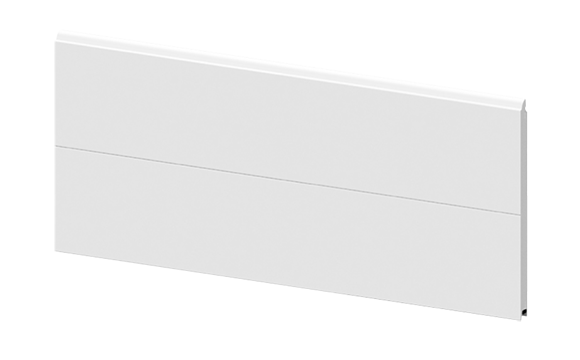 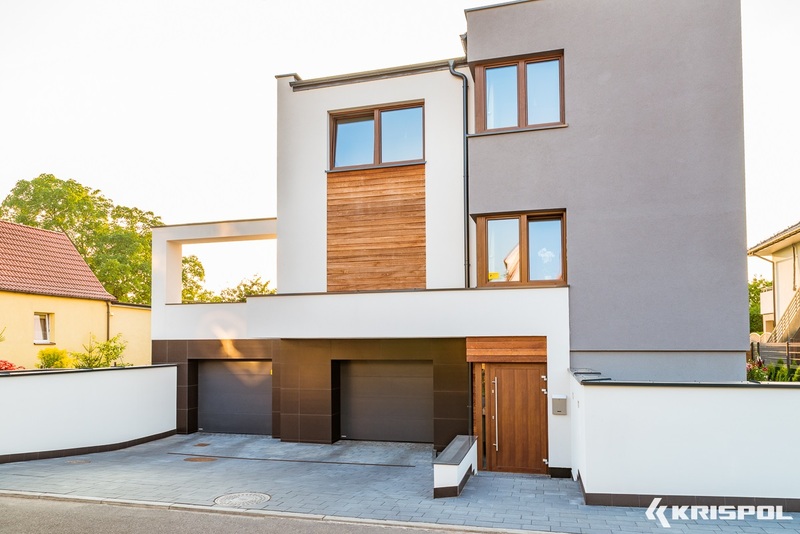 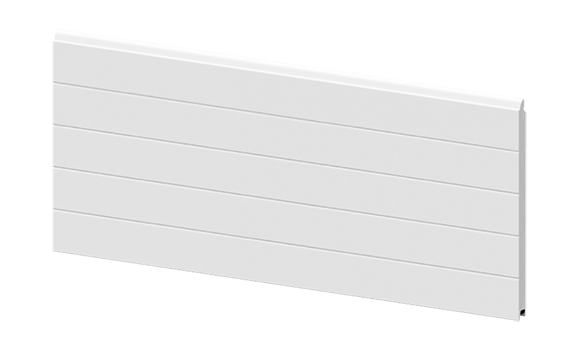 We have a special offer for energy-efficient houses: VENTE K2 RFS 60 door with the thickness increased to 60 mm. 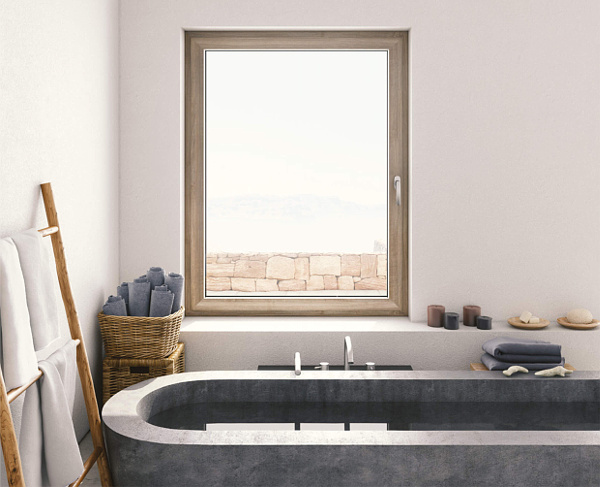 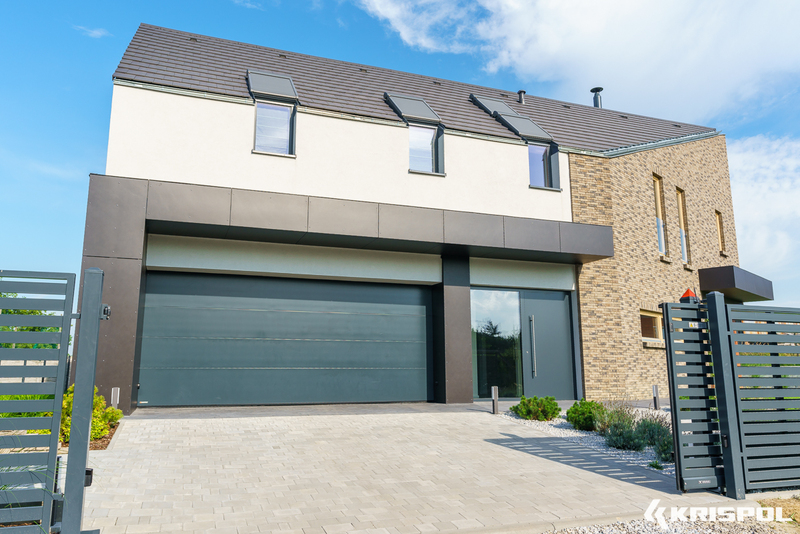 This exceptionally warm door has also double sealing of the bottom panel, sealing between the sections and additional sealing along the perimeter which reduces thermal bridges between the wall and the angles. 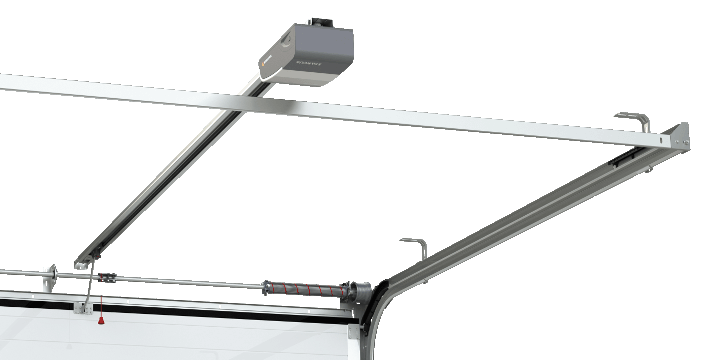 It allows to reach the coefficient U=0,9 [W/m2K]. 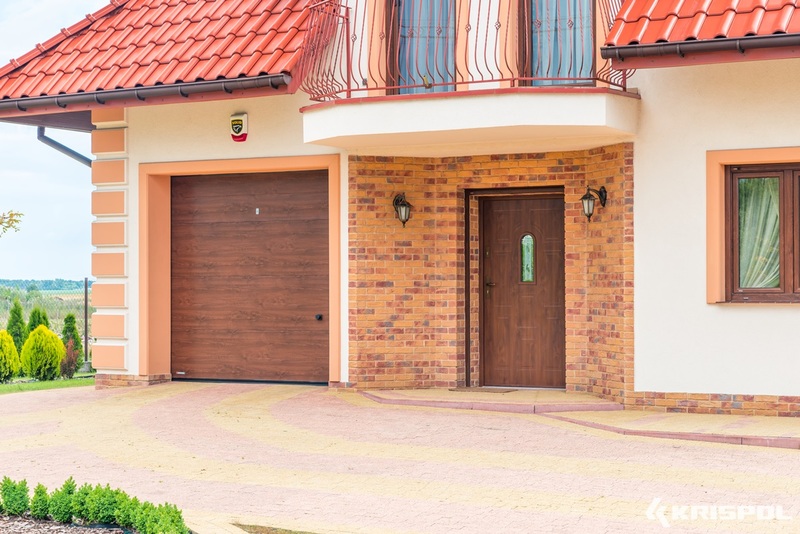 No matter how good the door looks from outside, it cannot be forgotten that the door should have a solid construction in the first place. Therefore, it is worth checking what the door looks like from inside. 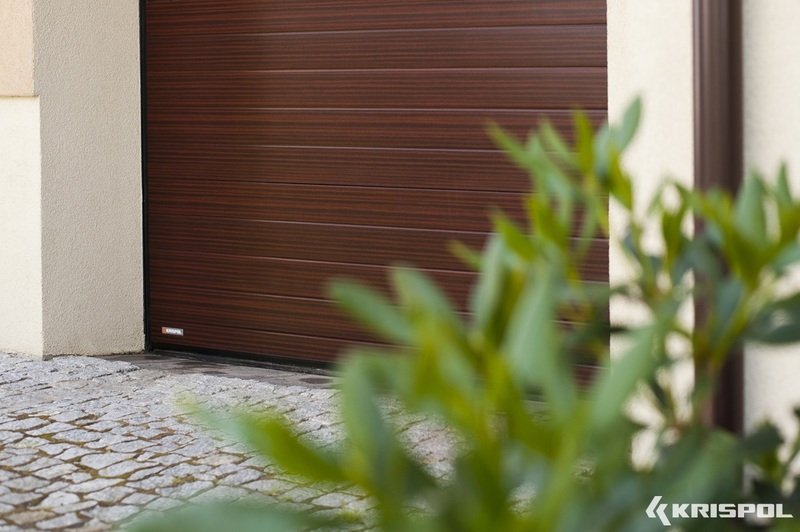 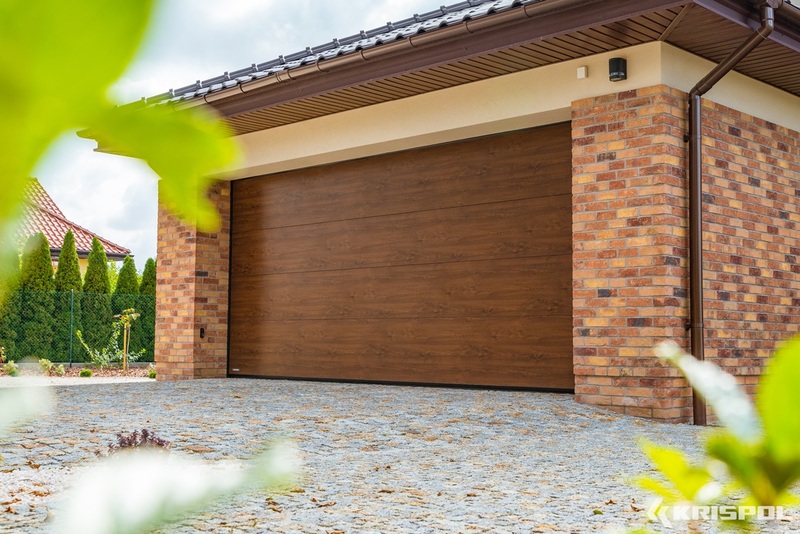 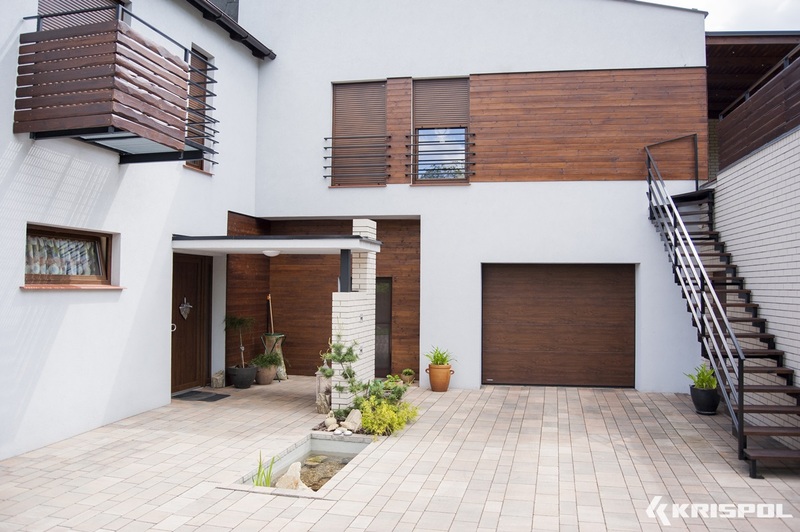 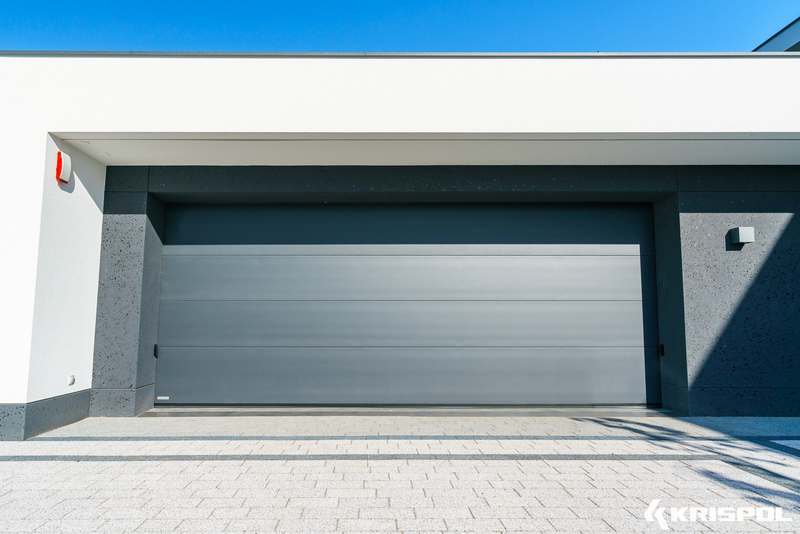 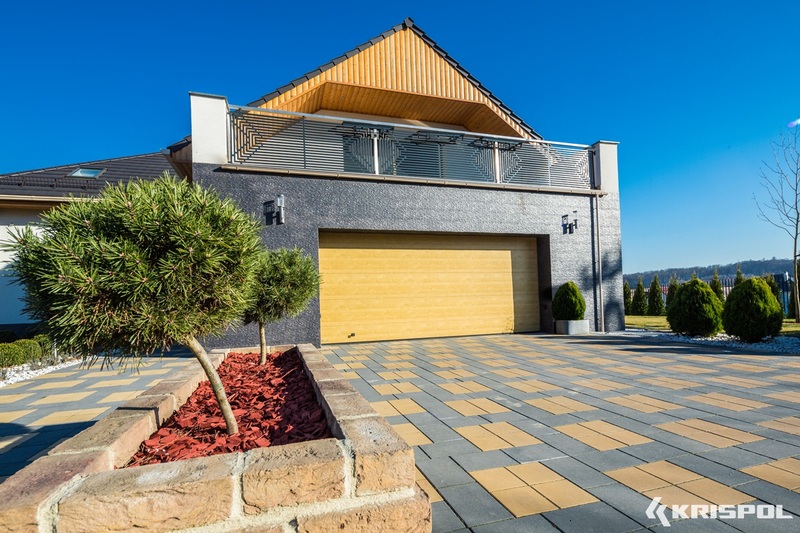 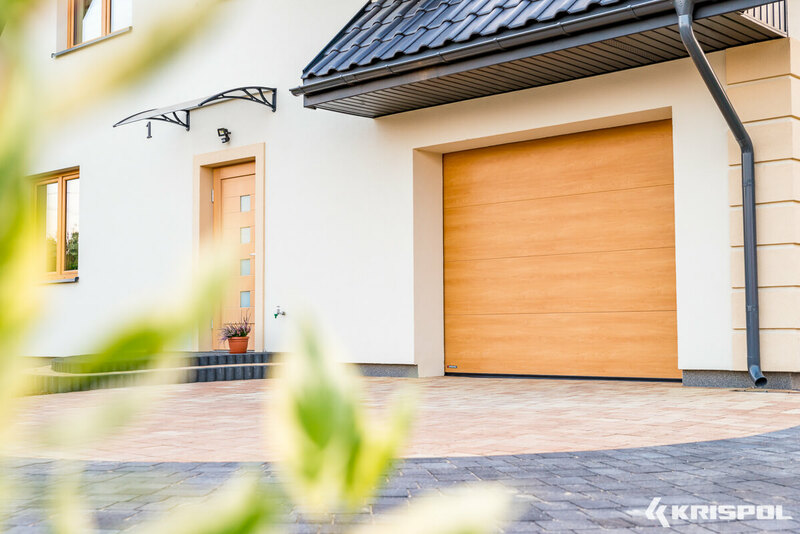 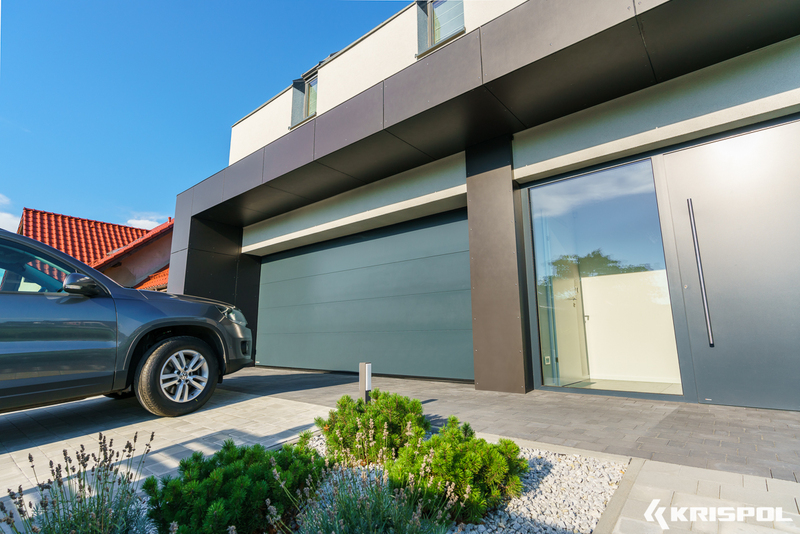 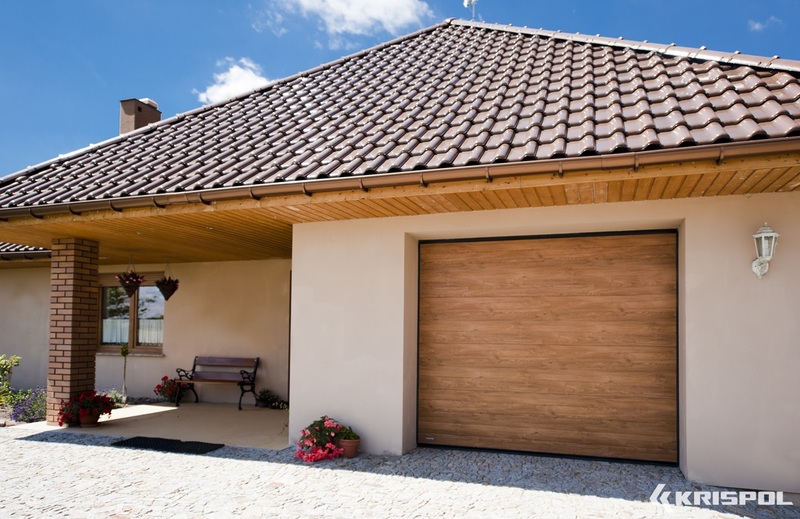 The mechanisms of our doors include the solutions which reinforce the construction of the doors, facilitate assembly and fit the garage space, they are also reliable and provide an aesthetic look from inside. 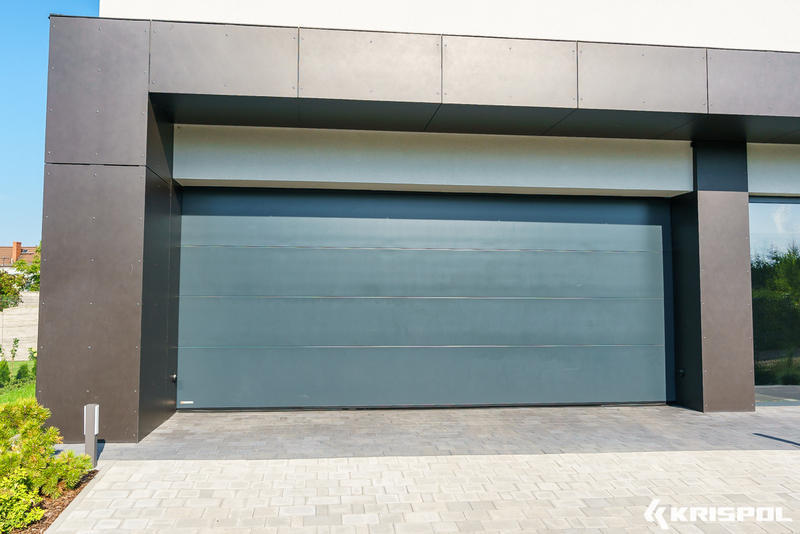 All steel elements of the doors are protected against corrosion. 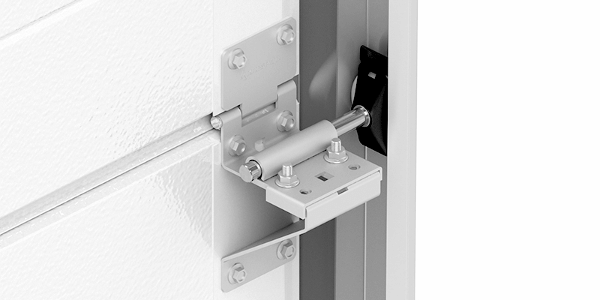 Middle hinges are installed in every door, additionally increasing the firmness of construction. 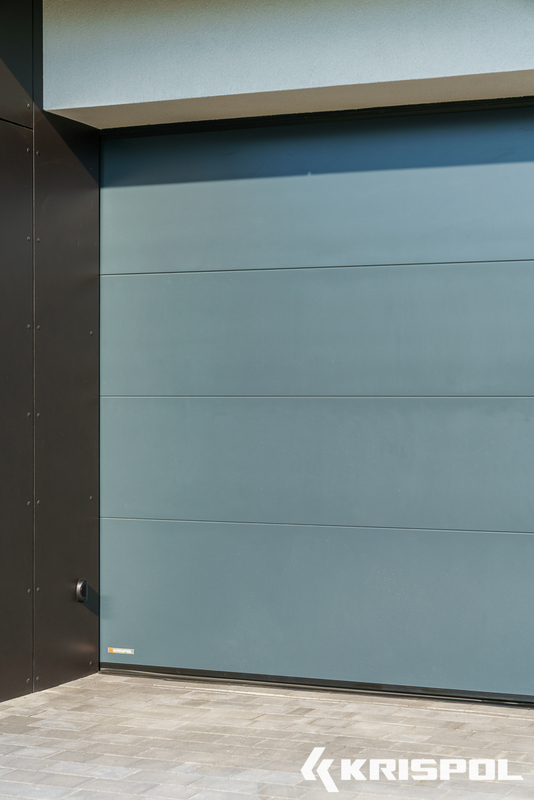 We paint the lateral hardware of the door with the colour matching the colour of the panels. 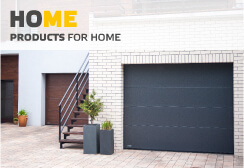 We are one of few companies in the market to do so. 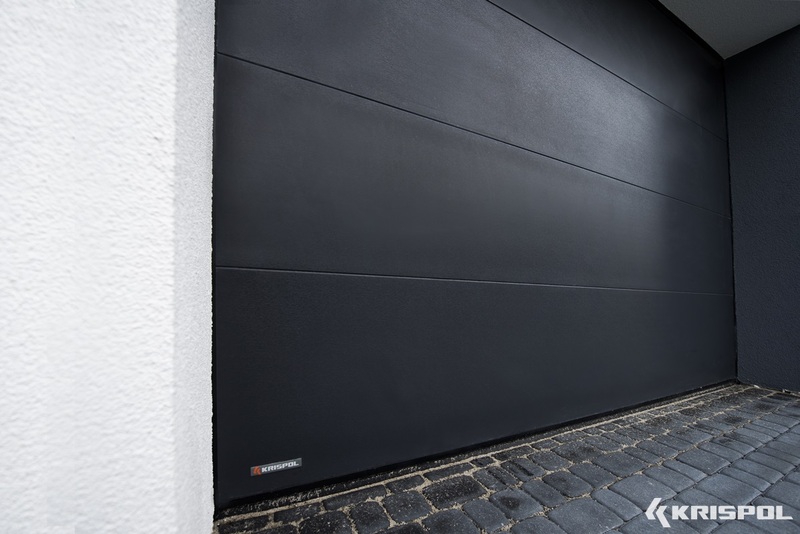 We constantly improve our products by implementing the solutions which improve safety use and which protect the functioning of mechanisms. 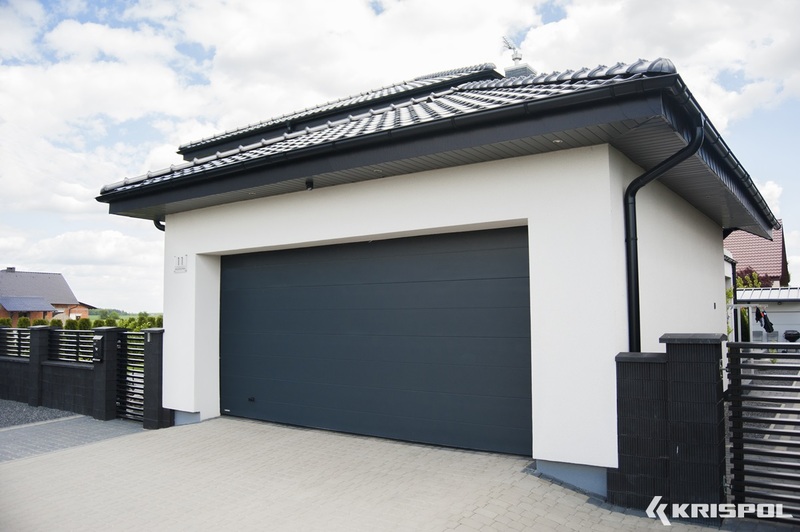 Additional protection in installed in every door to protect it from falling down if a spring bursts. 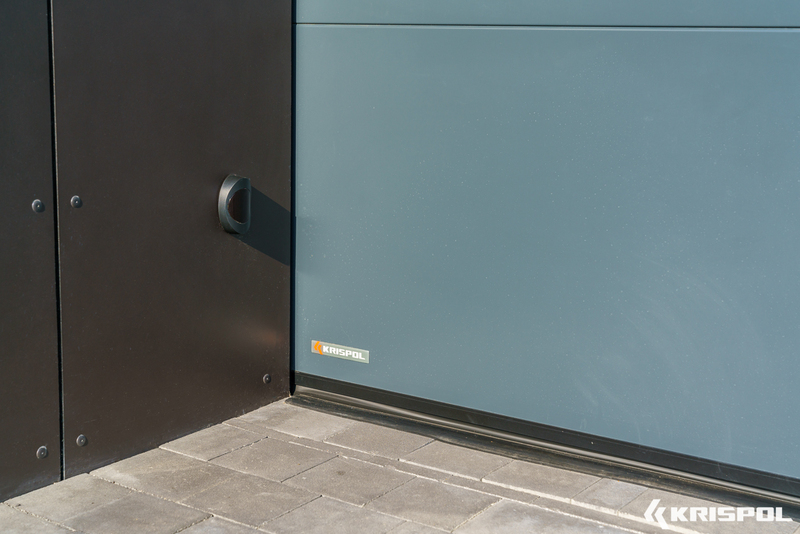 An overload switch is a standard feature of the drives, it lifts the door of approximately 10cm if an obstacle is found. 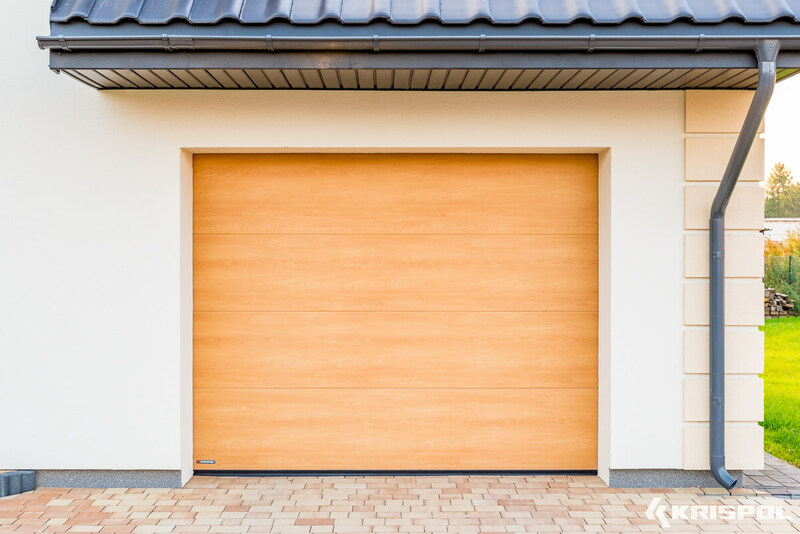 An automatic door can also be equipped with photocells preventing the door from closing if there is an obstacle in the door clearance. 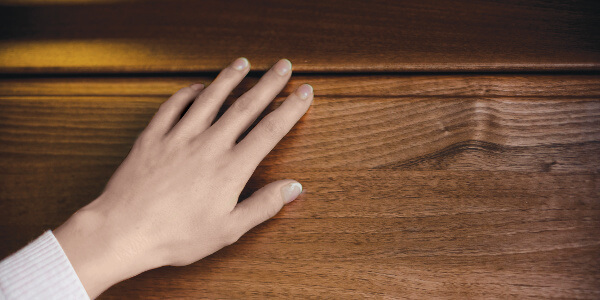 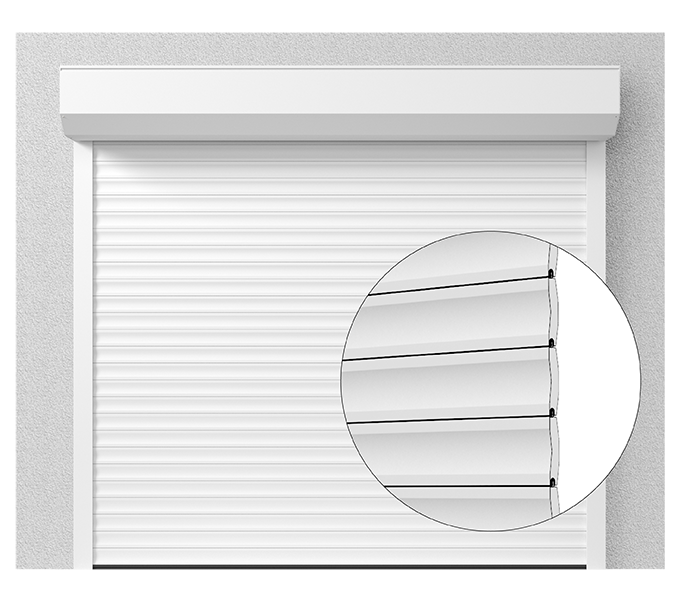 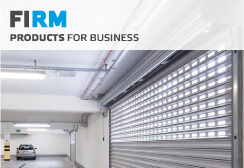 Driving rollers installed in all doors can be additionally equipped with finger protection. 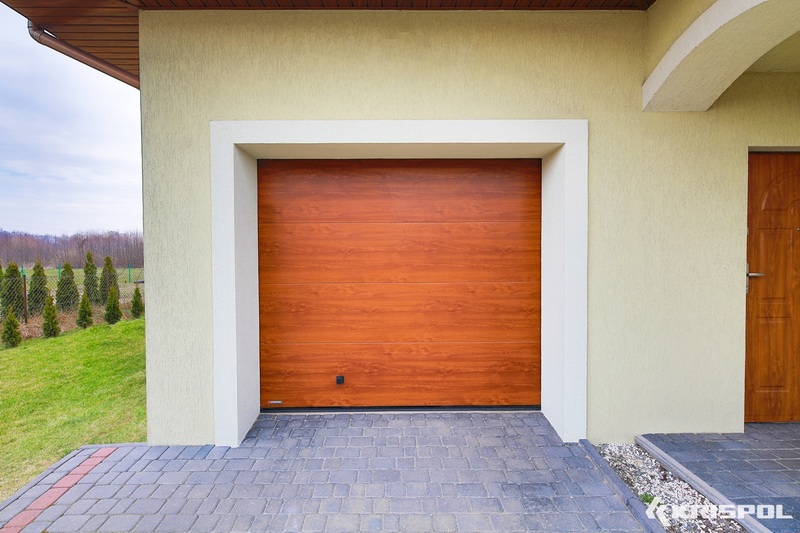 The sections of the doors were also designed to have a safe shape. 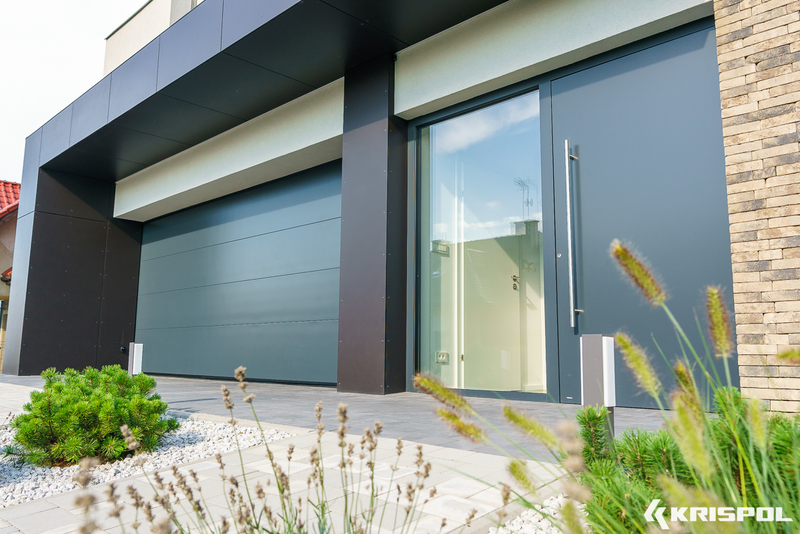 A comfortable door can be easily operated, is reliable and quiet. 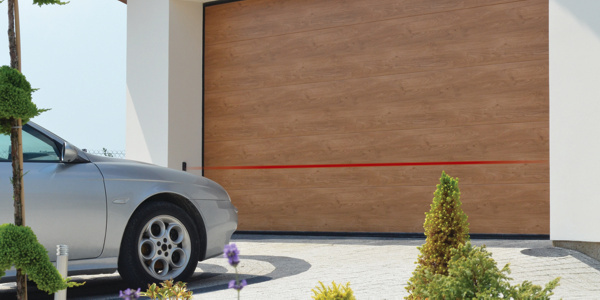 The comfort of use is provided by enhanced automatics. 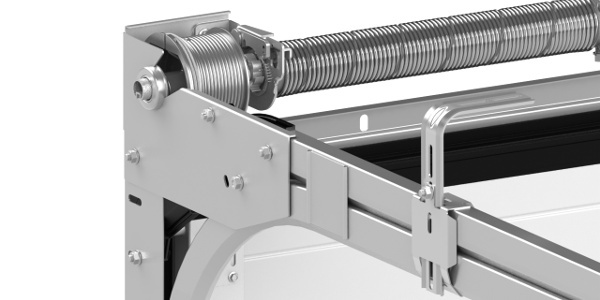 The mechanisms used in our products come from renowned producers. 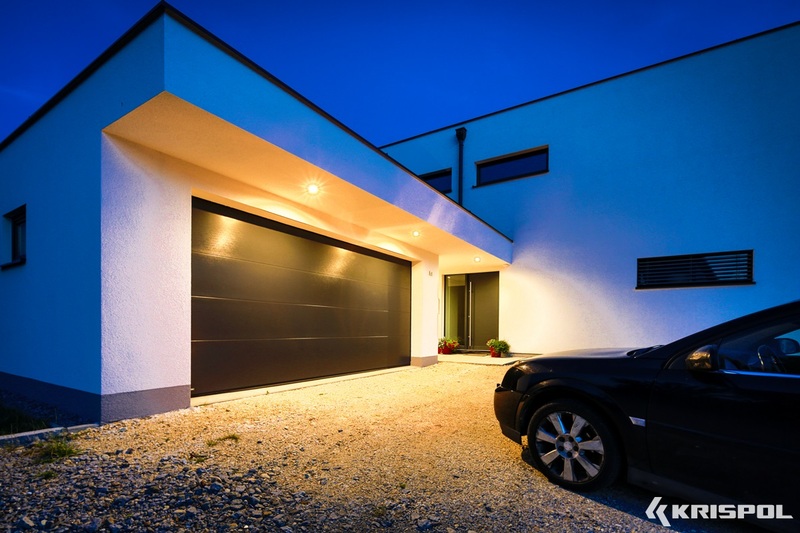 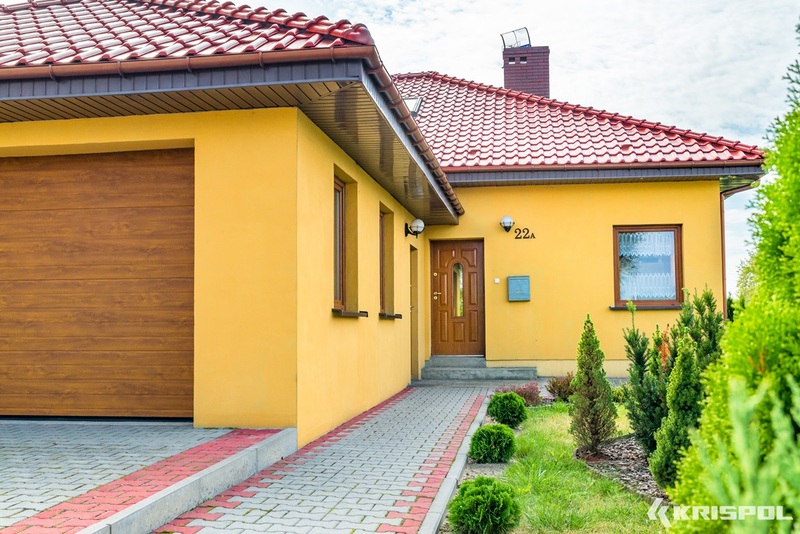 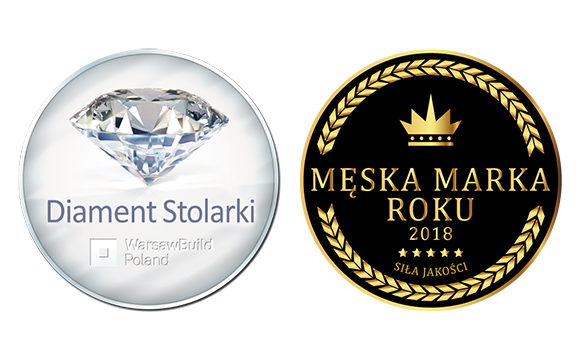 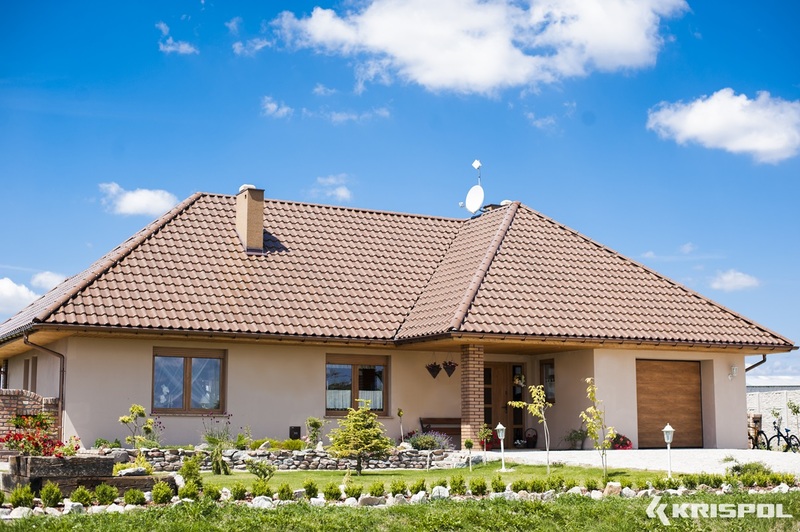 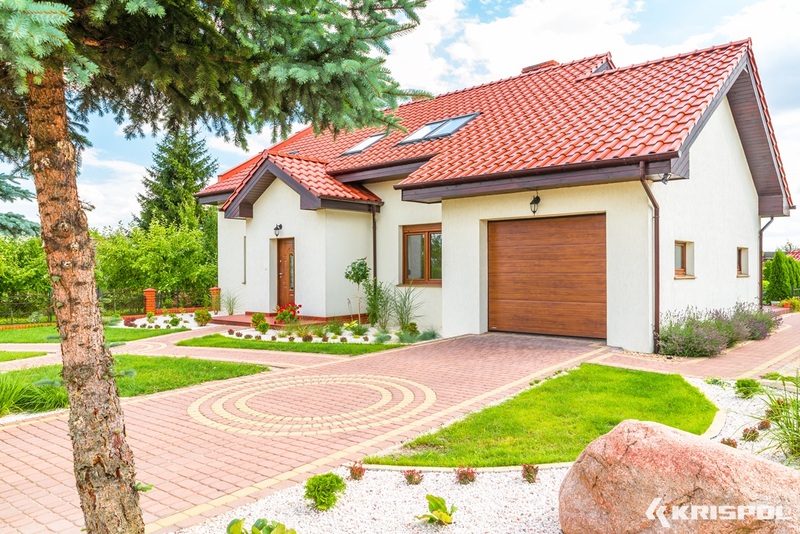 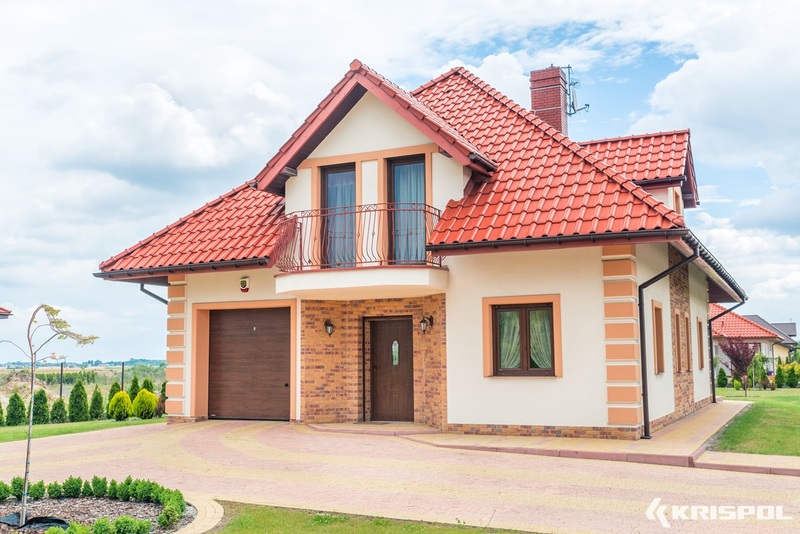 They guarantee an easy and unproblematic use but also give the possibility to connect the door to any ‘intelligent home’ system and to alarm installations. 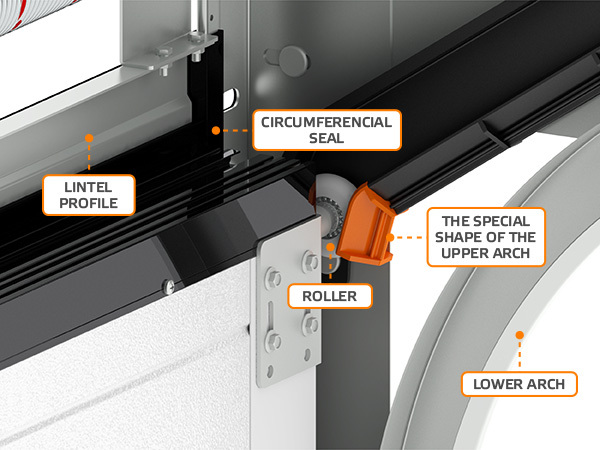 We use bearing rollers in our doors. 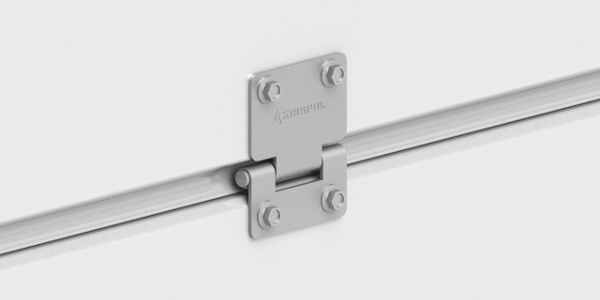 We also minimized the number of connections in the railing guides. 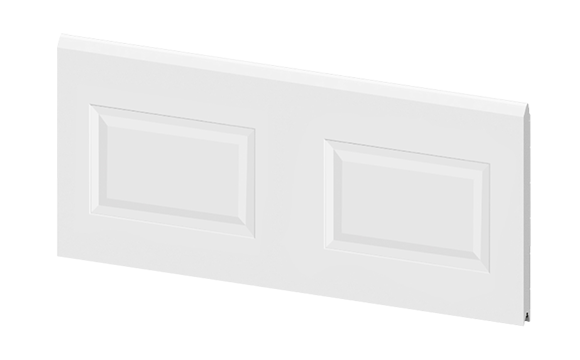 Because of these solutions the movement of the door is quiet and smooth. 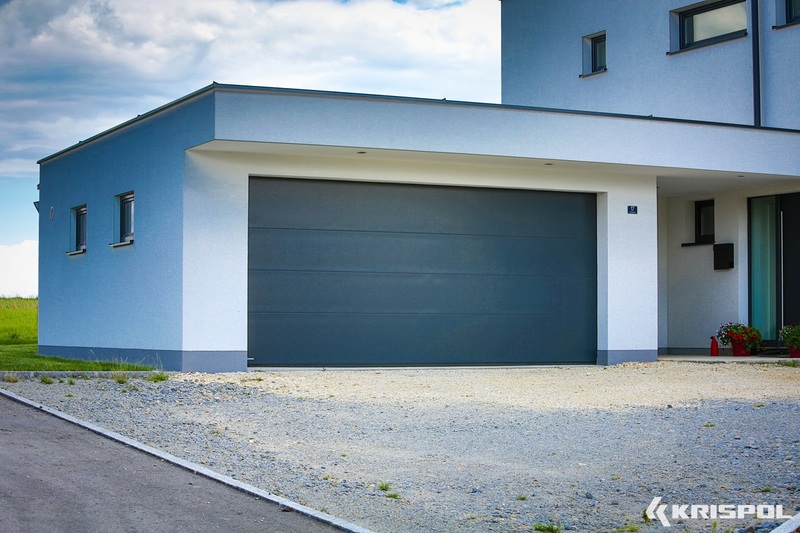 No matter what the size of the door is, each door manufactured by our company can be easily opened with one hand without excessive force. 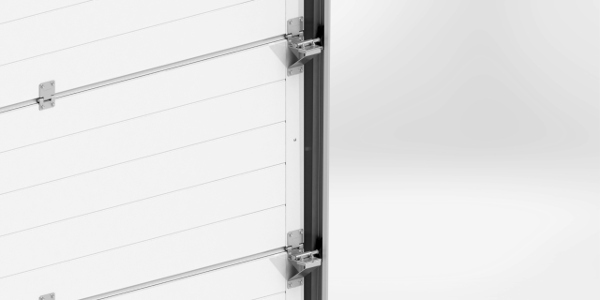 It is because of two torsion springs which provide an optimal balance of the door. 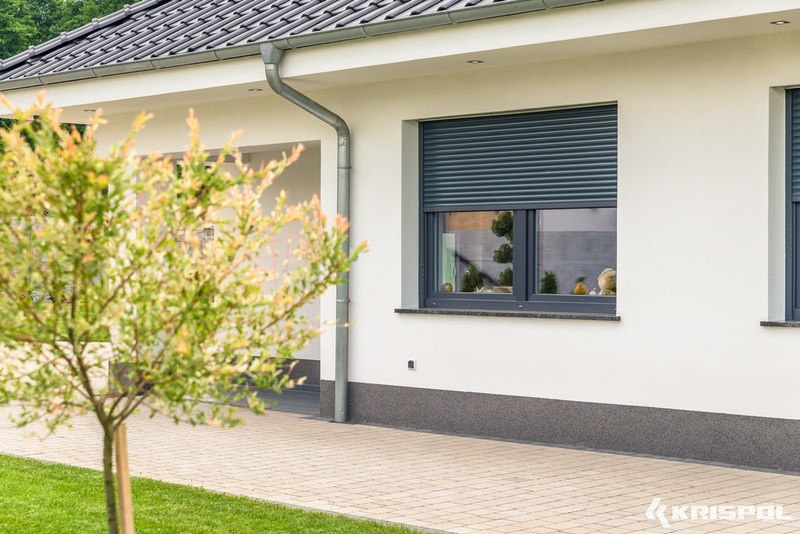 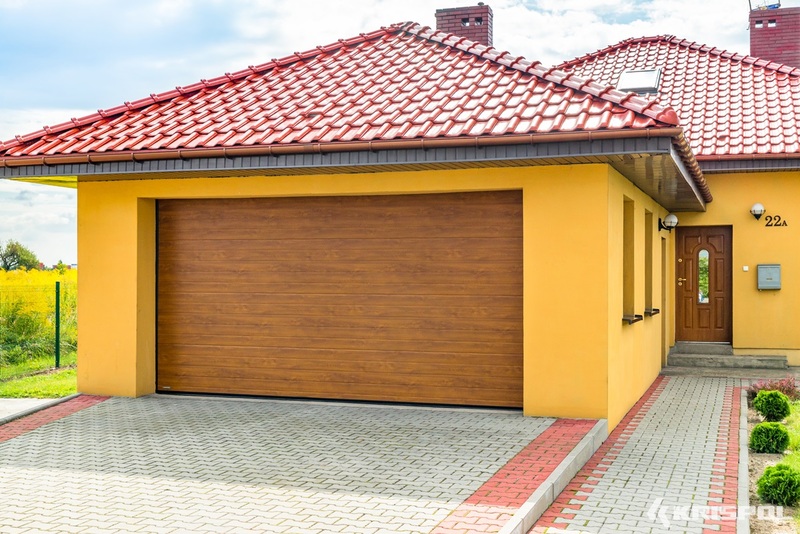 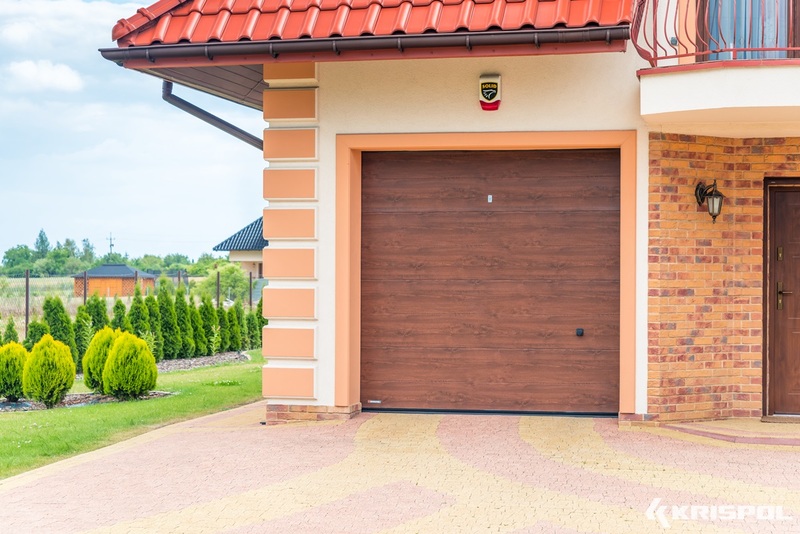 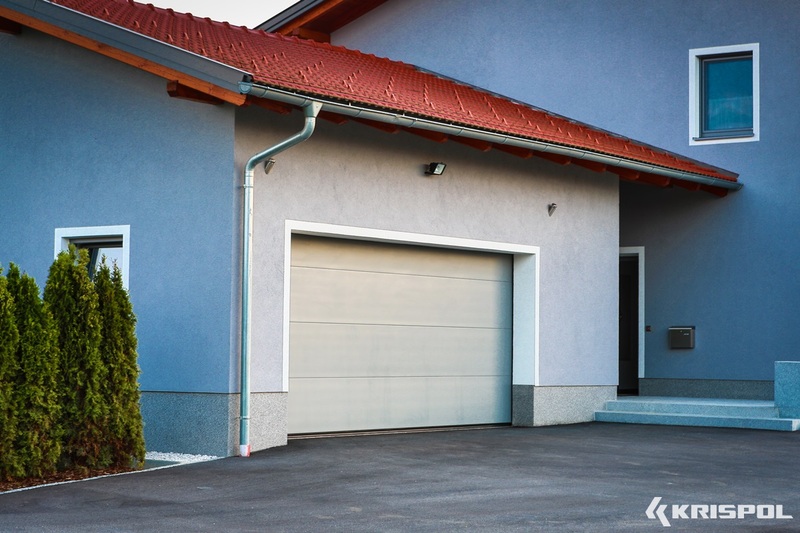 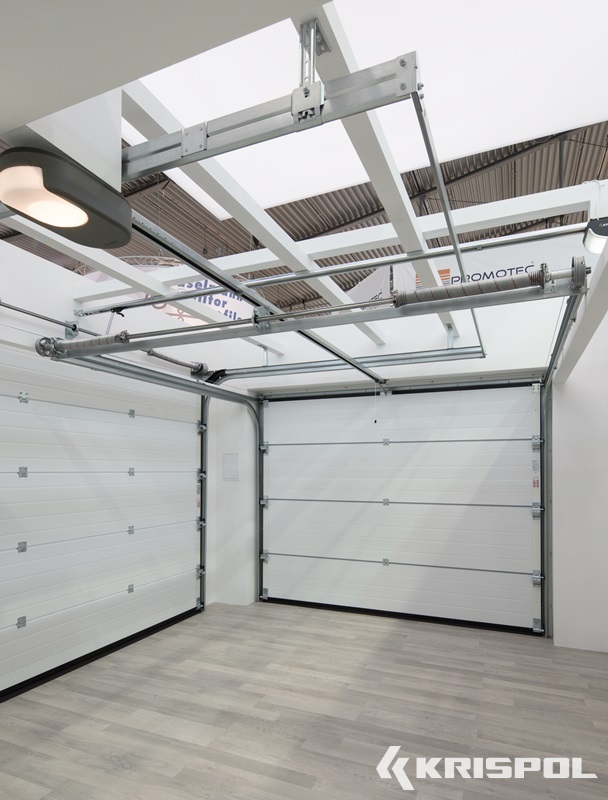 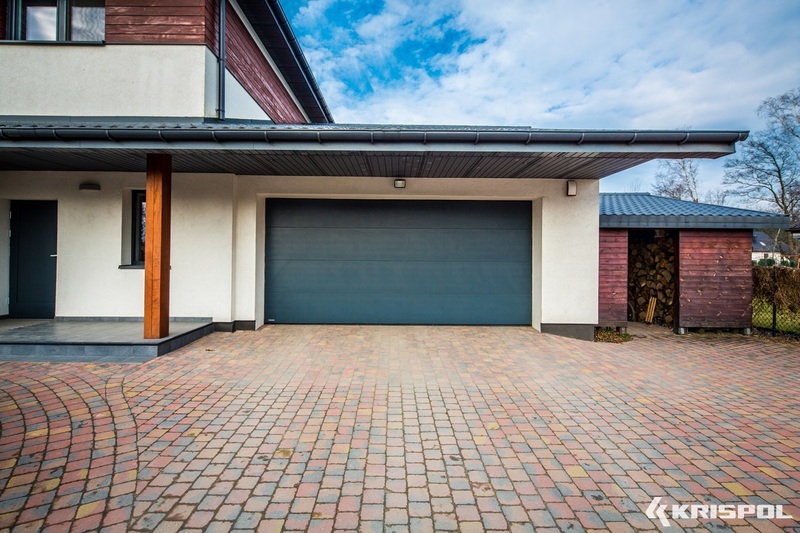 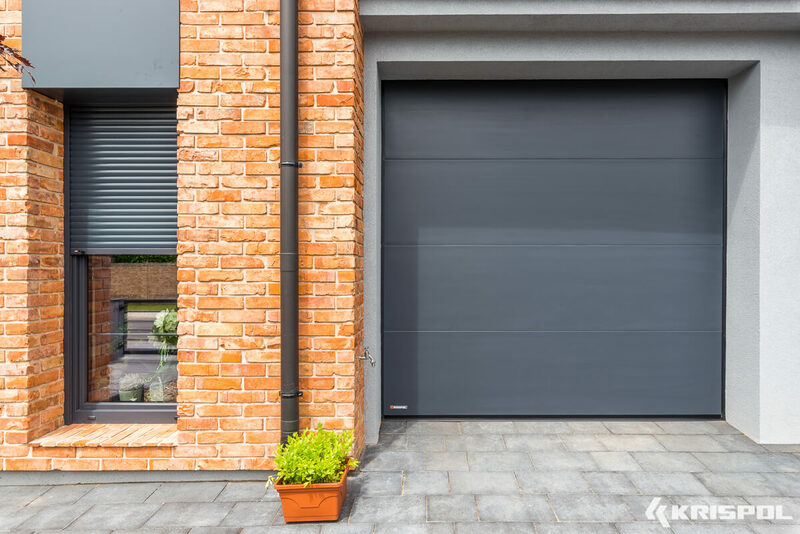 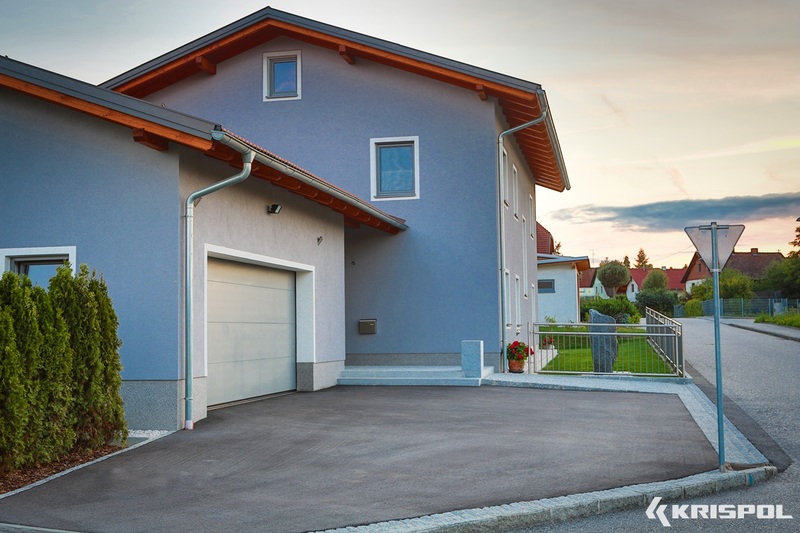 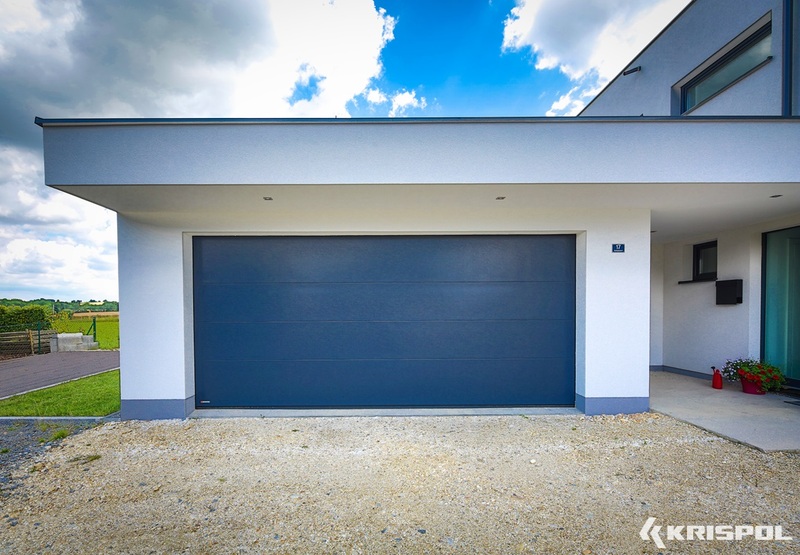 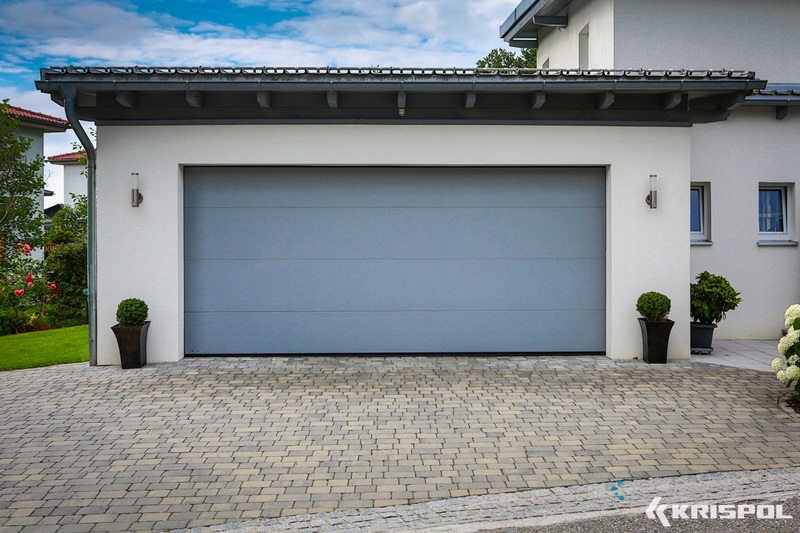 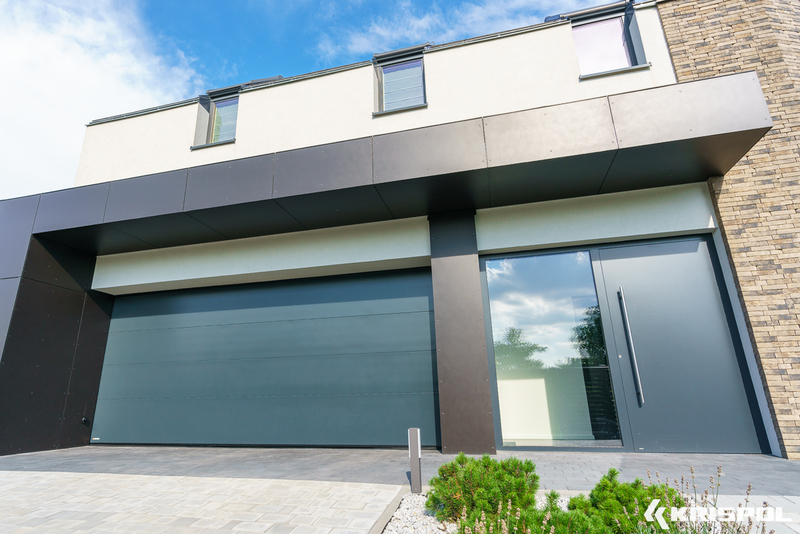 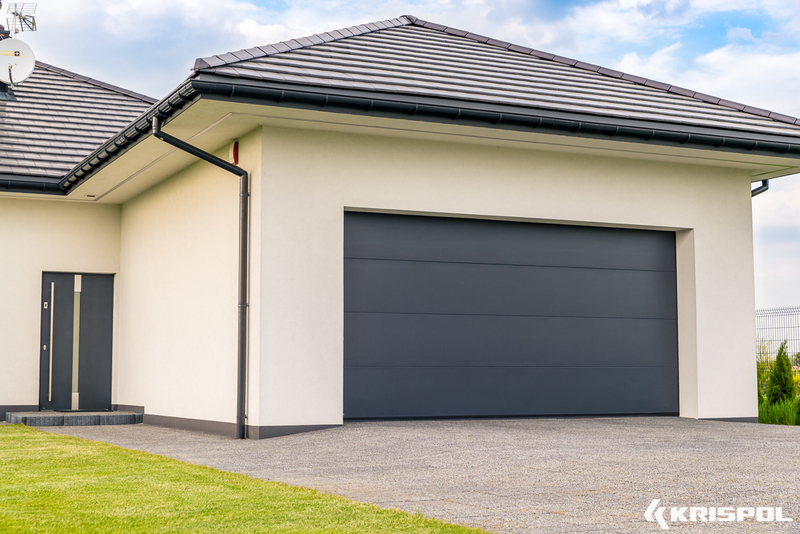 Rolling door is a constructional solution allowing for the installation of the door in the garage where we want to obtain a maximum free space directly under the ceiling, where there are untypical garages and utility rooms. 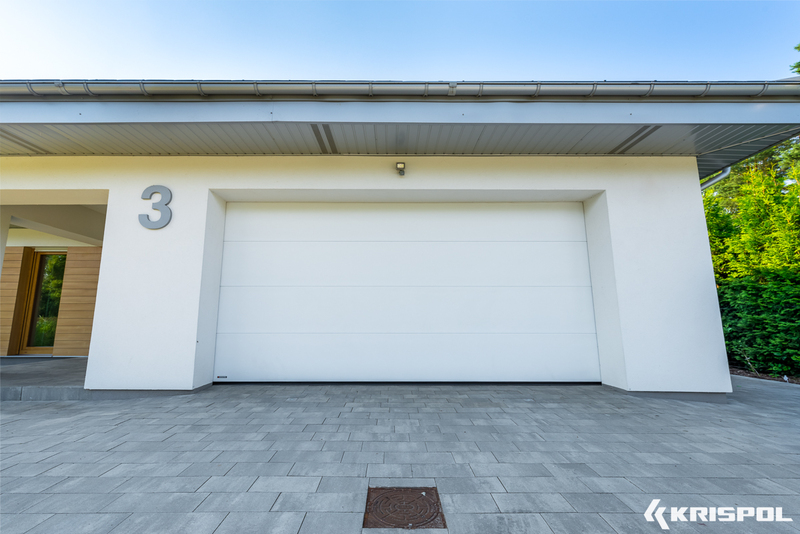 The door is opened up vertically, and the shell is hidden in the box located outside (RGZ) or inside (RGW) the garage above the entrance. 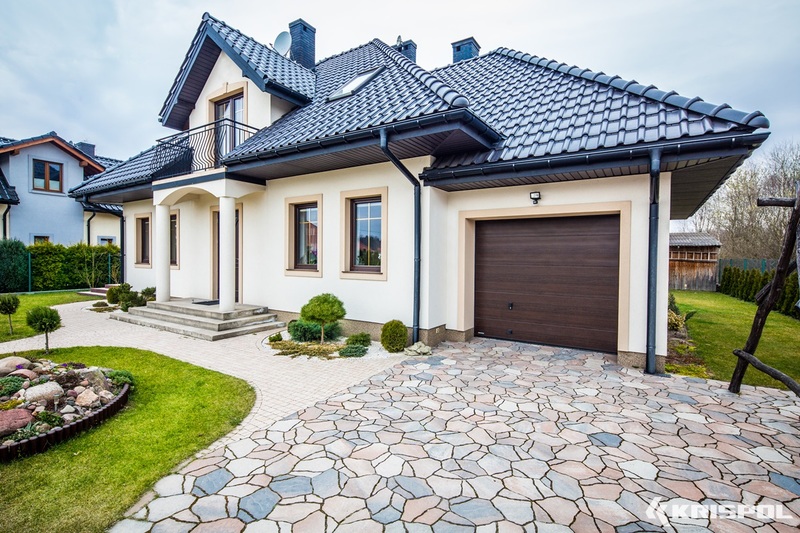 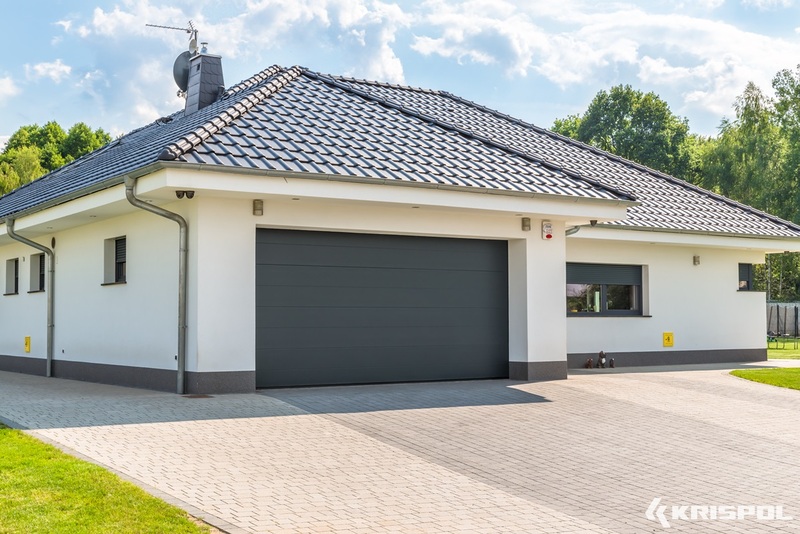 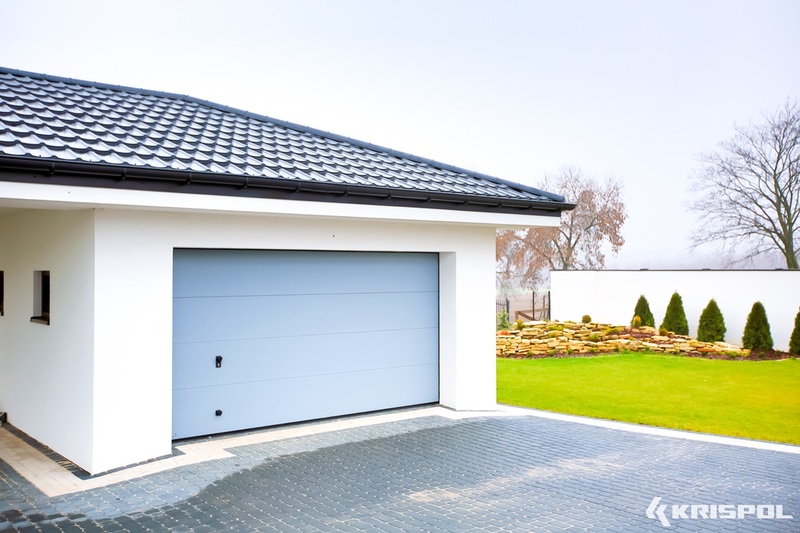 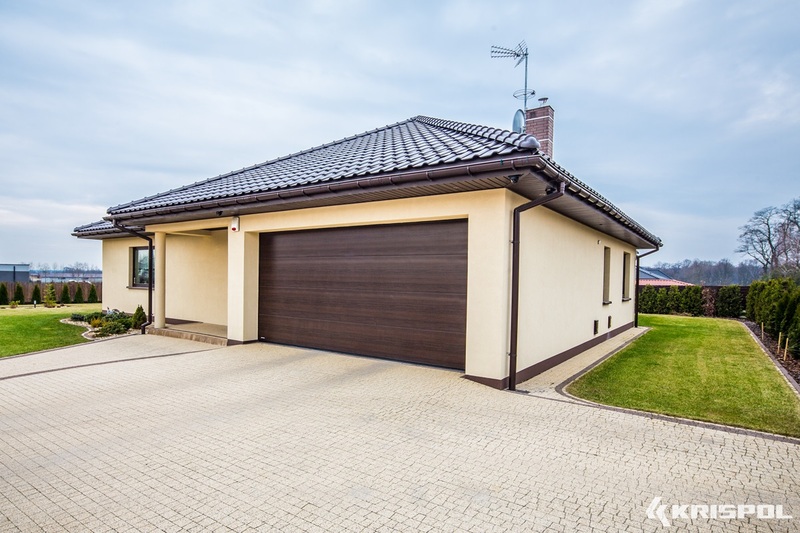 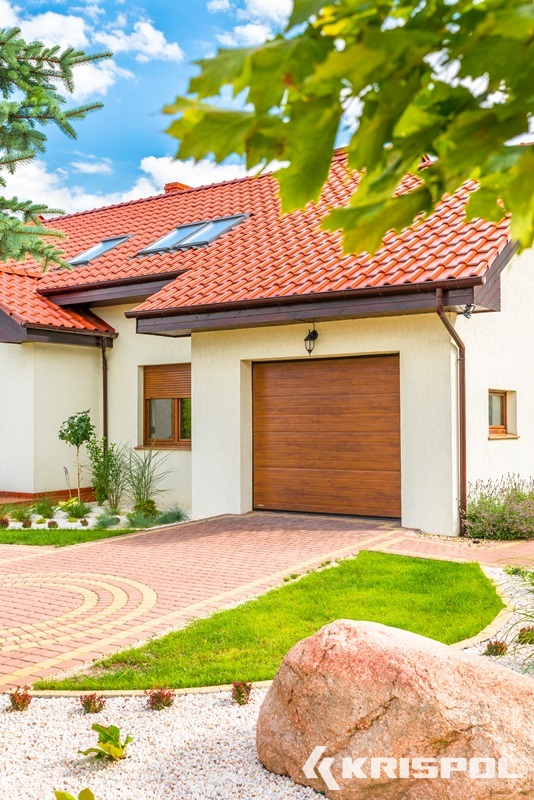 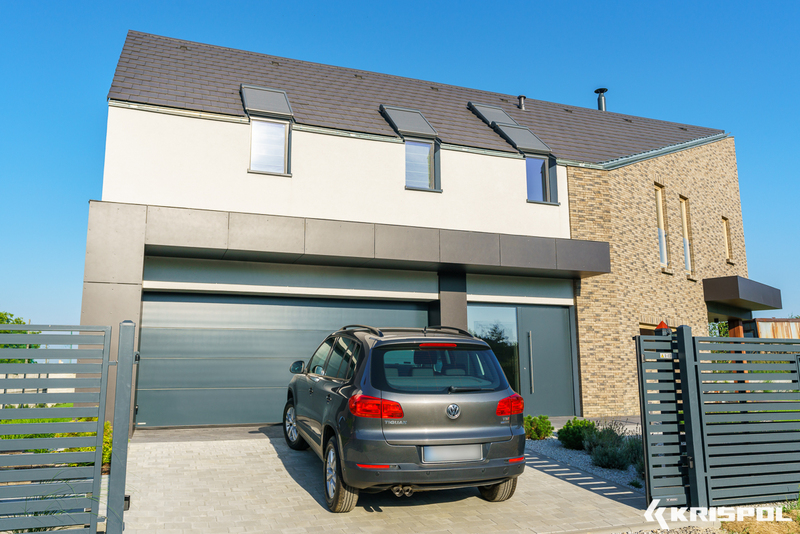 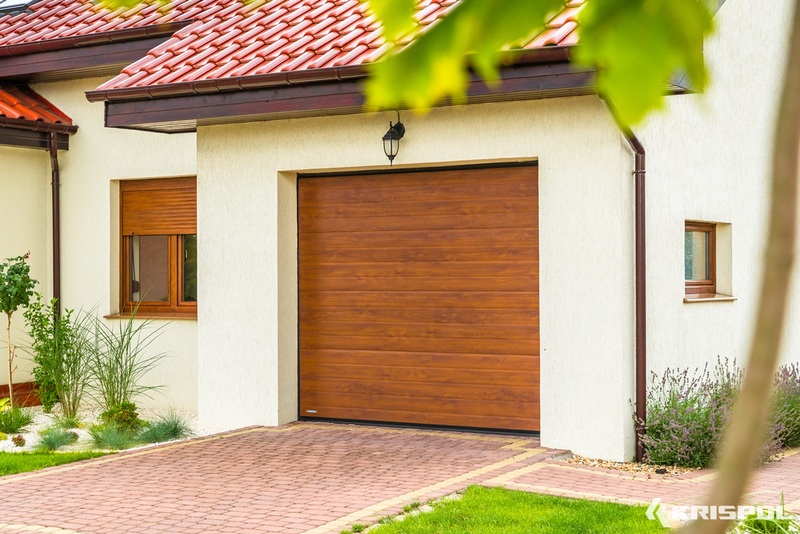 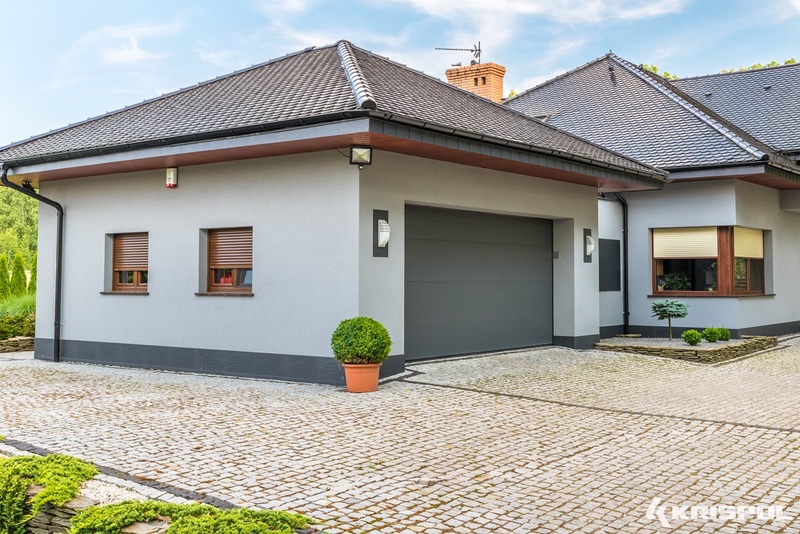 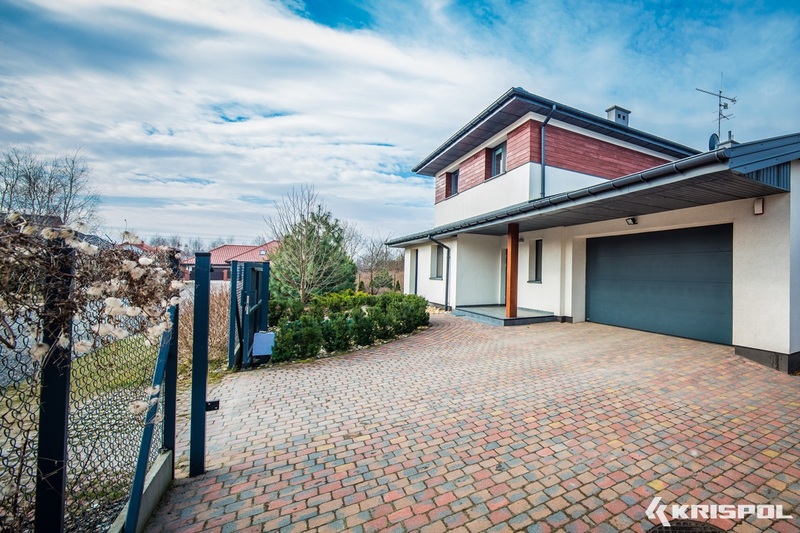 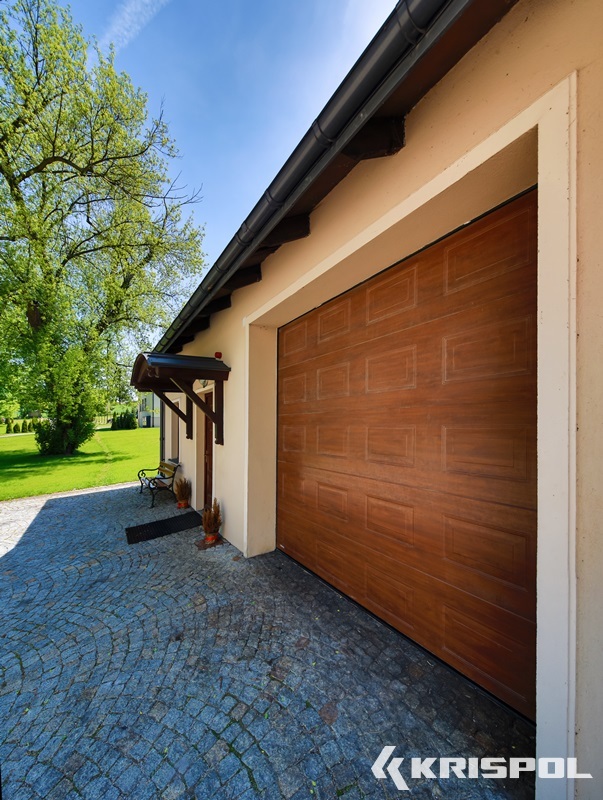 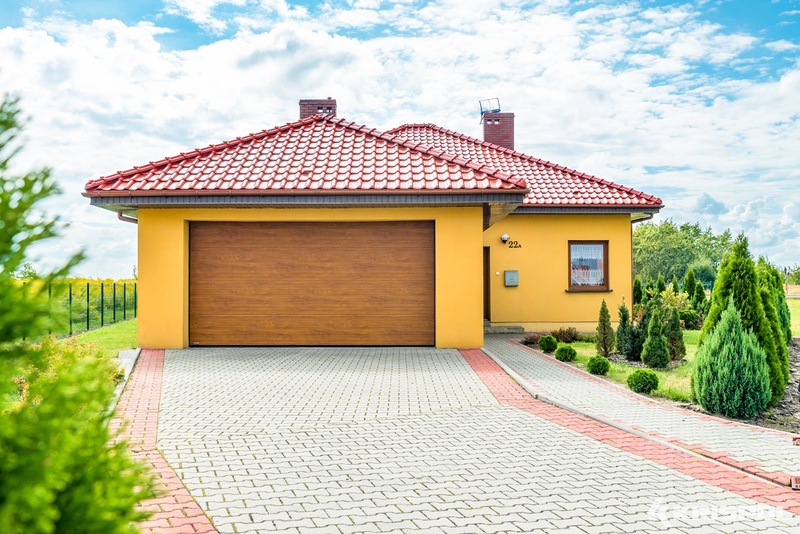 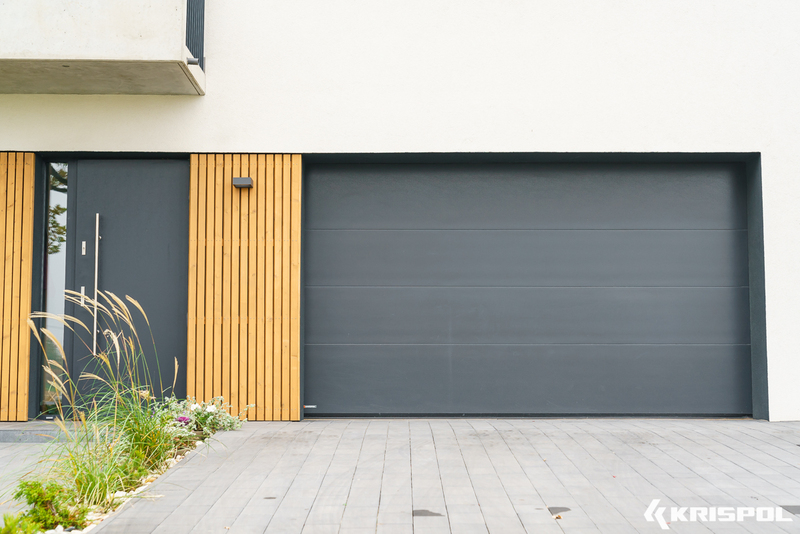 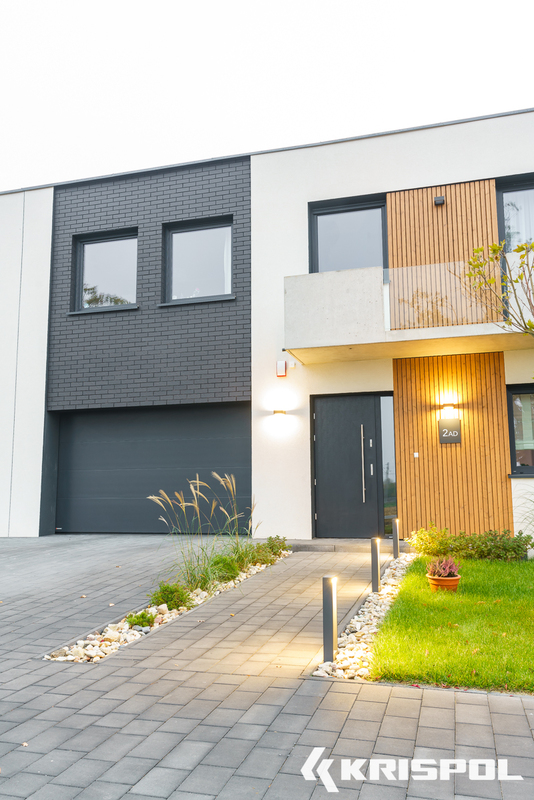 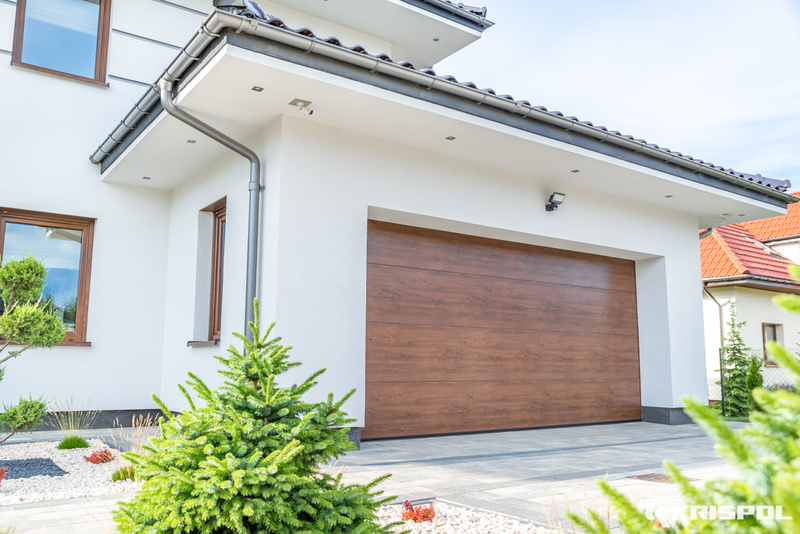 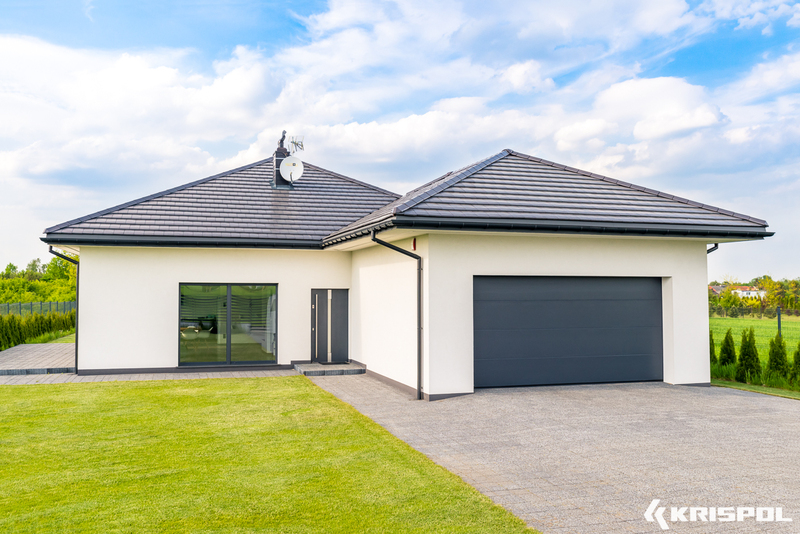 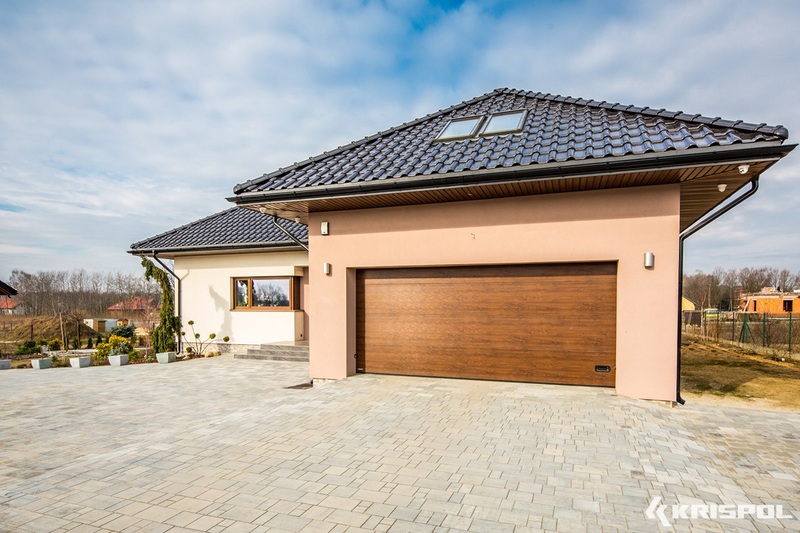 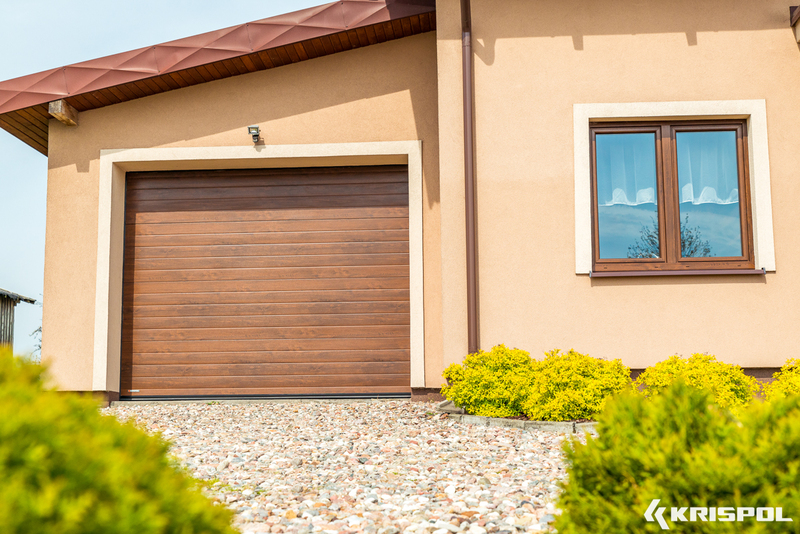 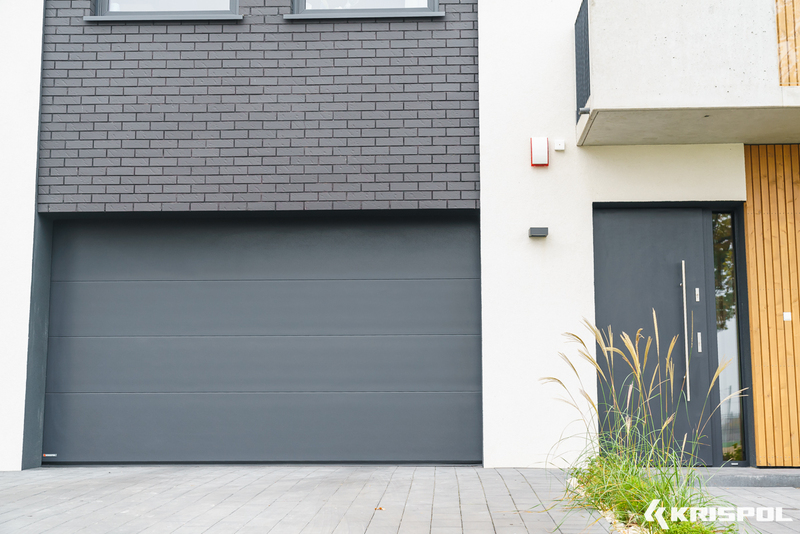 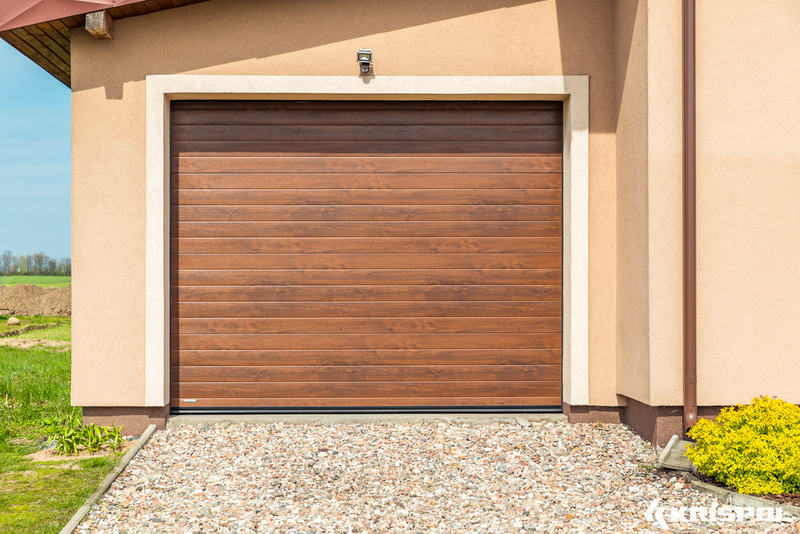 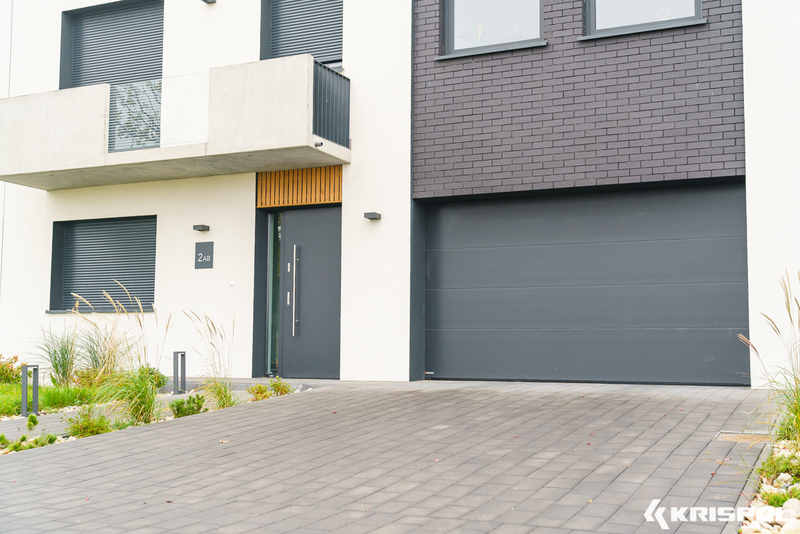 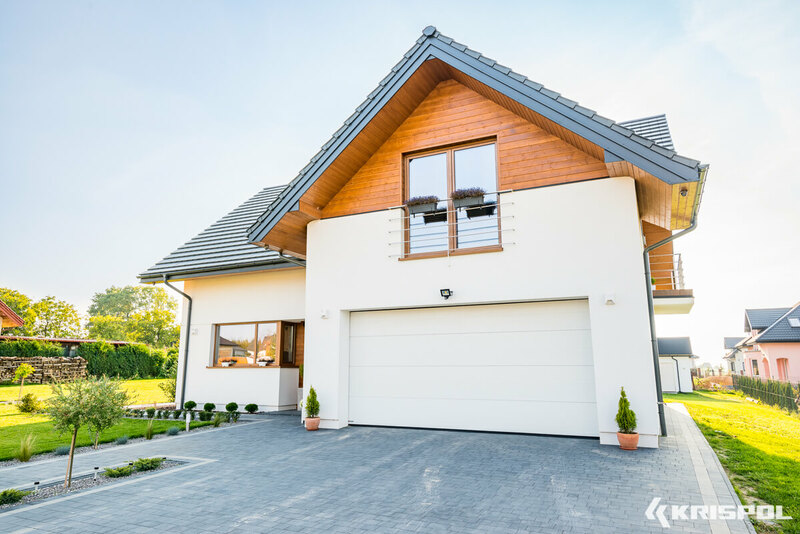 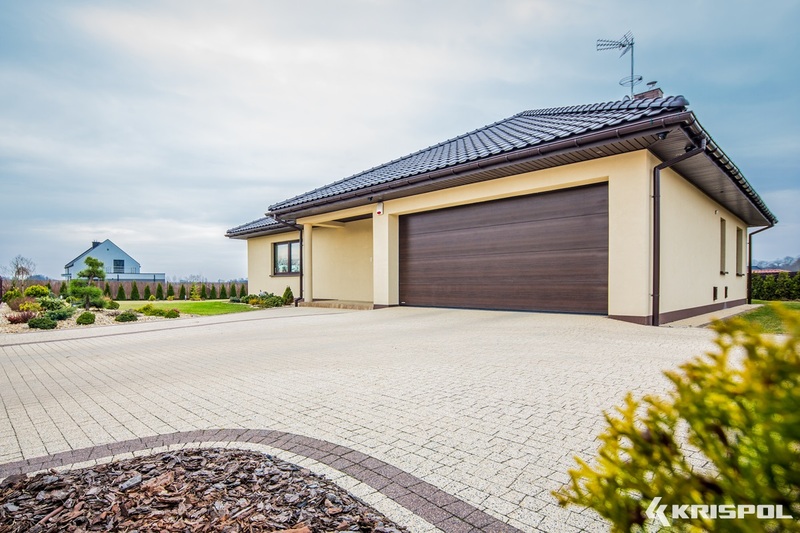 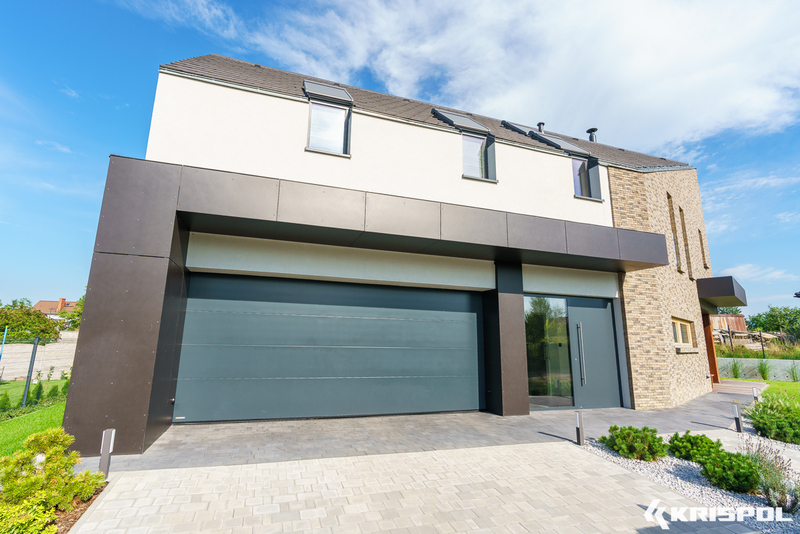 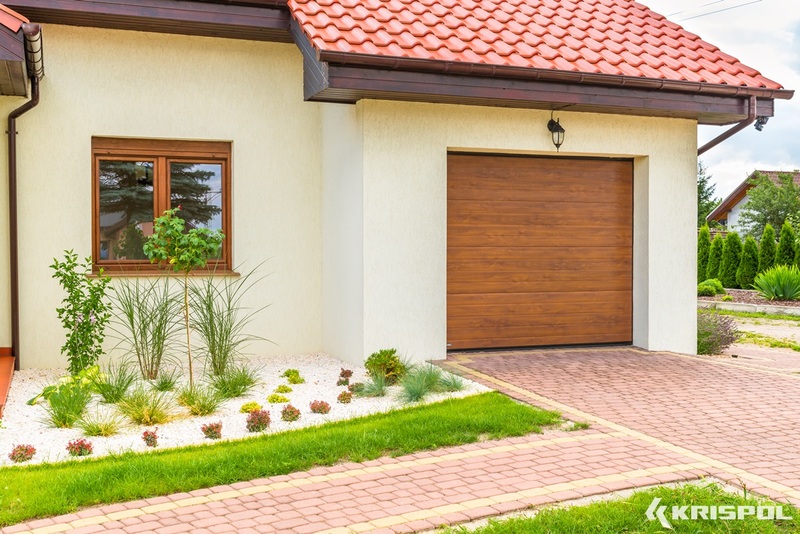 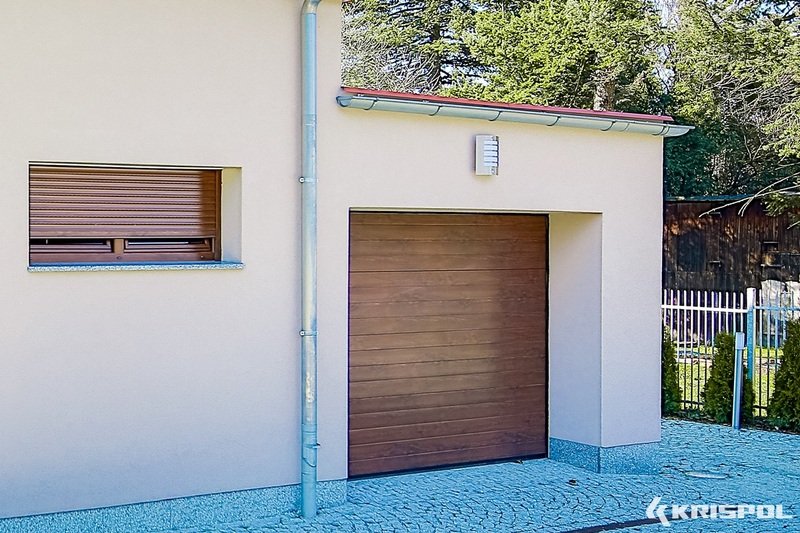 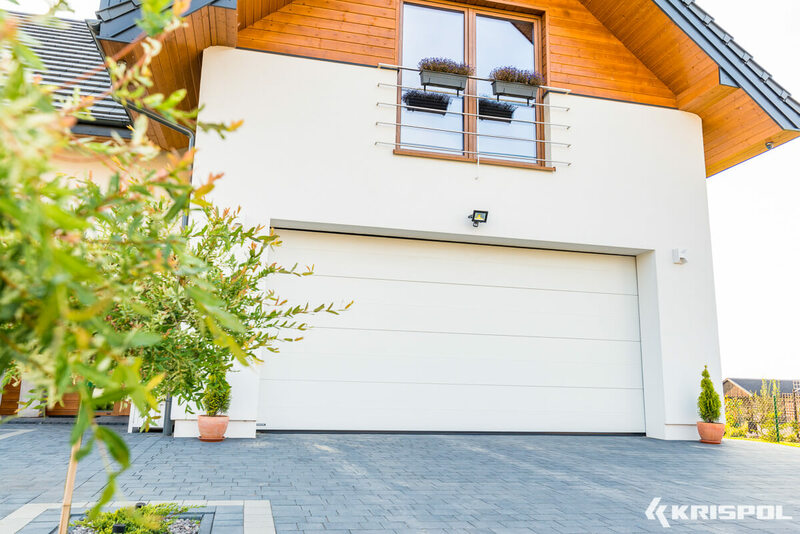 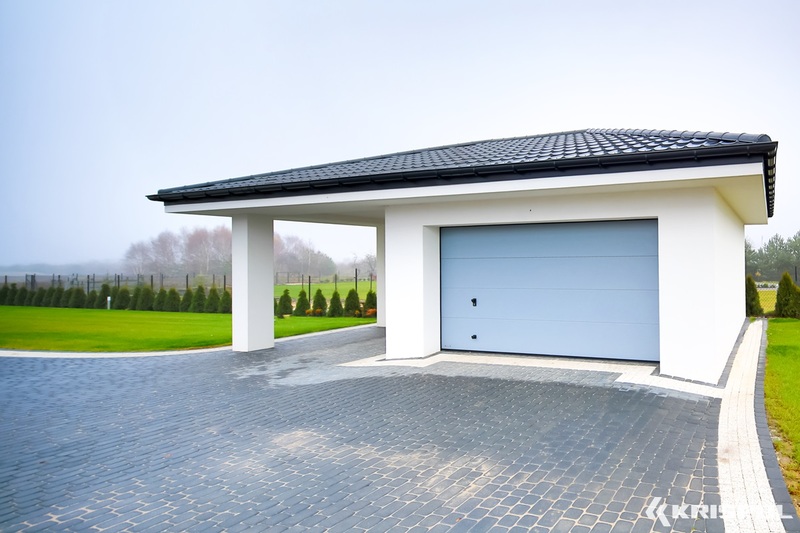 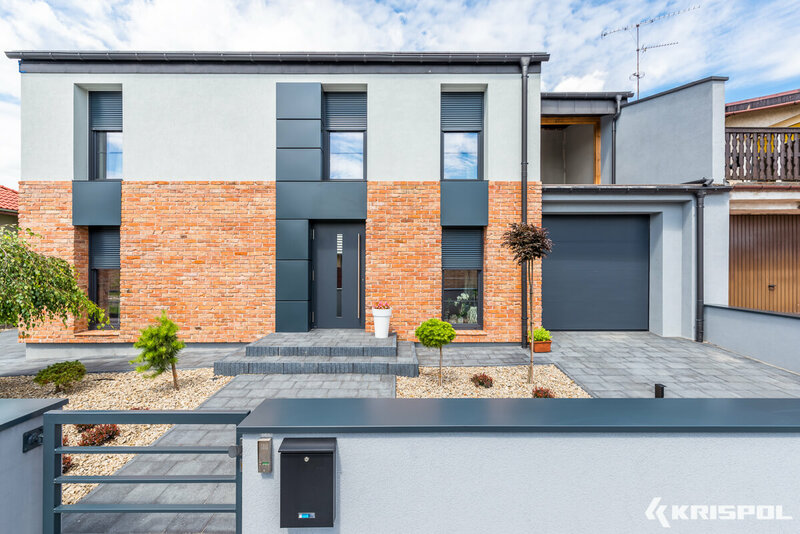 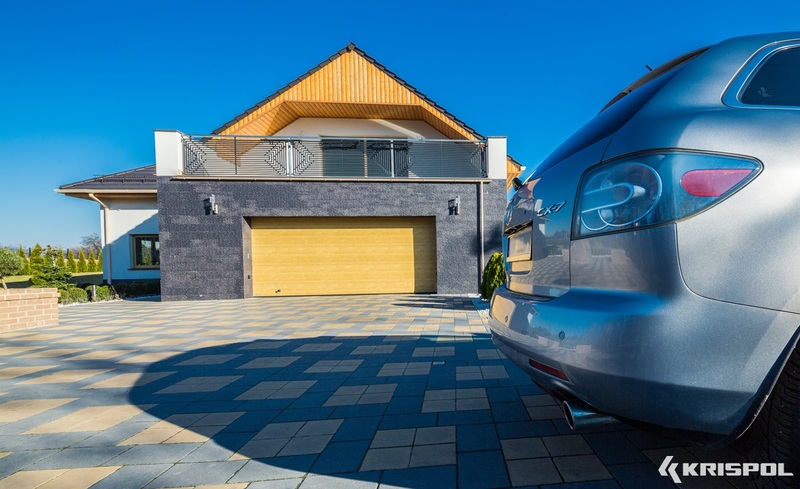 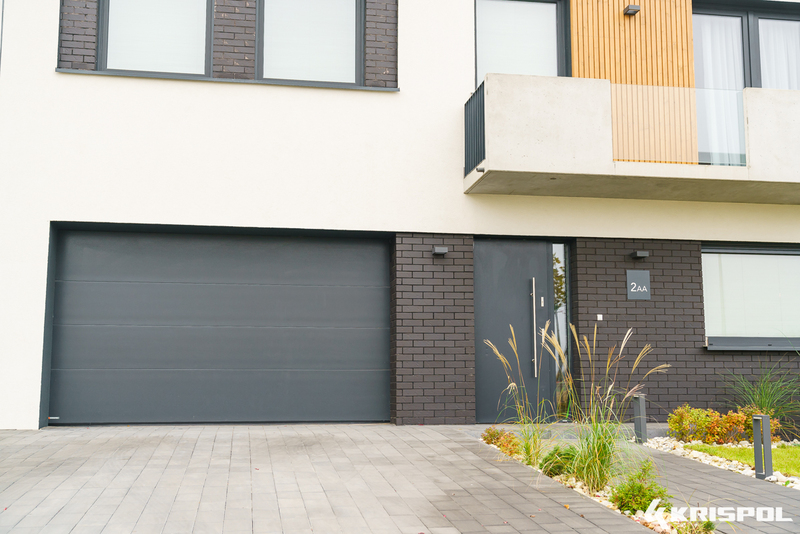 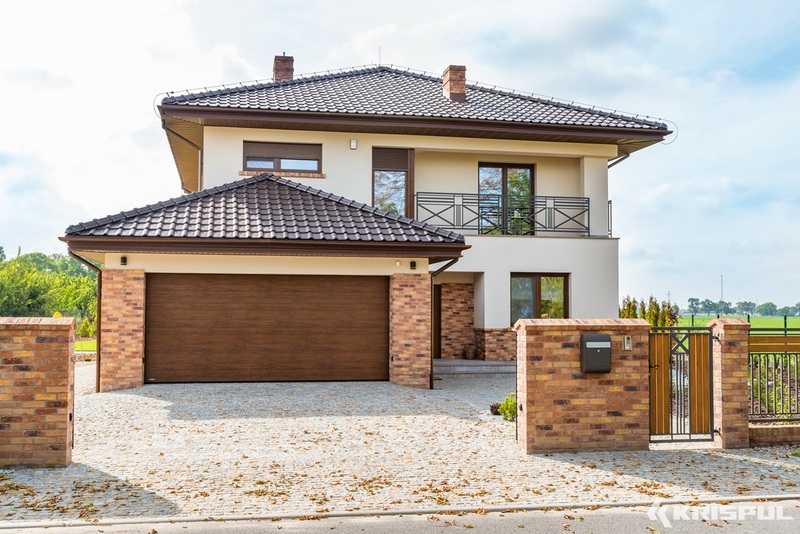 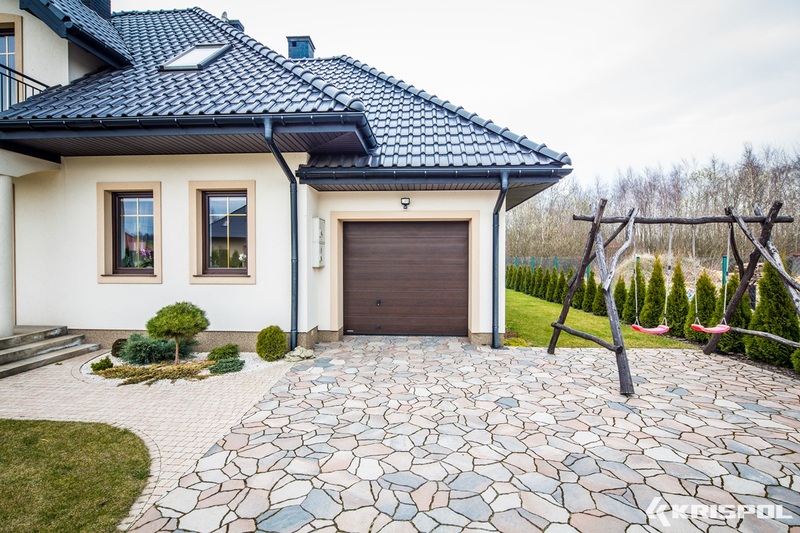 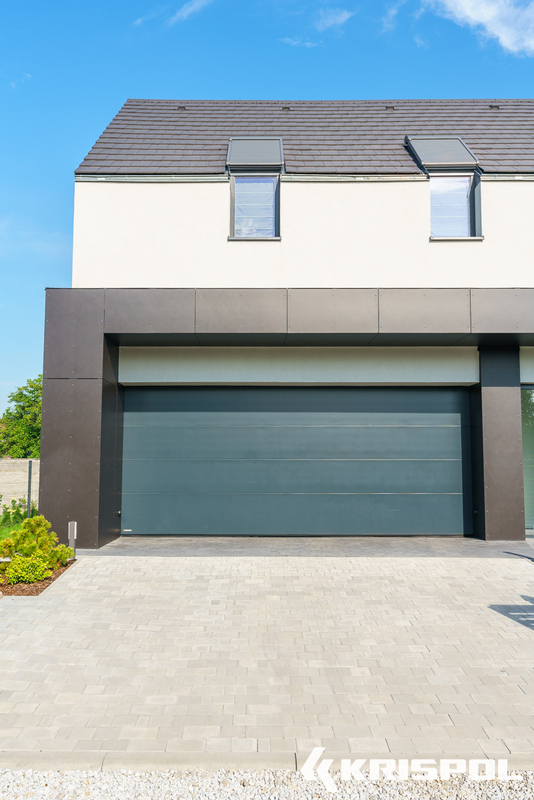 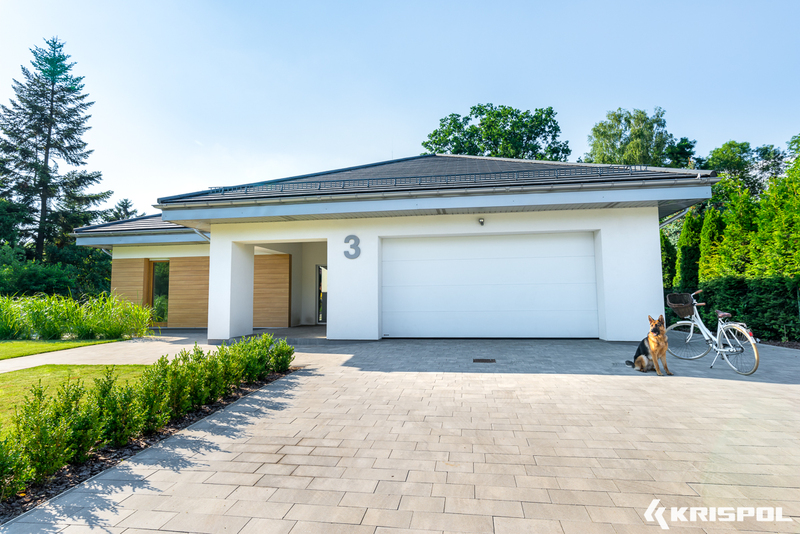 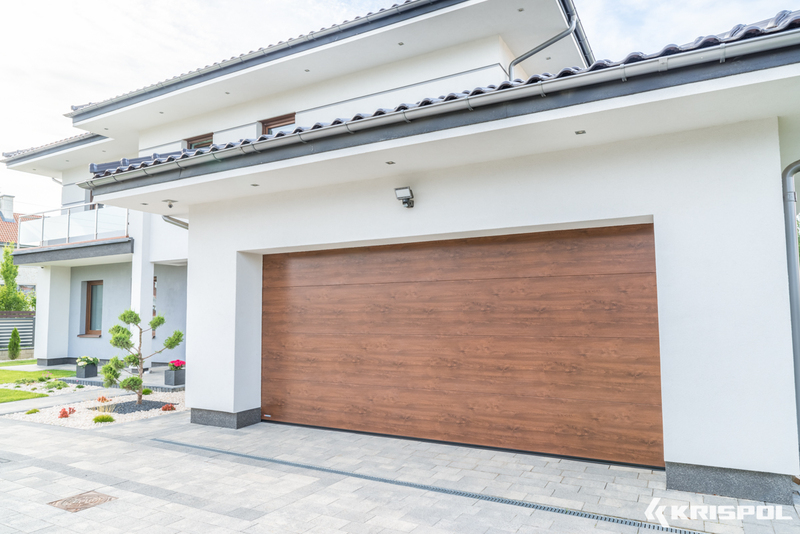 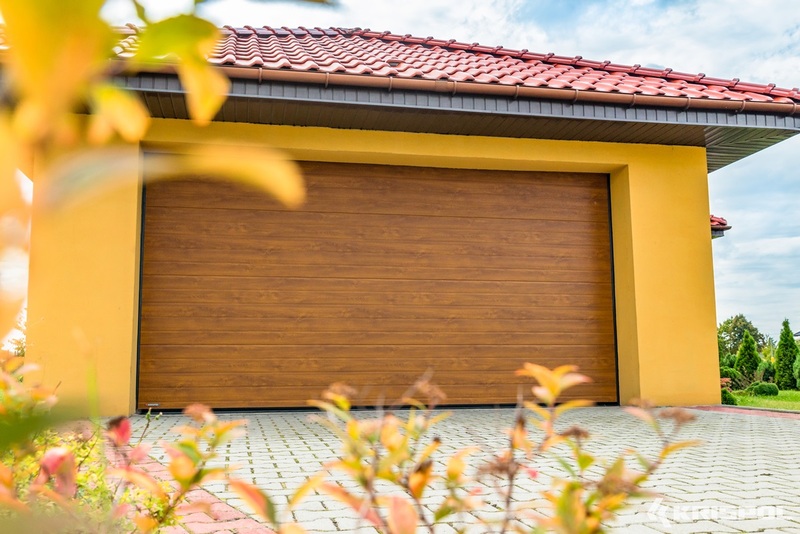 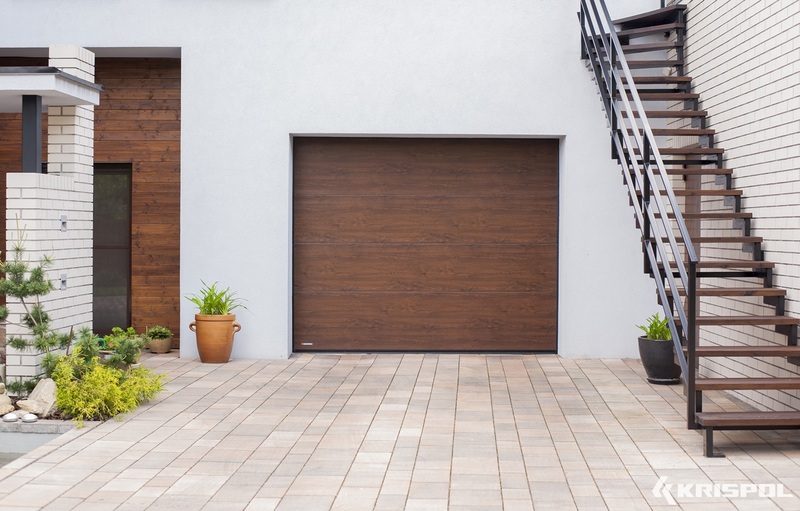 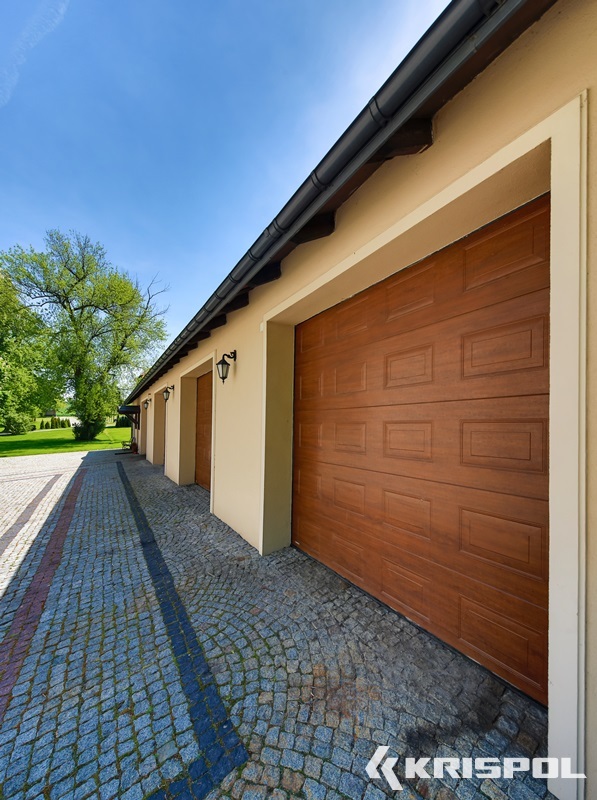 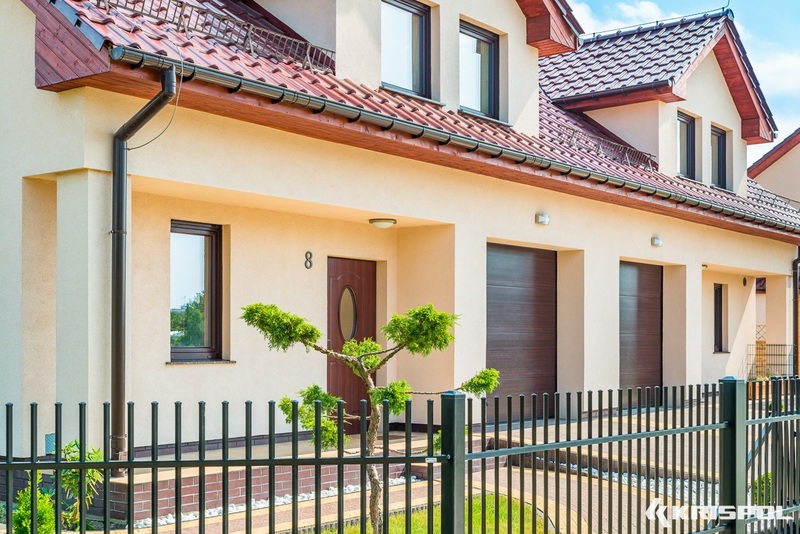 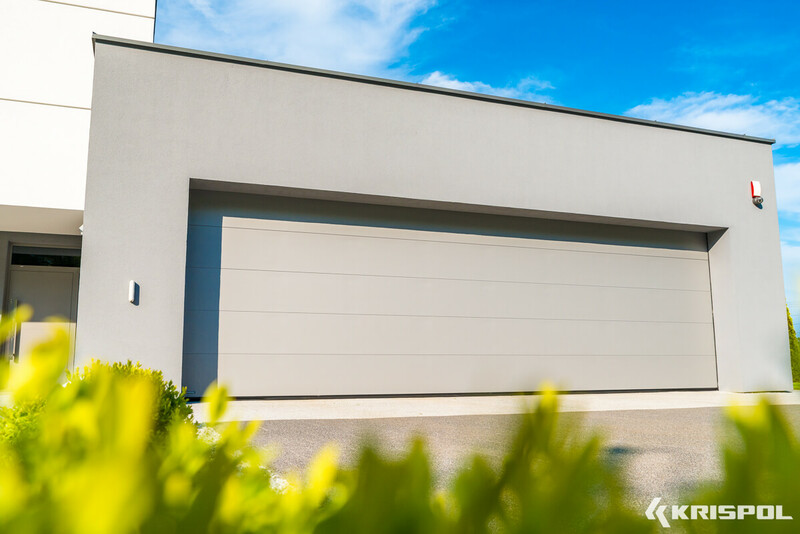 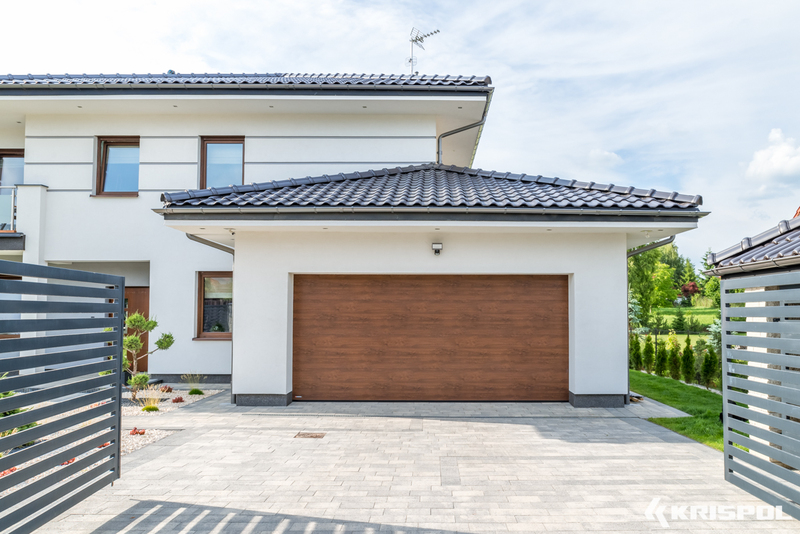 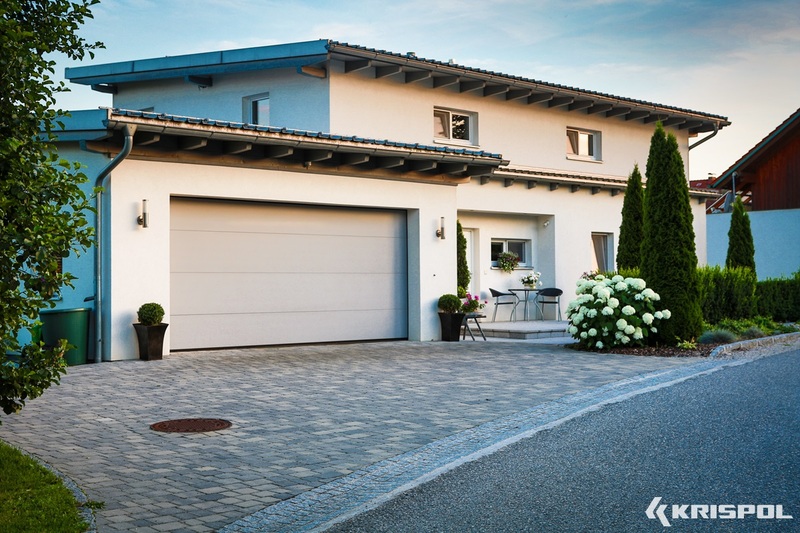 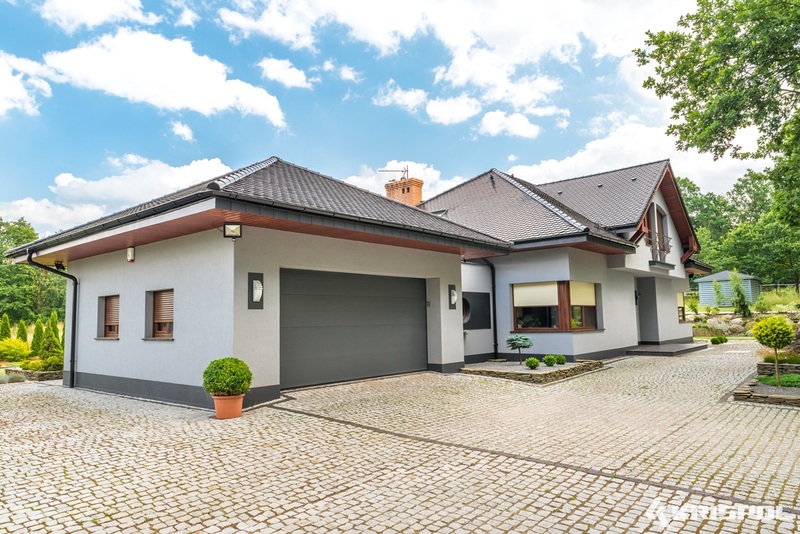 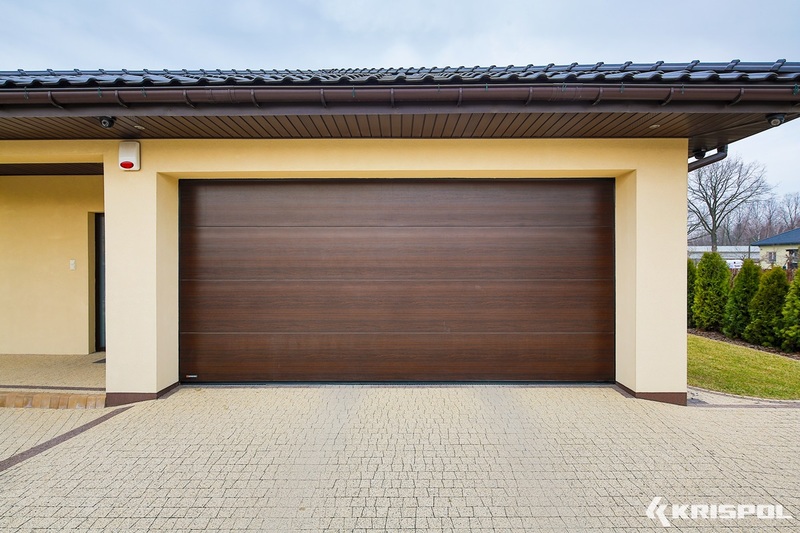 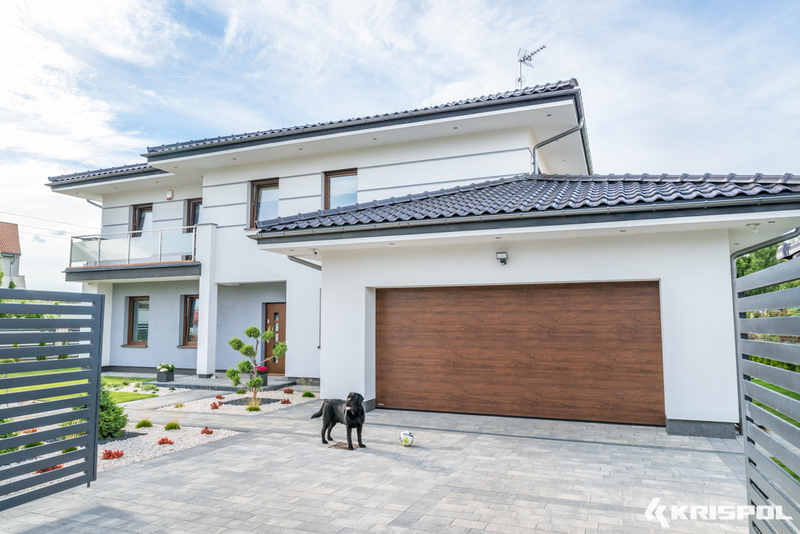 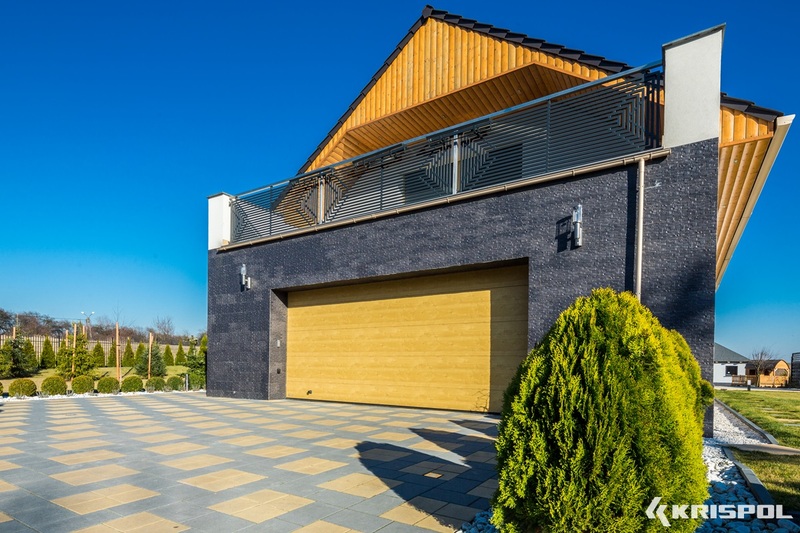 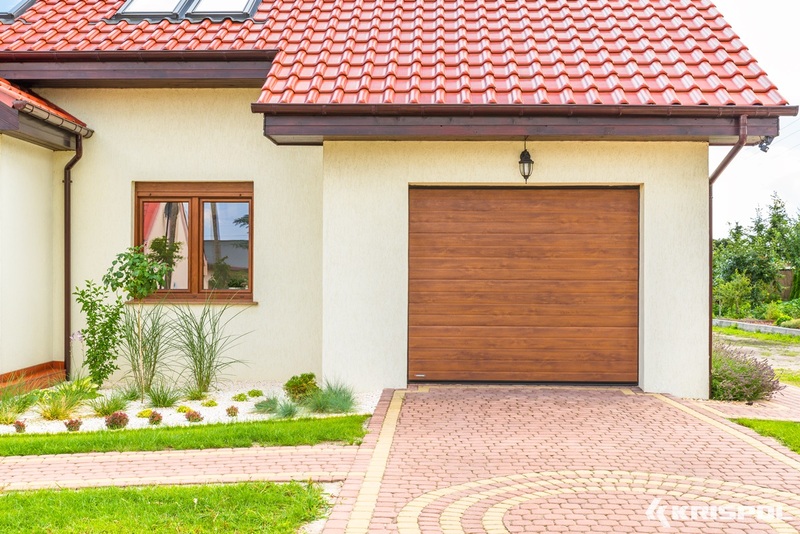 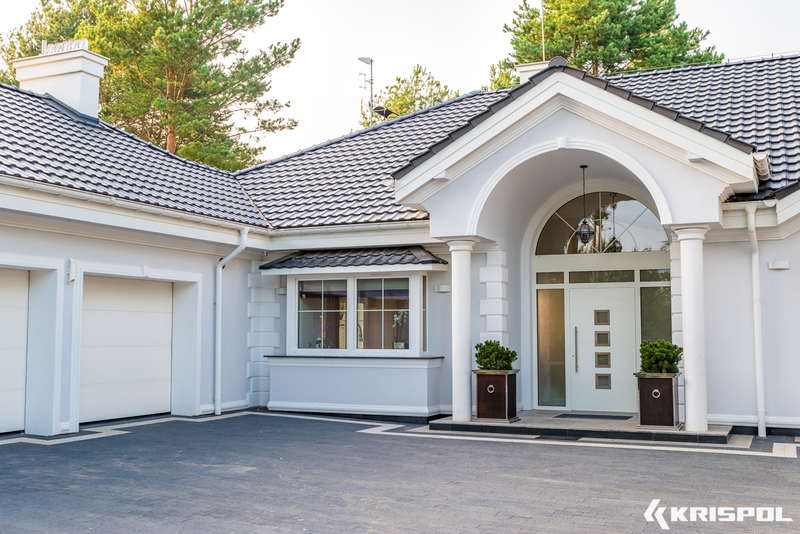 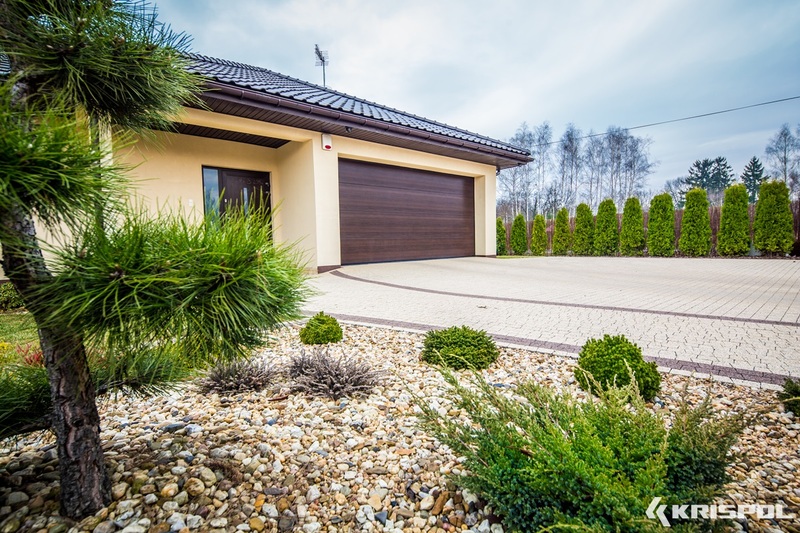 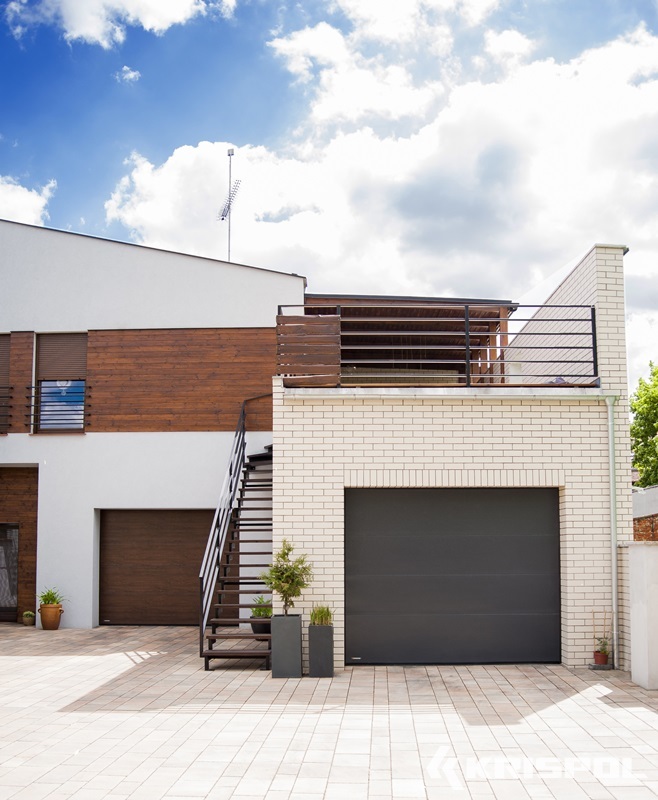 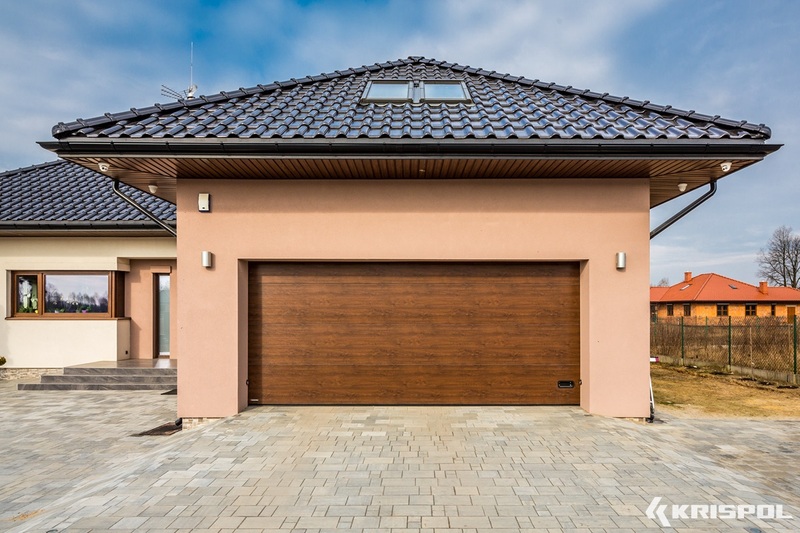 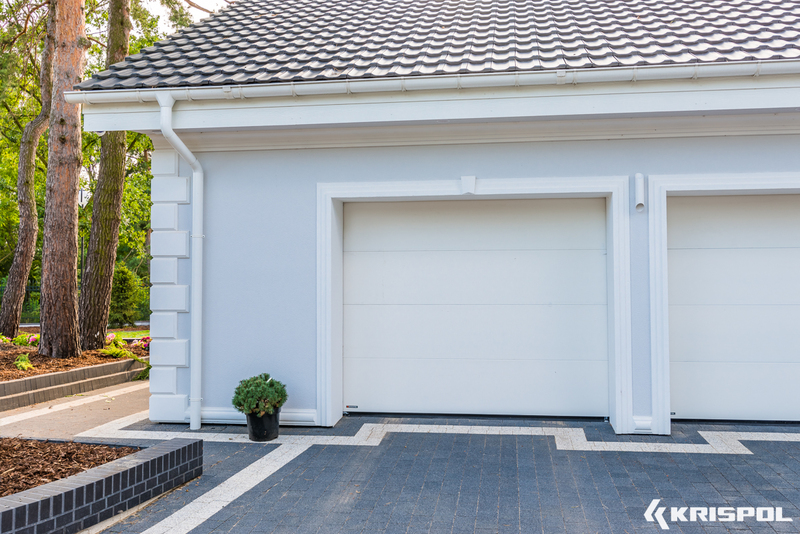 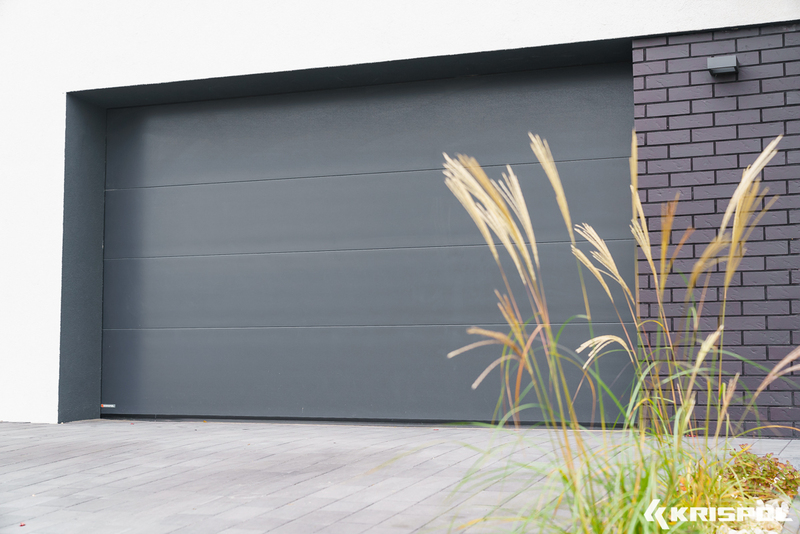 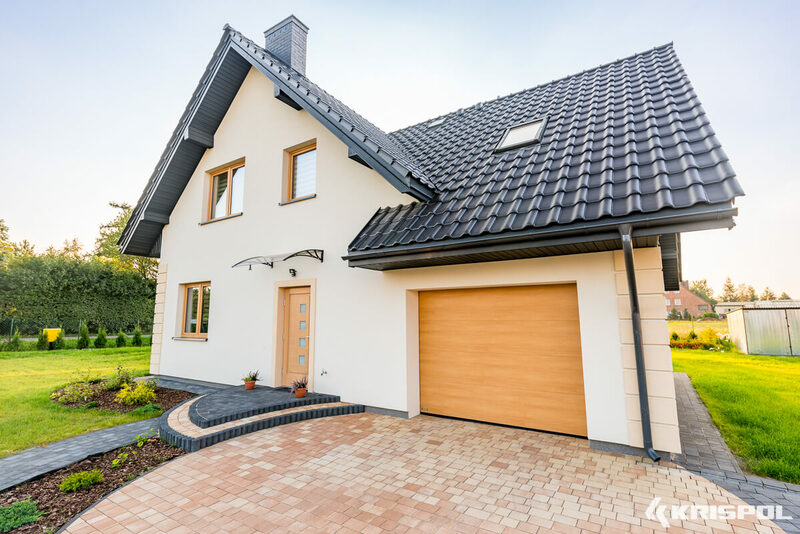 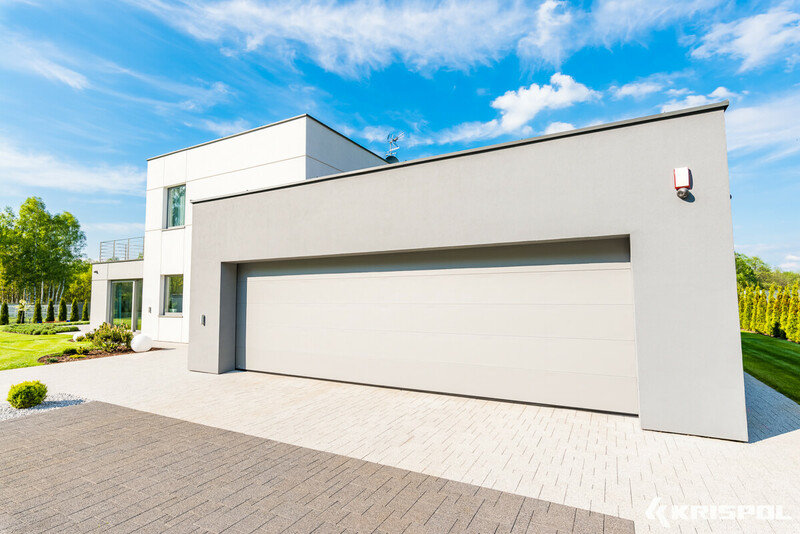 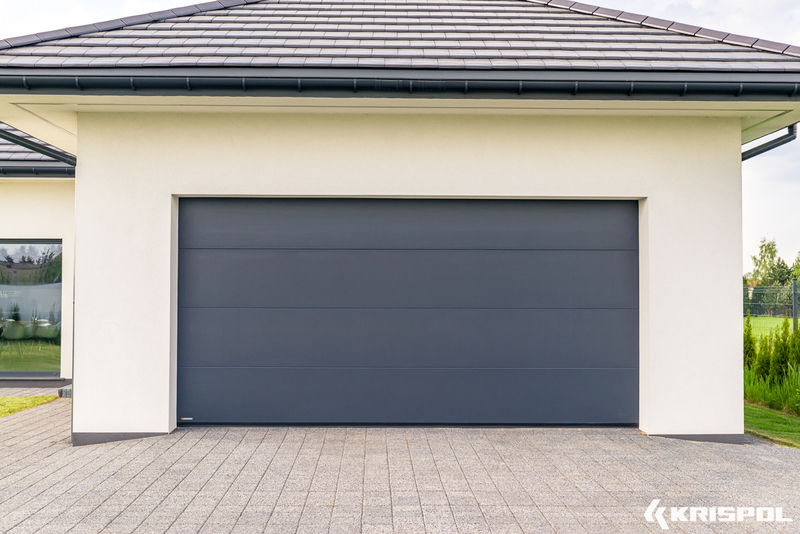 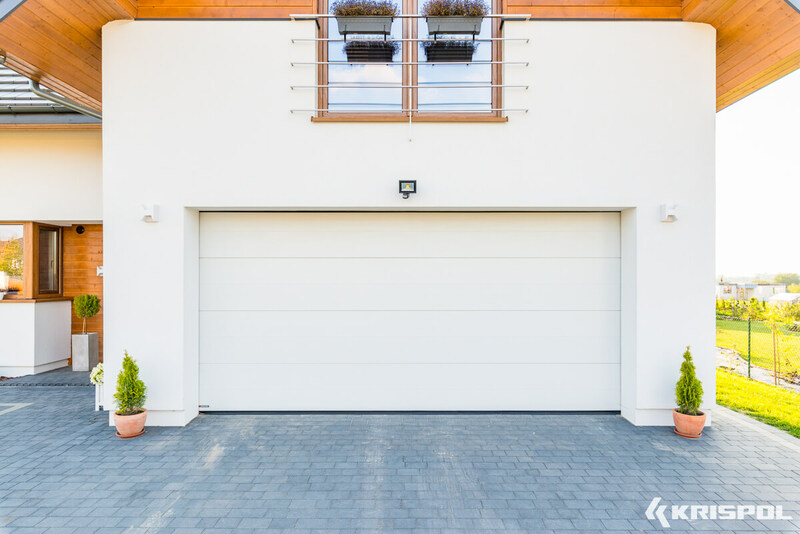 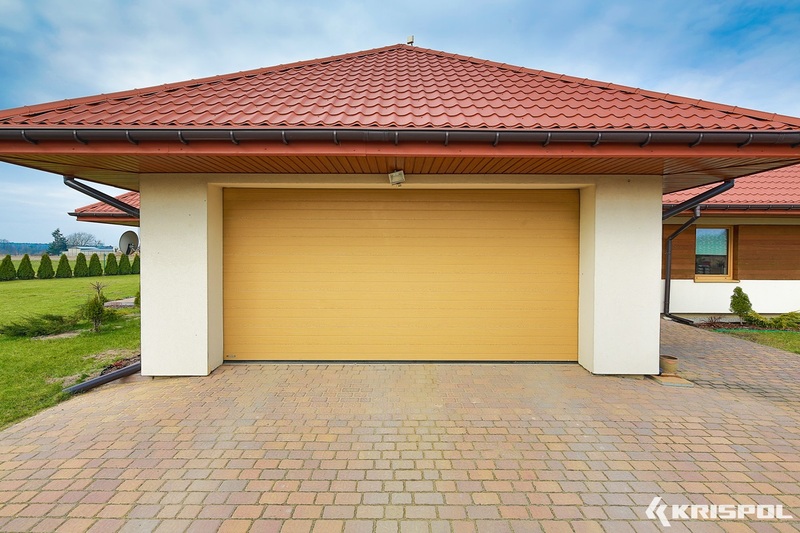 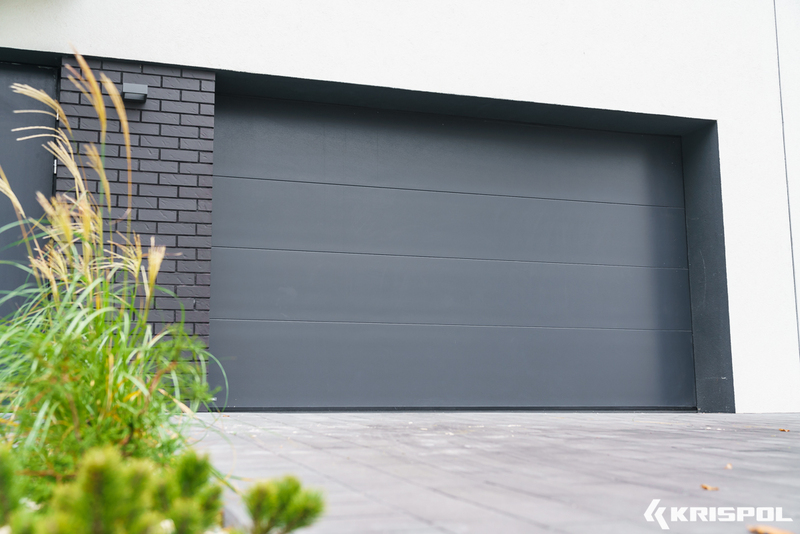 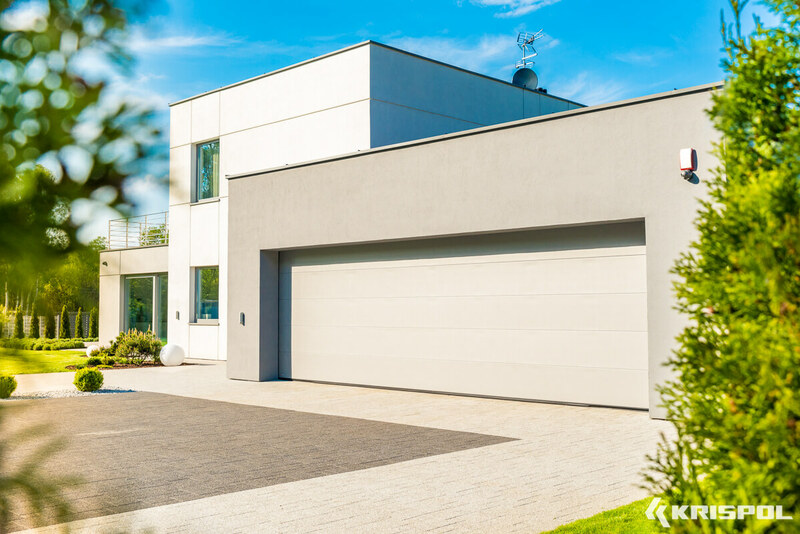 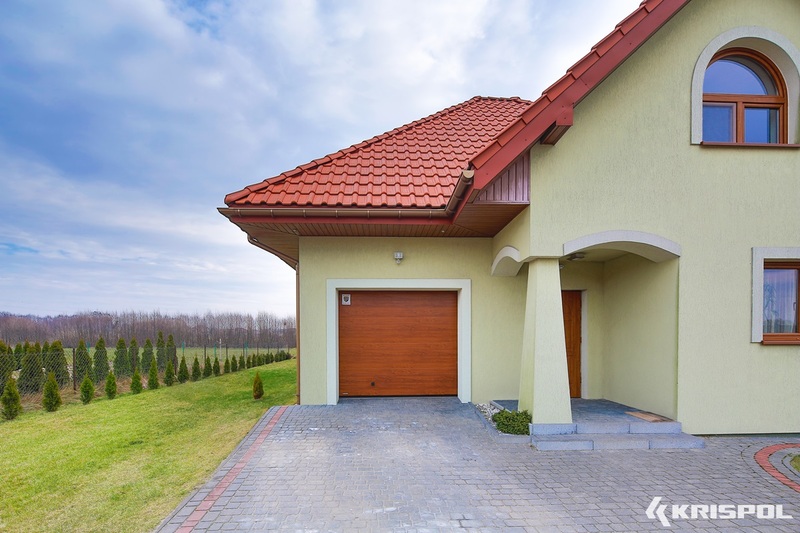 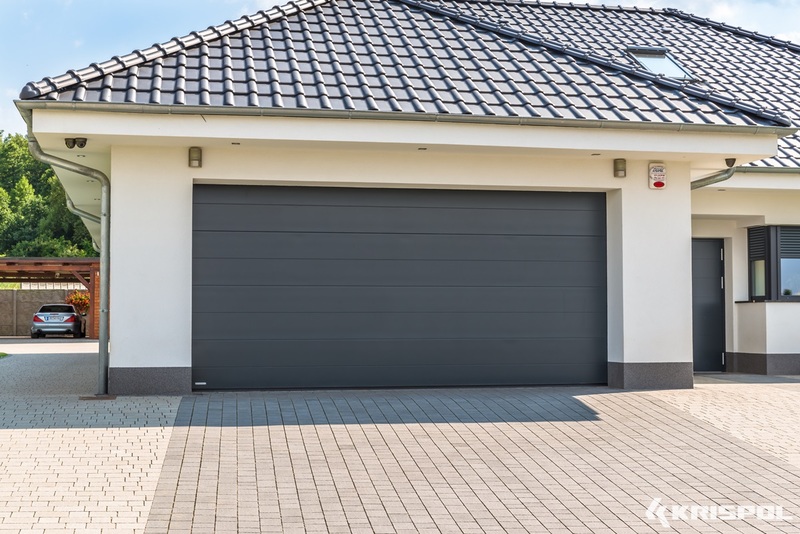 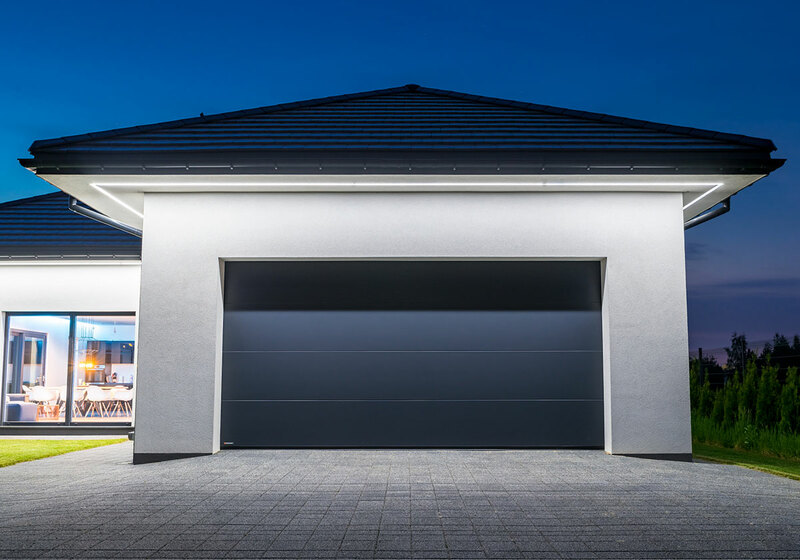 Side garage doors, matching the main door in colour and embossment type, provide an access to the garage without the necessity of opening the door. 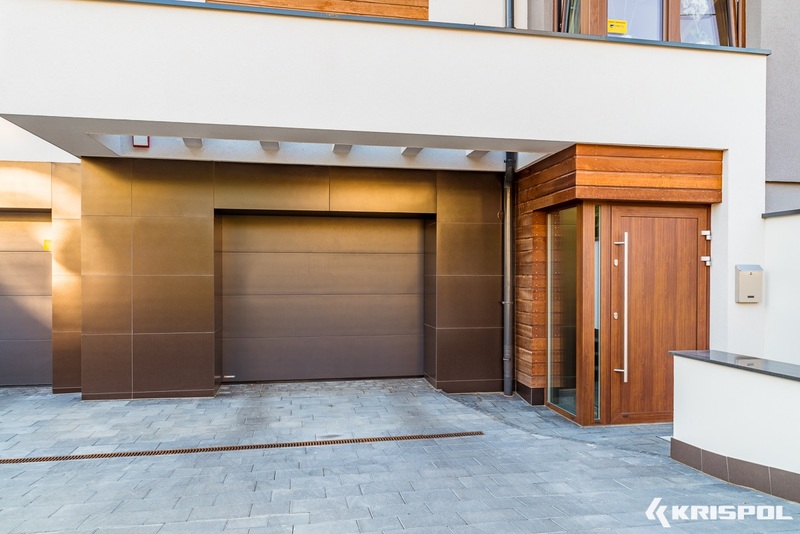 The possibility of veneering almost all parts of the doors and the possibility of using decorative elements matching the doors provide an aesthetic finishing of the door façade. 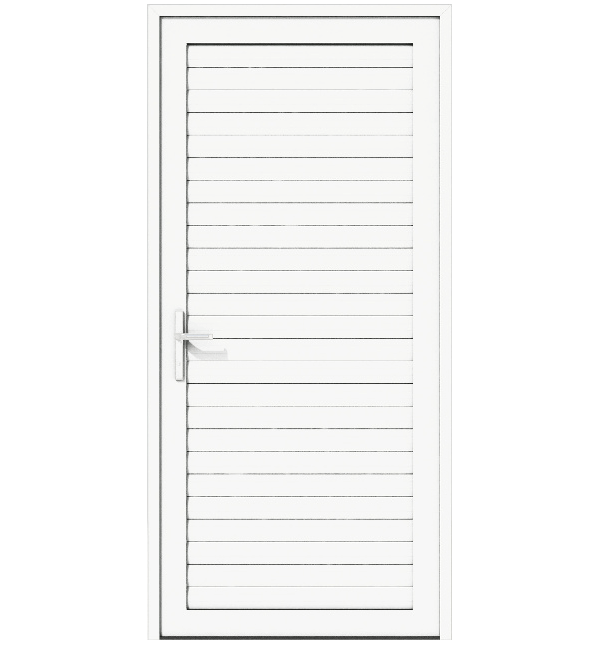 The door is available in one and two leaf option.